Actually, nothing in any of these photos or any post you may find here is secret or hidden but most people never see these things, and that’s too bad. 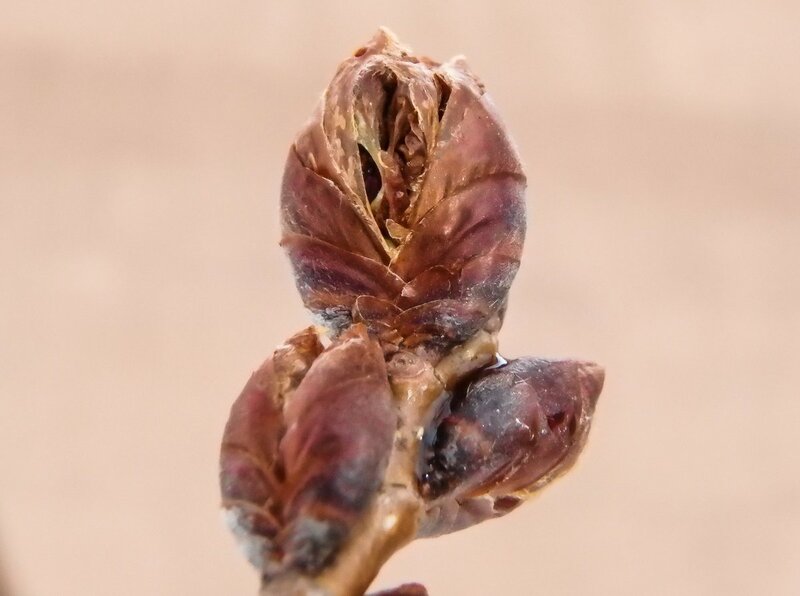 Just look at how beautiful this young shagbark hickory bud (Carya ovata) was after it opened. A tree full of them looks like a tree full of beautiful flowers and they’re right there in plain sight, so I hope you’ll look for them. 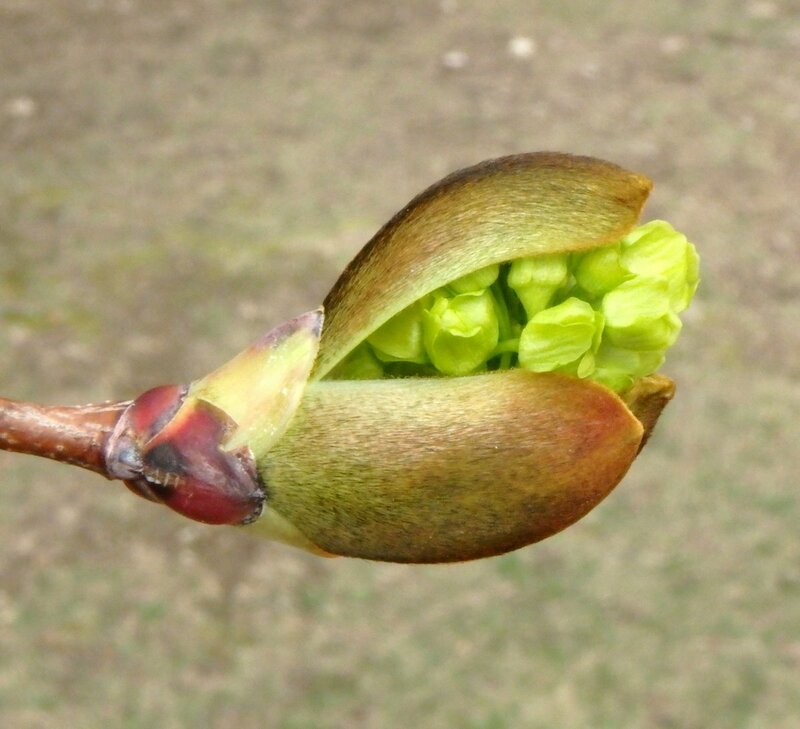 Every bit as beautiful but not quite as colorful is a spring beech bud (Fagus grandifolia) opening. A tree full of these looks like it has been festooned with tiny angel wings and they are one of my favorite things to see in spring. But you have to watch closely because they don’t stay like this for more than a day. 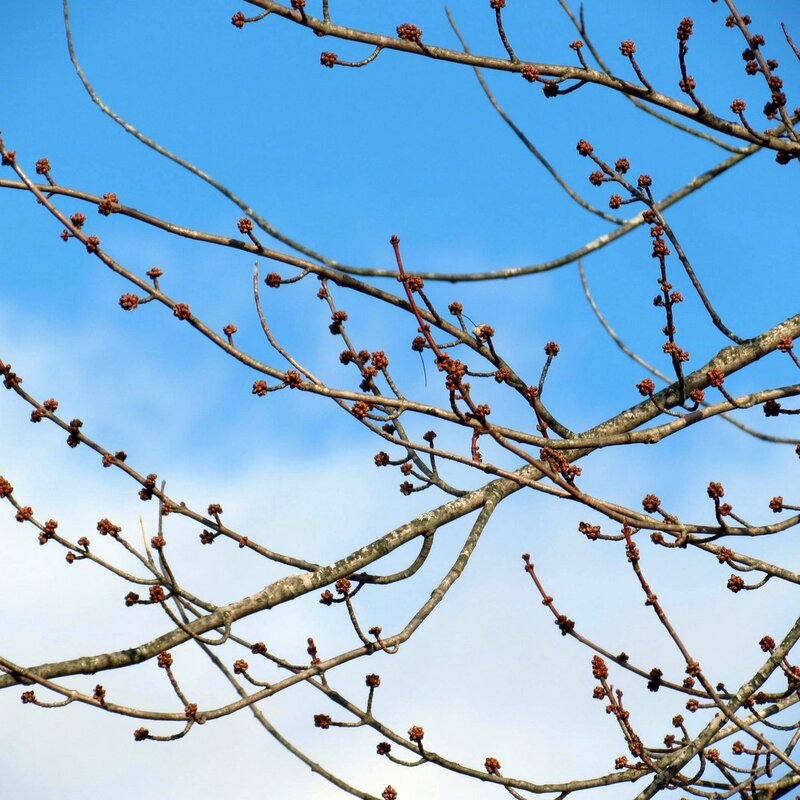 A good sign that beech bud break is about to happen is when the normally small, straight buds grow longer and curl like a rainbow. 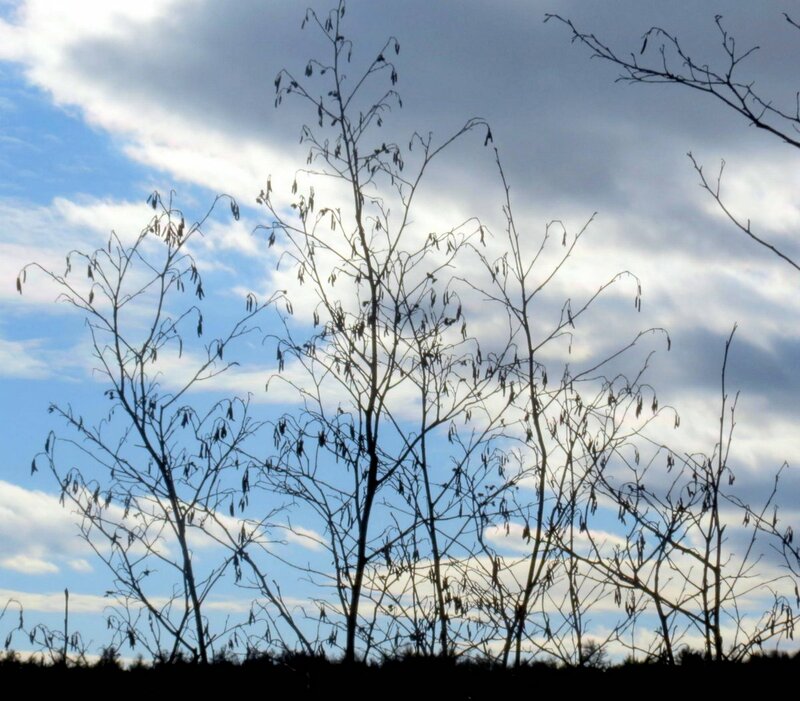 Once that happens they are ready to break and let the leaves unfurl. 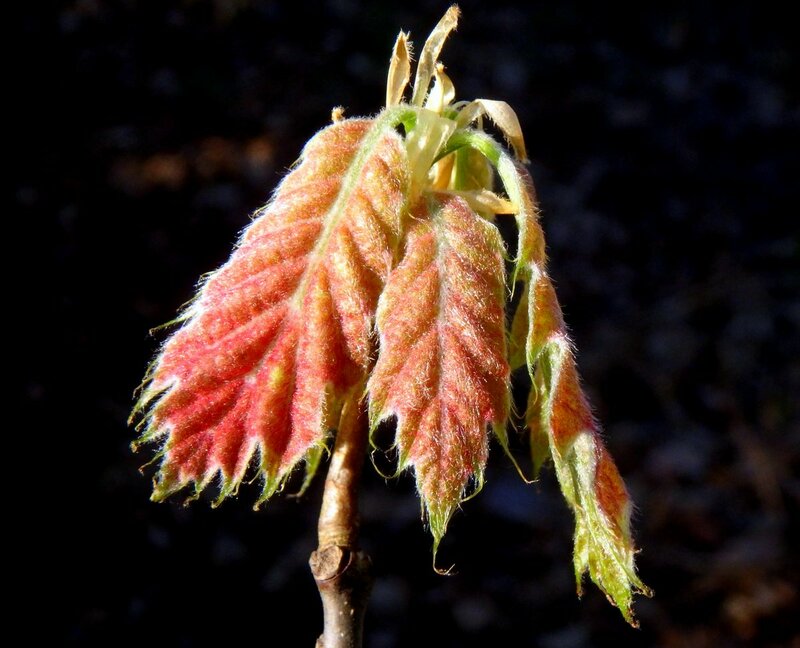 A new beech leaf still has some of the delicate silver hairs left from its time in the bud, but it loses them quickly. The orange turns to green quickly too, and then the magic ends for another year. 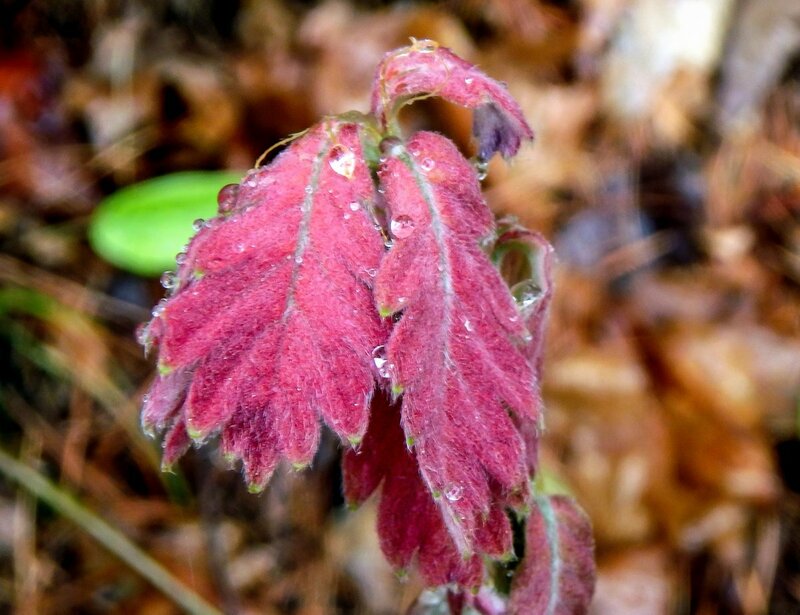 I saw some beautiful young red buckeye leaves on the Central Ohio Nature blog, a link to which you can find over there on the right in the Favorite Links section. 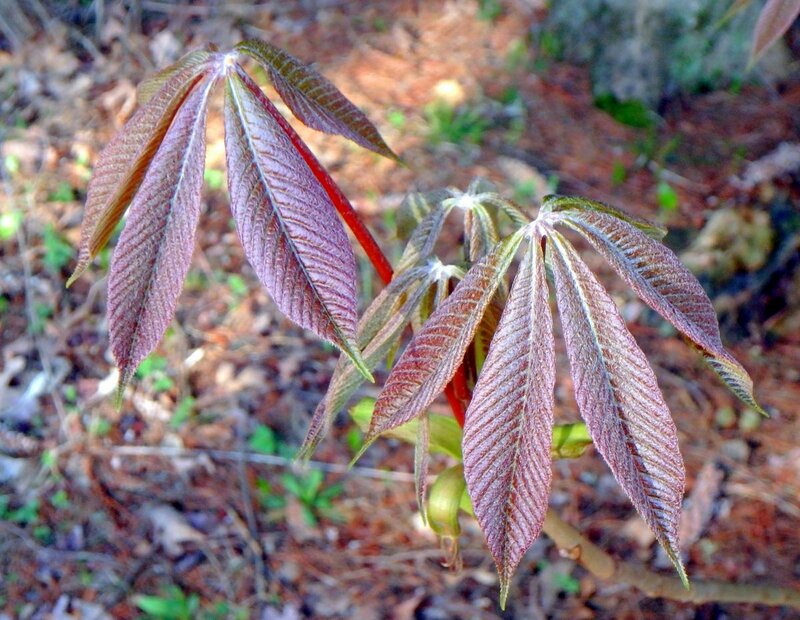 I don’t have the same tree but I do have a bottlebrush buckeye and this photo is of its leaves, which are more of a rosy brown / brick red color. …including hot pink. They also shed water quickly. 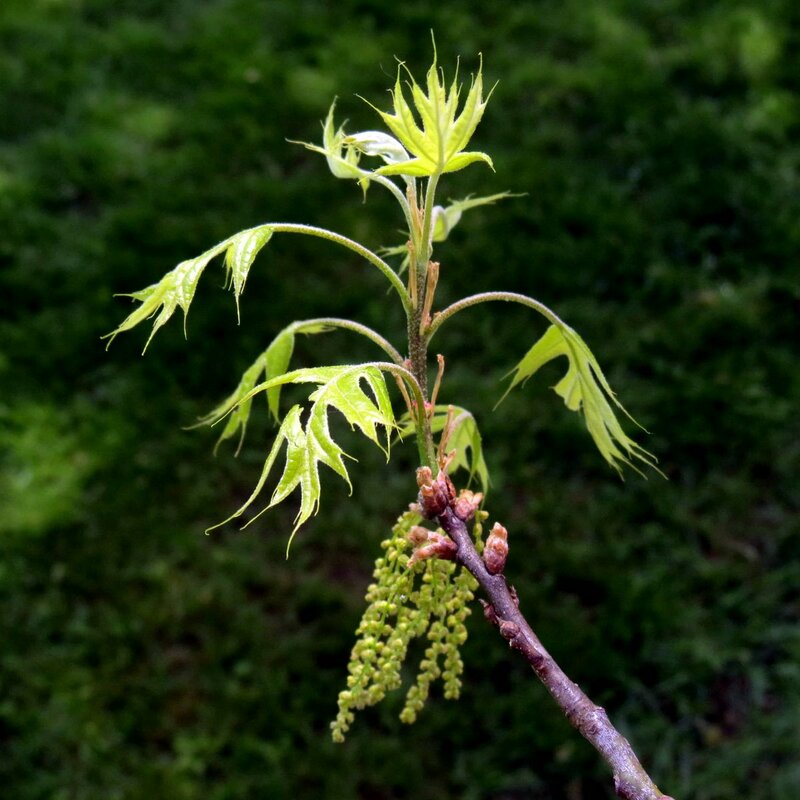 Some oaks are already flowering. According to my color finding software this maple leaf also had pink in it, along with plum purple and fire brick red. I don’t see those colors but I believe the software is accurate. 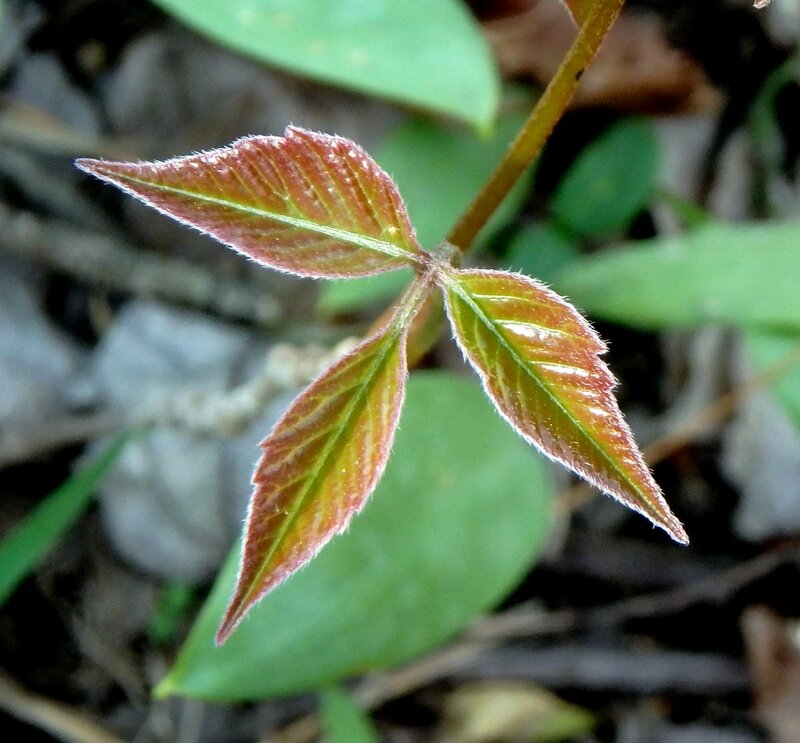 New poison ivy leaves (Toxicodendron radicans) are often a deep maroon color but these were green with a white fringe. I’ve noticed this year that many new spring leaves that would normally wear various shades of red and bronze are instead shades of green. What this means I don’t know. They seem to want to get a jump on photosynthesizing. 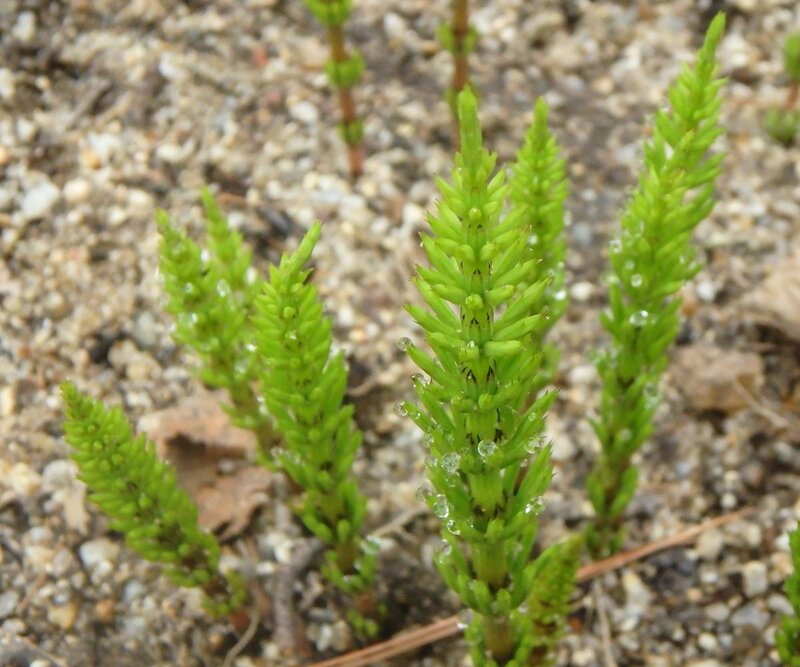 I checked on the field horsetails (Equisetum arvense) each day and there was no sign of them and then overnight there they were, hundreds of them. One little tap and what looks like clouds of pollen float off them but the “pollen” is actually a cloud of microscopic spores. 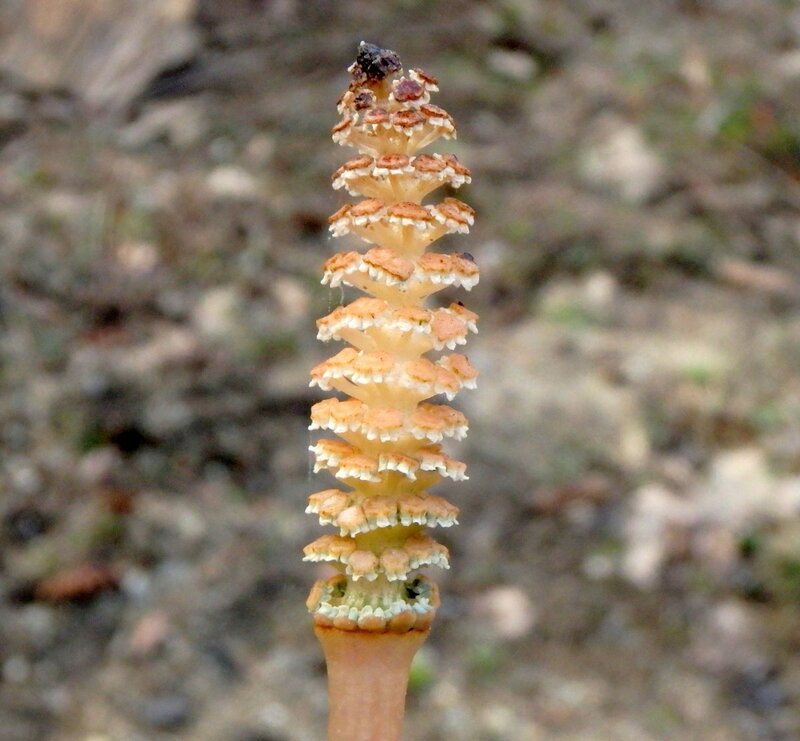 The fertile spore bearing stem of a field horsetail ends in a light brown cone shaped structure called a strobilus. Since it doesn’t photosynthesize at this point in its development the plant has no need for chlorophyll so most of it is a pale whitish color. When it’s ready to release spores the cone opens to reveal tiny, mushroom shaped sporangiophores. 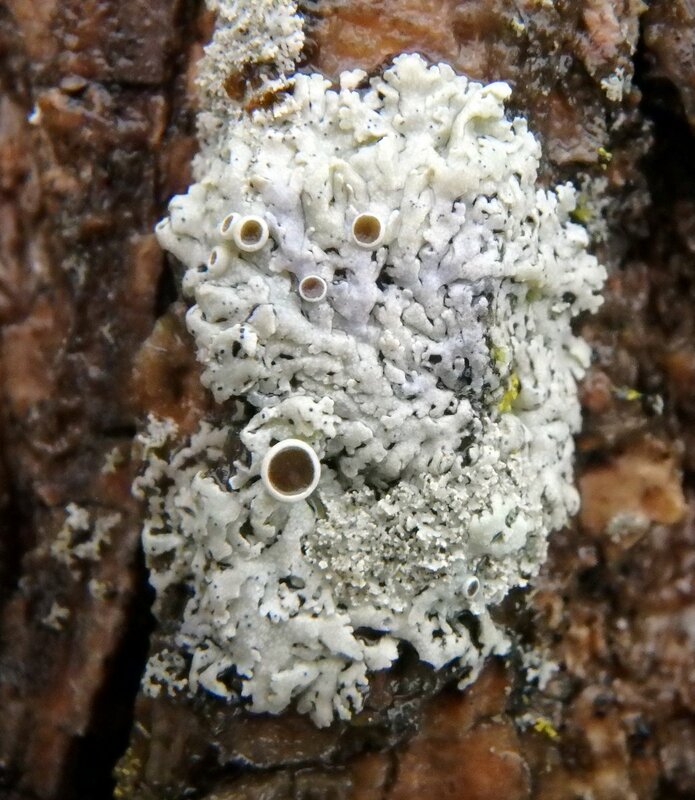 The whitish ruffles at the base of each brown sporangiophore are the spore producing sporangia. 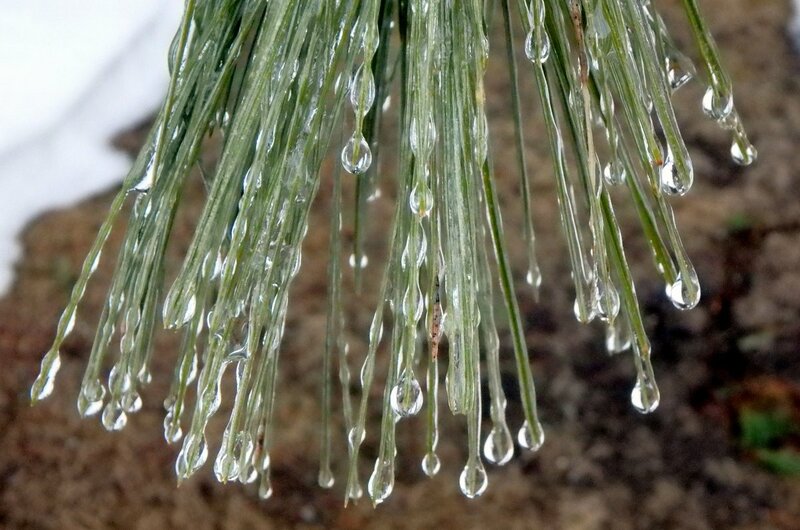 When the horsetail looks like the one in this photo it has released its spores and will shortly die. 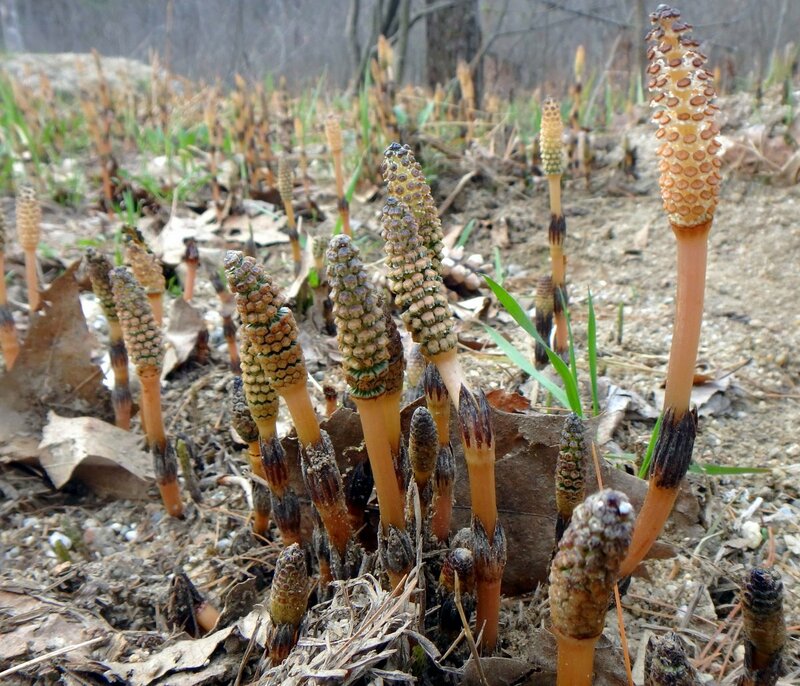 When the fertile spore bearing stems of the horsetail have released their spores the infertile green, photosynthesizing stems pf the plant appear. These shoots are rough and gritty since they contain a lot of silica. In fact they are often used by campers to scrub pots and dishes because they are so gritty. They are also very close to impossible to eradicate from a garden, so this isn’t a plant to wish grew closer to home. 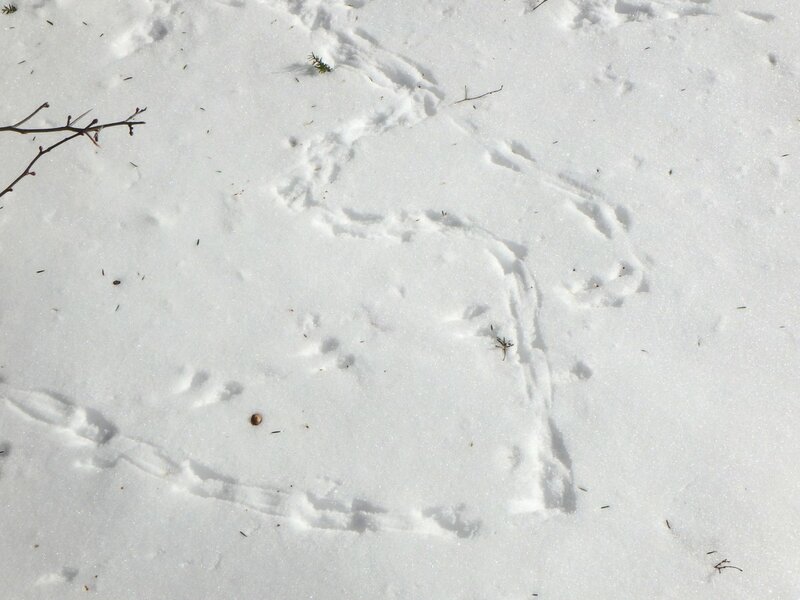 I didn’t see a goldfinch but I knew it had been here. 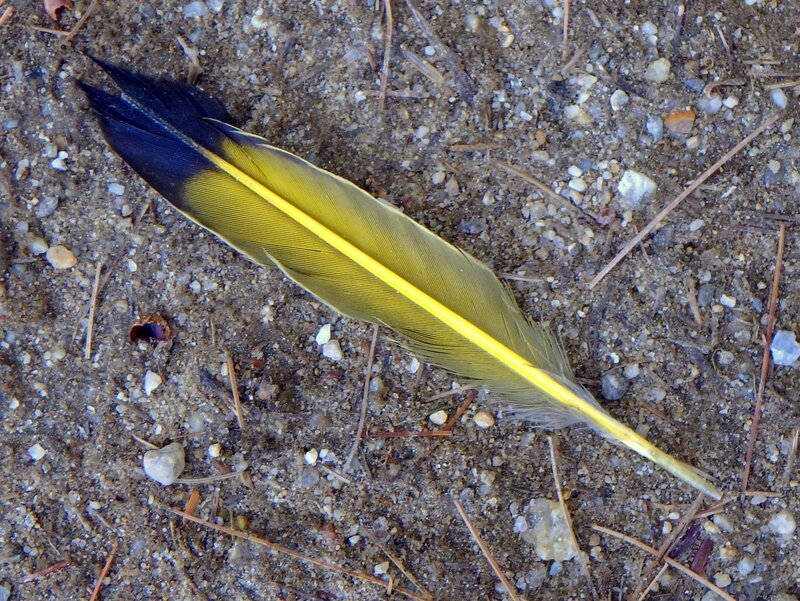 A beautiful gift from a beautiful little bird. 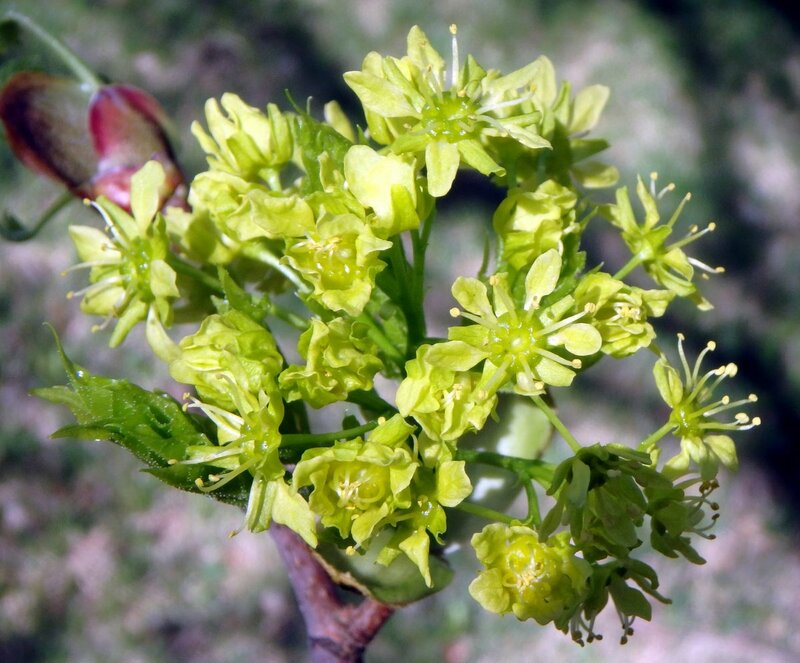 The big buds of Norway maple (Acer platanoides) opened a week or so ago but the flowers still persist on the trees. Last year they were blossoming in late April so they’re clearly late this year. 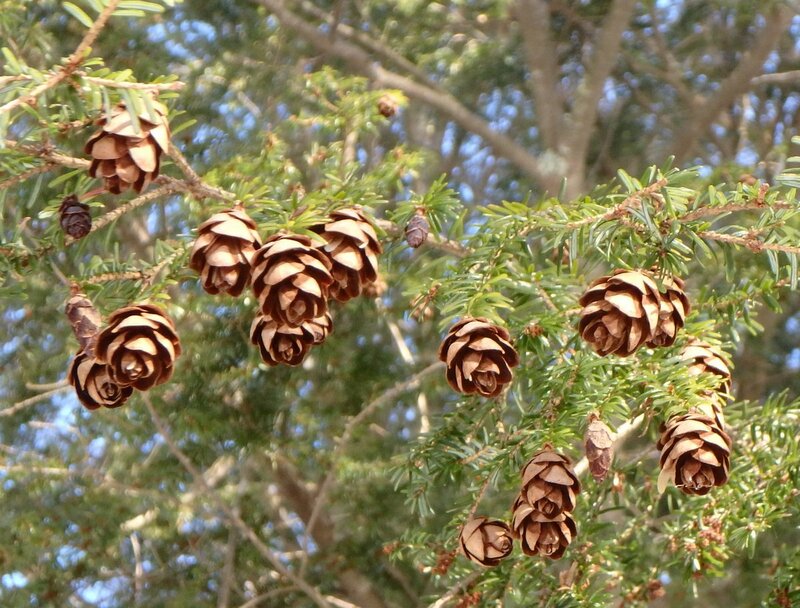 These trees are native to Europe and are considered invasive here. 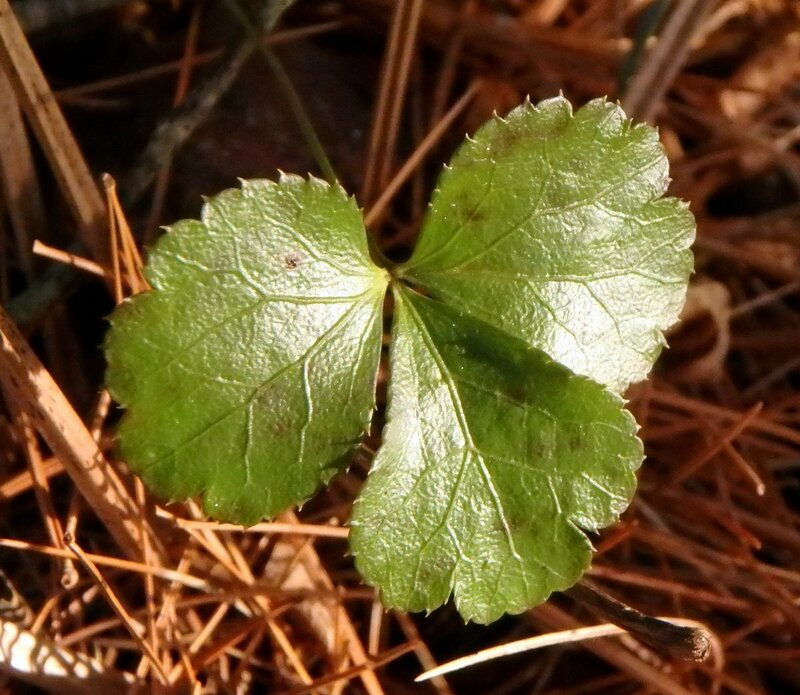 Finding white sap in the leaf stem (Petiole) is one way to identify Norway maple. 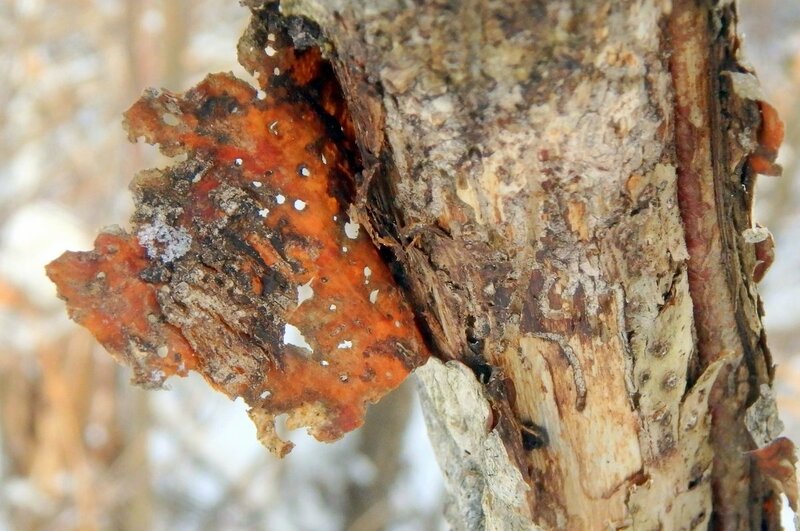 Sugar maple and red maple have clear sap. 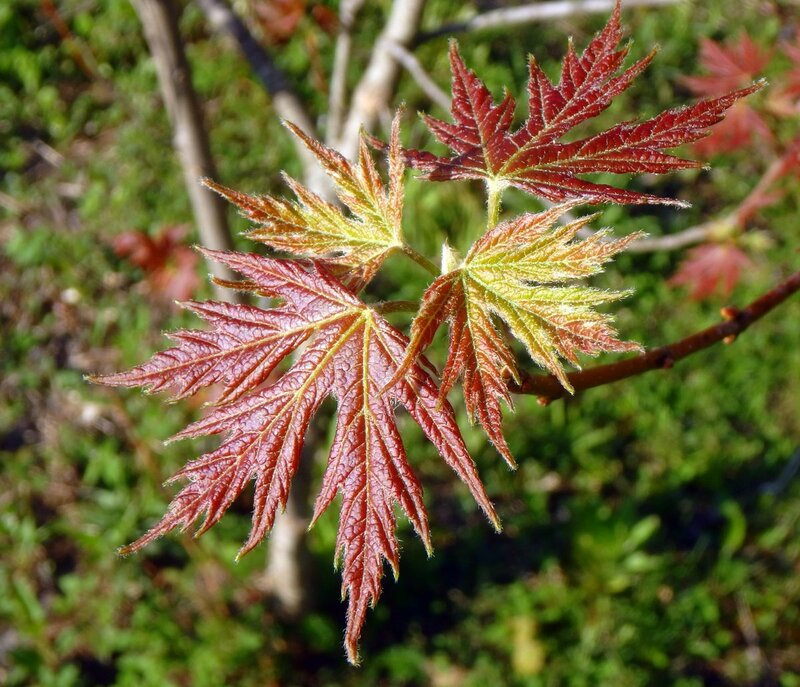 The flower clusters of Norway maples are large and appear before the leaves so they can be seen from quite a distance. 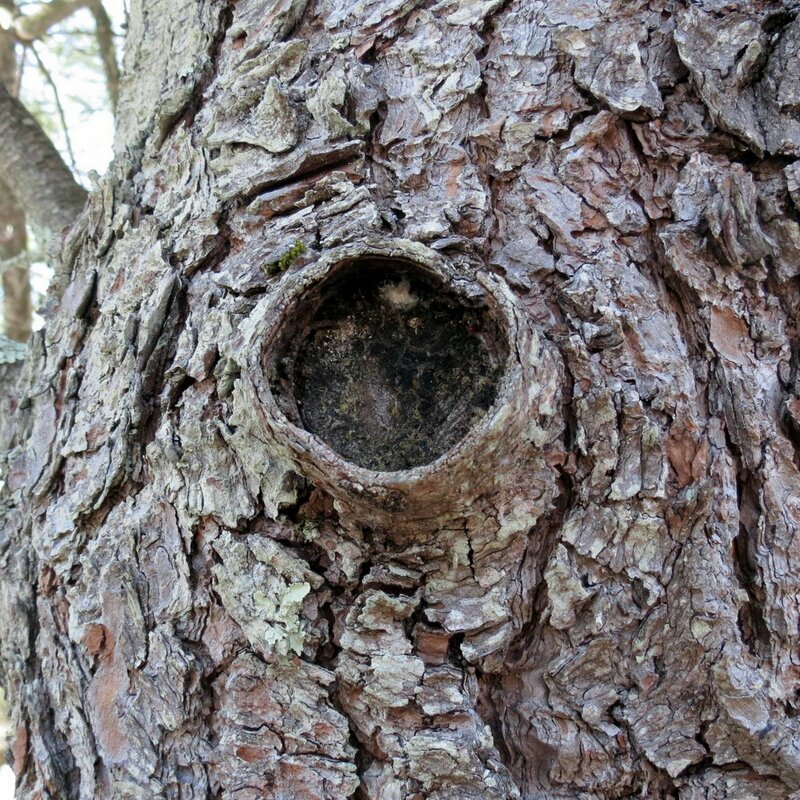 Though invasive the trees were once used extensively as landscape specimens and you can find them all over this town. 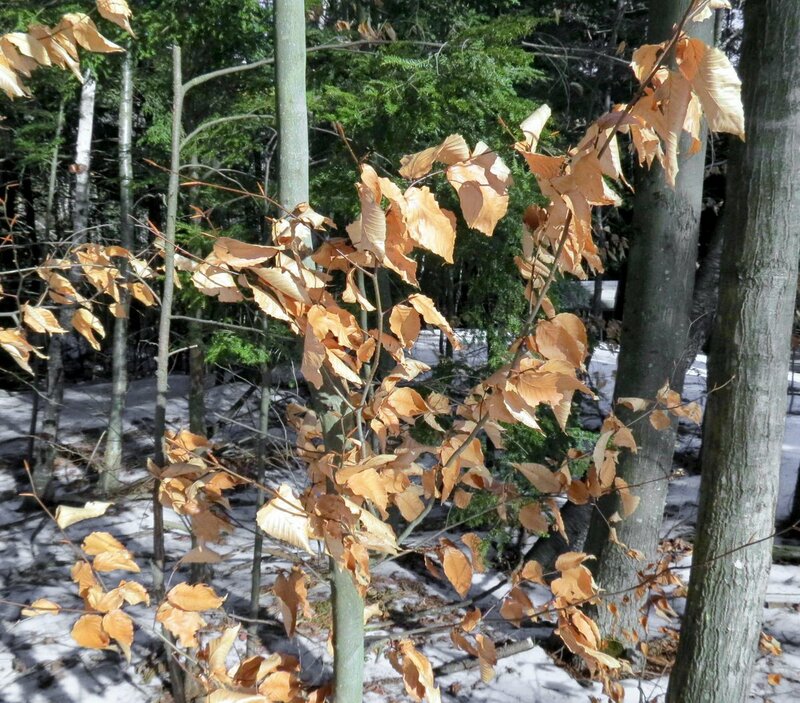 Unfortunately the tree has escaped into the forests and in places is crowding out sugar and other maples. Norway maple is recognized as an invasive species in at least 20 states and it’s against the law to sell or plant them in New Hampshire. 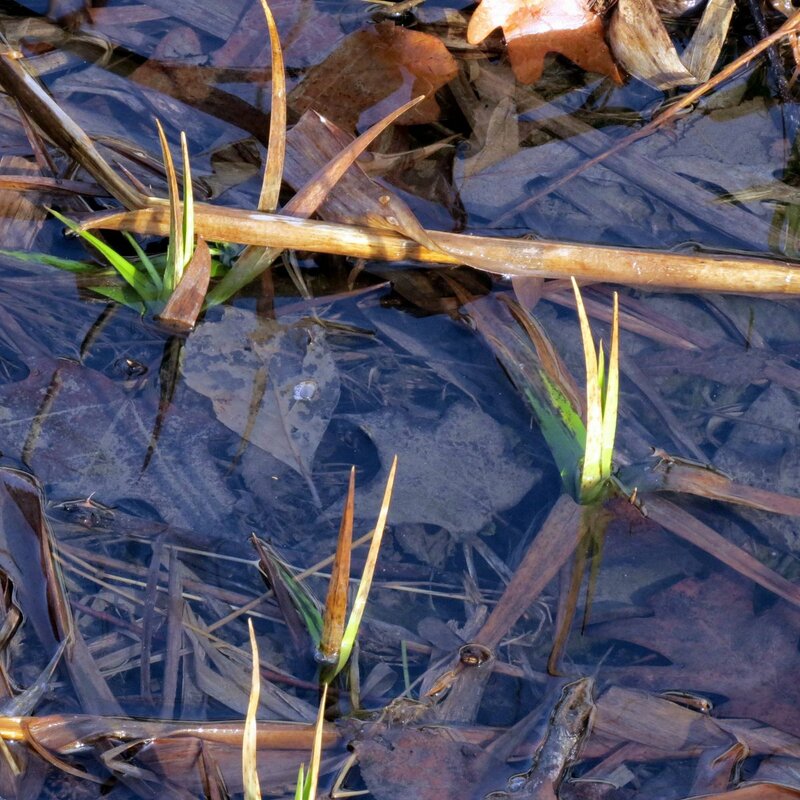 The new spring shoots of cattails (Typha latifolia) are coming up among last year’s fallen stalks. 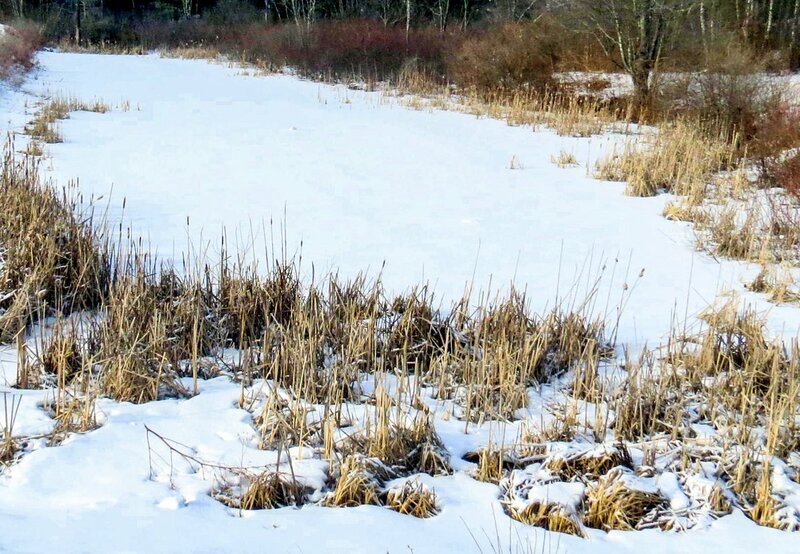 Science has recorded cattail marshes growing up to 17 feet in a single year, but animals like muskrats often eat the roots and this helps keep them in check. 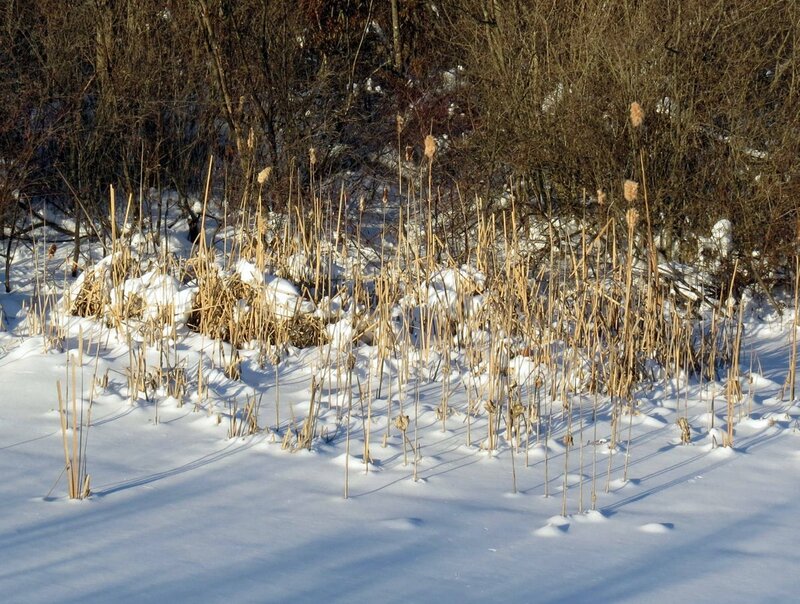 Cattail roots contain more starch than potatoes and more protein than rice and they were an important food source for Native Americans. They made flour from the fleshy roots and ate the new shoots in spring. They had uses for every part of the plant, including its pollen. 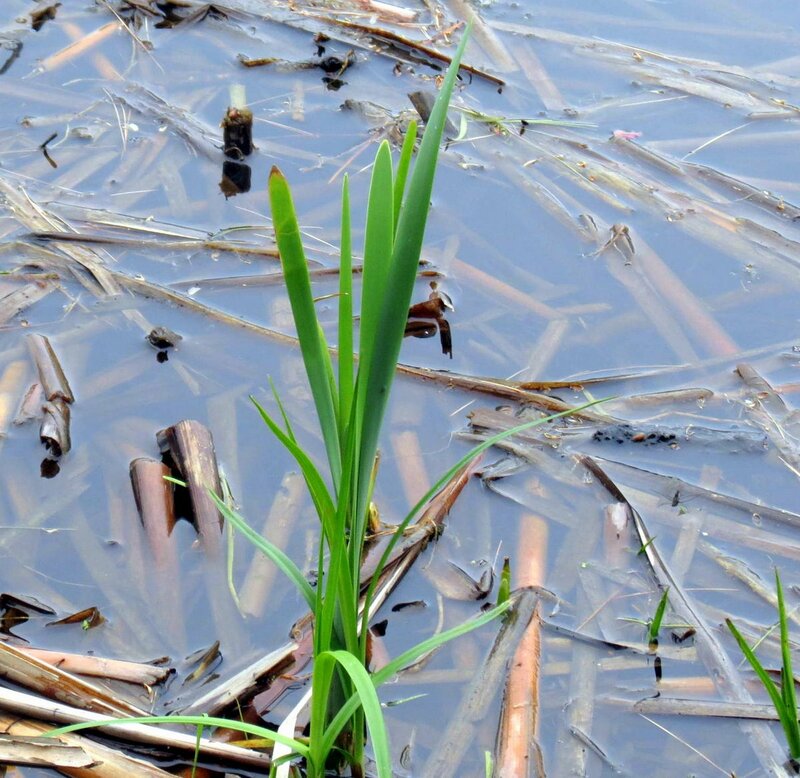 To anyone thinking they’ll go collect a basketful of cattail roots I say be very careful, because blue and yellow flag iris leaves look much like cattails and often grow right along with them, and iris roots are very poisonous. Know your roots! 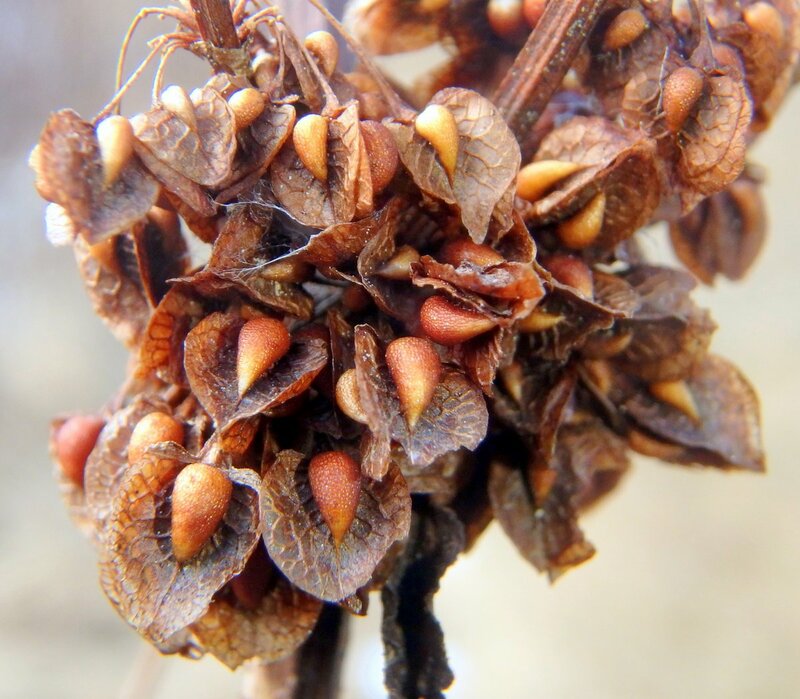 For a short time between when they appear and when they ripen and fall American elm (Ulmus americana) seeds have a white fringe. When they ripen they’ll become dry and papery and finally fall to the wind. I grew up on a street that had huge 200 year old elms on it and those trees put out seeds in what must have been the millions. I remember how they wreaked havoc with cars by clogging the vents. My father complained about them more than once. 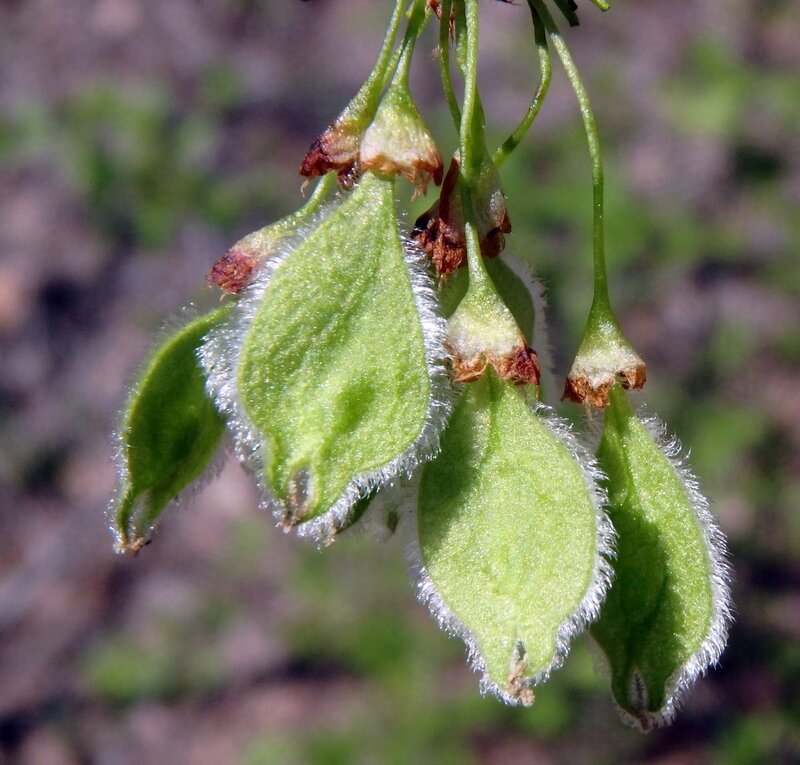 Elm seeds contain 45% protein and 7% fiber and in the great famine of 1812 they were used as food in Norway. 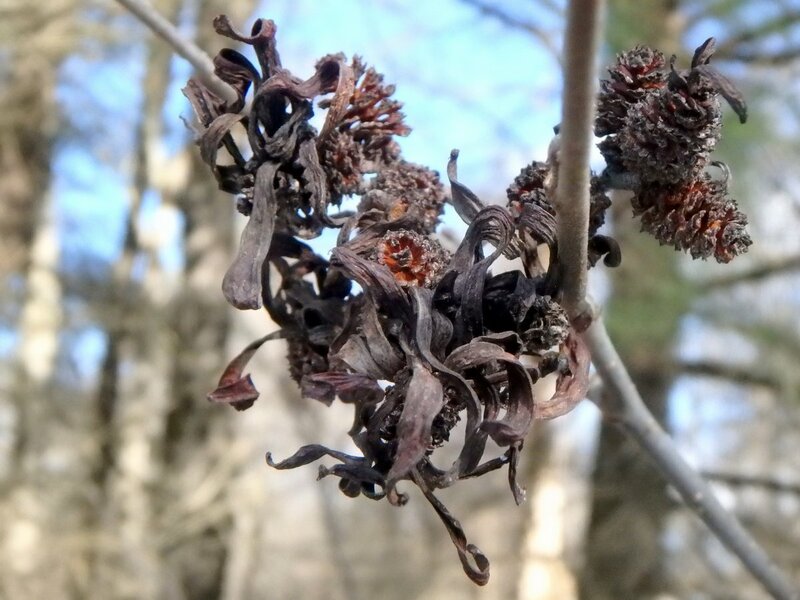 I finally found some developing silver maple seeds to show you. Normally when very young they’re bright red with white hairs but these had gone over to green, even though they still had the hair. 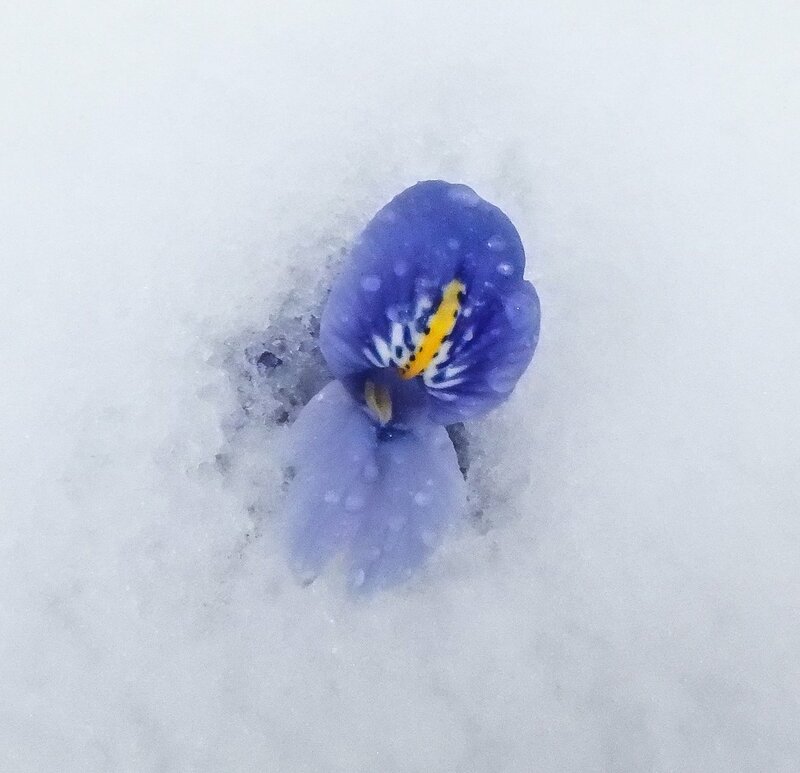 I’ll have to try again next spring. You really can’t see everything there is to see in spring unless you have all day every day to look, and even then I doubt it would be possible. Some ferns are just coming up and others are knee high and ready to unfurl. I think these were cinnamon ferns (Osmundastrum cinnamomeum) but they could be interrupted ferns (Osmundastrum claytoniana.) 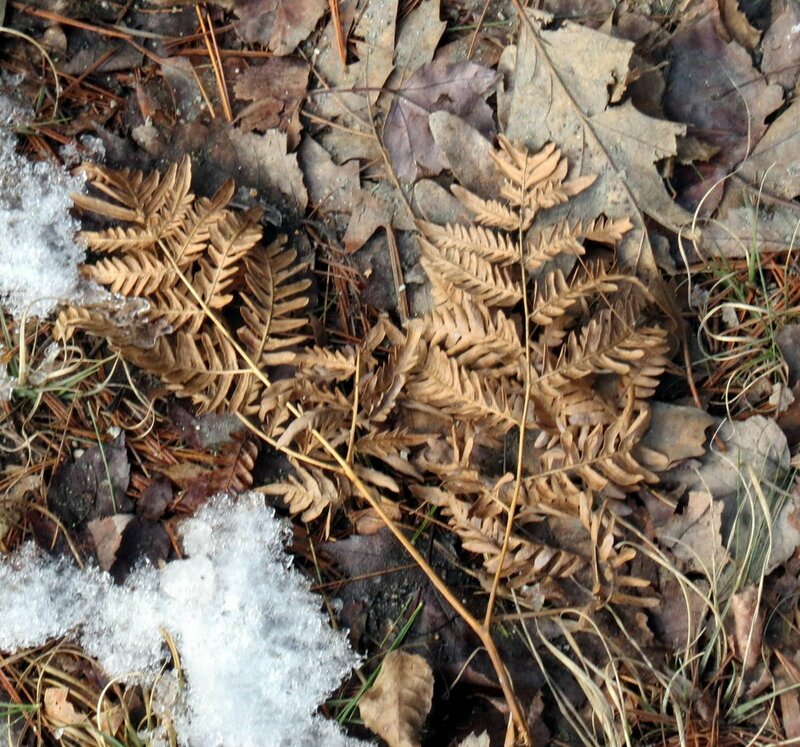 Royal ferns and sensitive ferns are still in the just out of the ground fiddlehead stage. This isn’t a very good photo because all I had with me was the small camera I use for macro shots, but how often do we get to see baby squirrels playing? 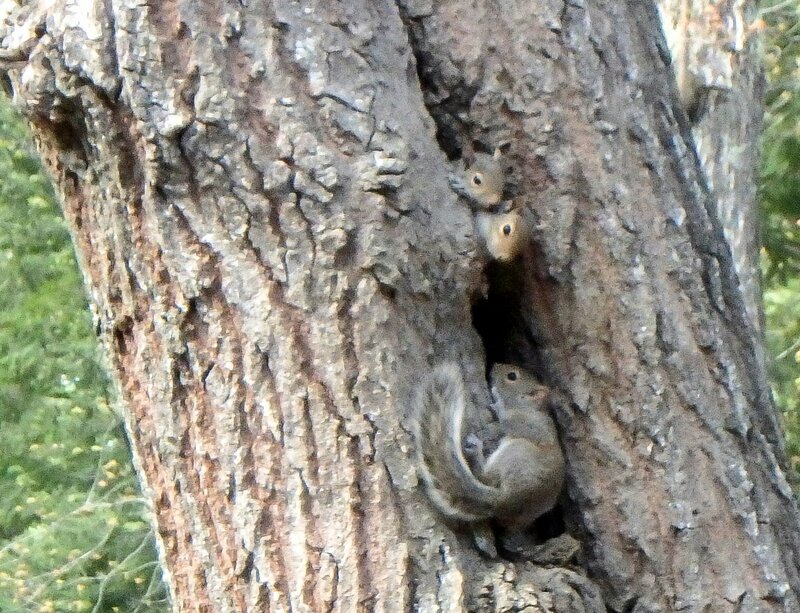 These three babies were less than half the size of an adult squirrel and spent quite a lot of time chasing each other in and out of a hollow tree, learning all the while I suppose. I’ve always liked watching squirrels. They’re a lot of fun to watch because they seem to have a lot of fun. Back a few years ago I had the luxury of working from home, telecommuting in a way. 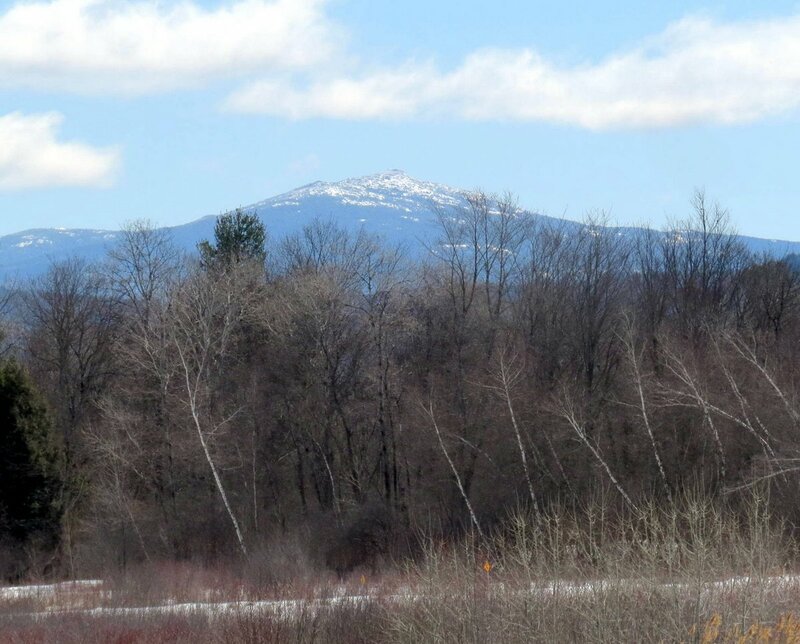 At times it could get slightly monotonous so to break up the monotony I took a walk at lunch time each day. Of course I had a camera with me and many of the photos I took on those lunchtime walks appeared here on this blog. 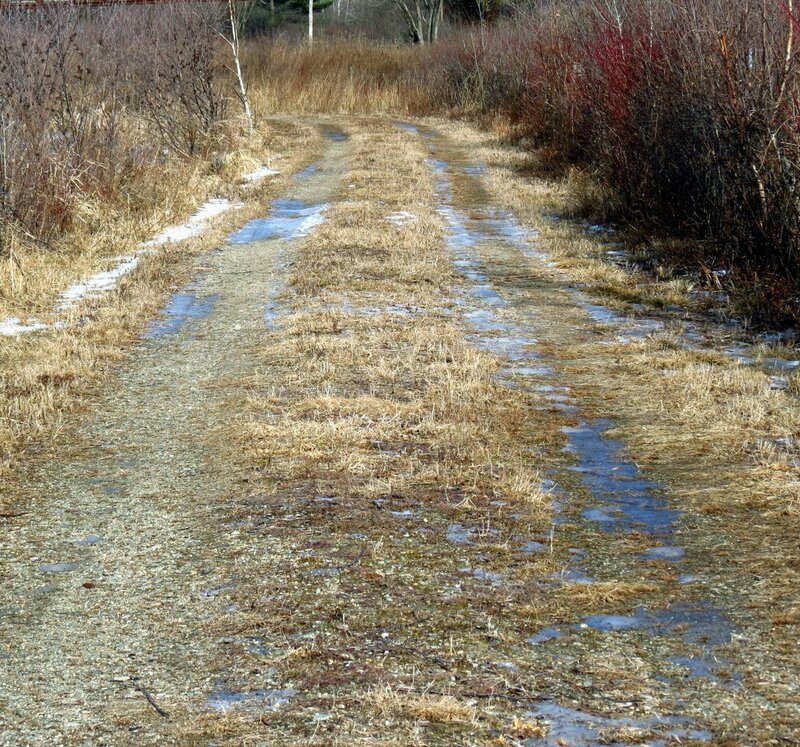 The above photo shows the road I walked on, what we always called the “dirt road,” because it was a dirt road for many years until the town came along and paved it. To the right of the road is a small pond where Canada geese used to swim but now it is home mostly to frogs, snapping turtles, and muskrats. 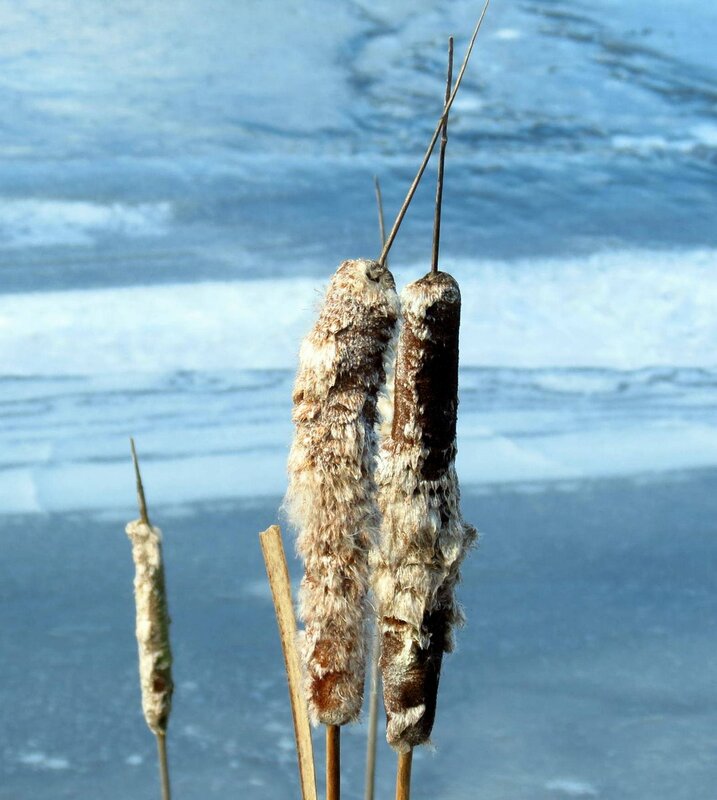 The muskrats eat the cattail roots. The snapping turtles eat the frogs, and the frogs eat up a lot of mosquitoes, for which I am very grateful. 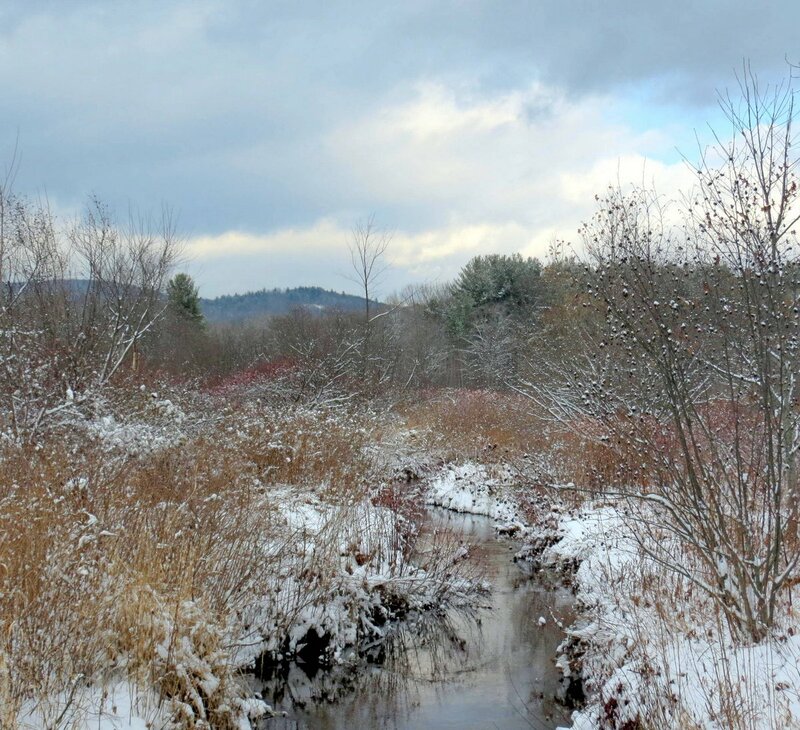 I’m looking forward to hearing the spring peepers start singing again in March. 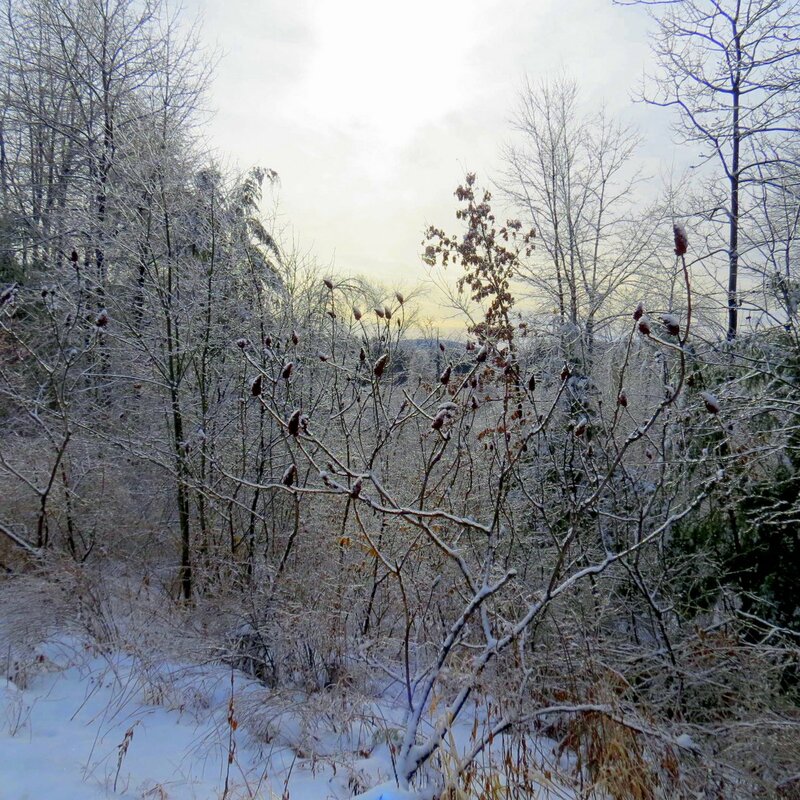 To the left of the road is a large alder swamp where in the spring red wing blackbirds by the many hundreds live. They don’t like people near their nesting sites and when I walked by here they always let me know how disappointed they were with my walking habits. Just out there in the middle of the swamp was an old dead white pine I used to call it the heron tree, because great blue herons used to sit in its branches. 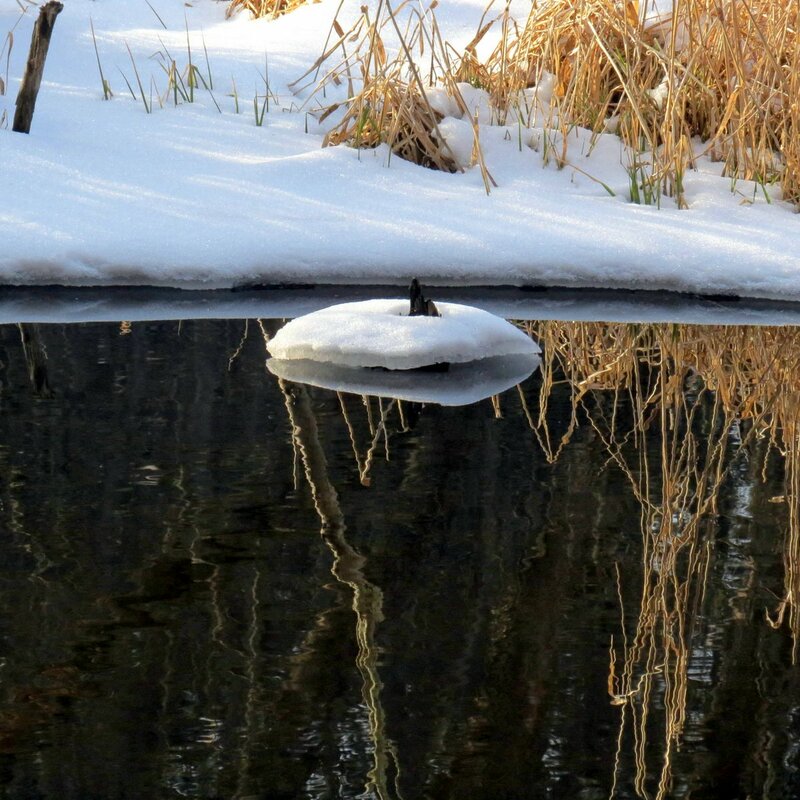 Since it fell I haven’t seen as many herons fishing here. 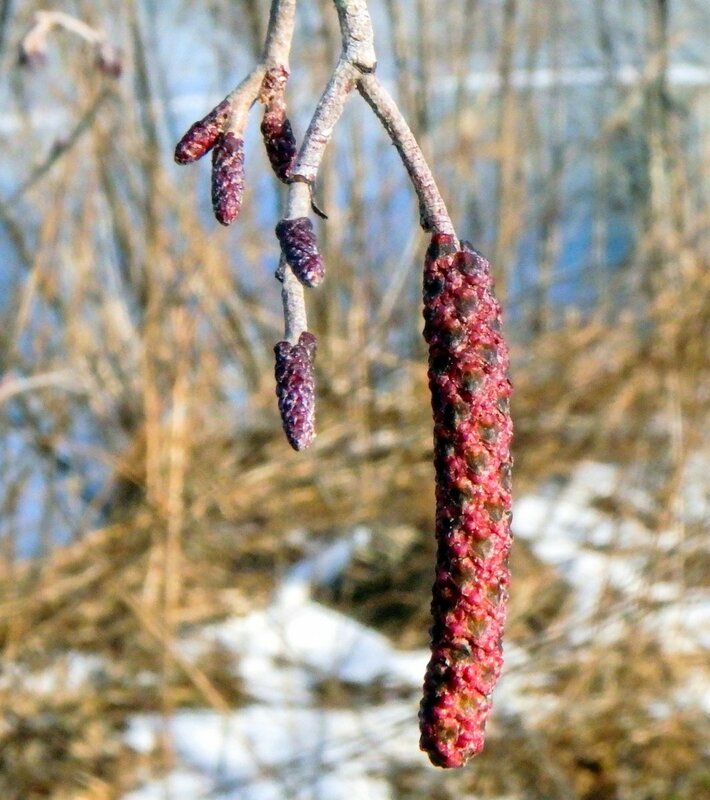 The alders were heavy with dangling catkins, which in this case are the shrub’s male (Staminate) flowers. 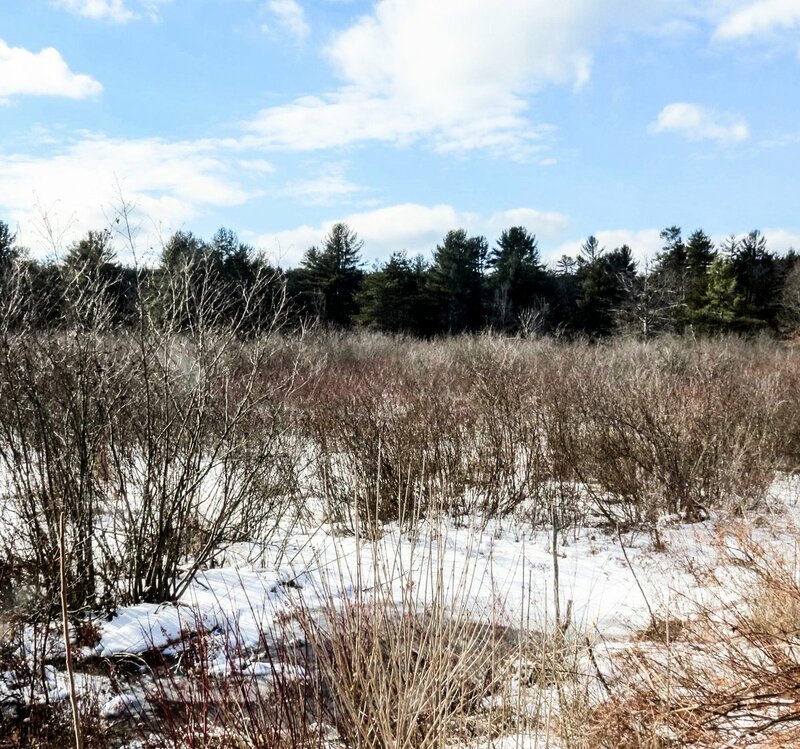 I believe that most of the alders here are speckled alders (Alnus incana) but I can’t get close enough to most of them to find out, because this swamp never freezes entirely. 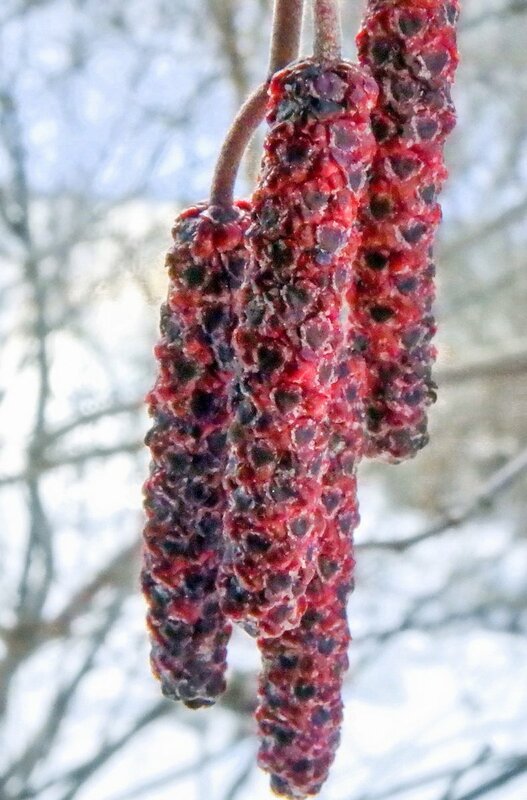 The beautiful alder catkins, each packed with hundreds of male flowers, will open usually around the last week in March to the first week of April. When the brownish purple scales on short stalks open they’ll reveal the golden pollen, and for a short time it will look as if someone has hung jewels of purple and gold on all the bushes. That’s the signal I use to start looking for the tiny crimson female (Pistillate) flowers, which will appear in time to receive the wind born pollen. They are among the smallest flowers I know of and they can be hard to see. 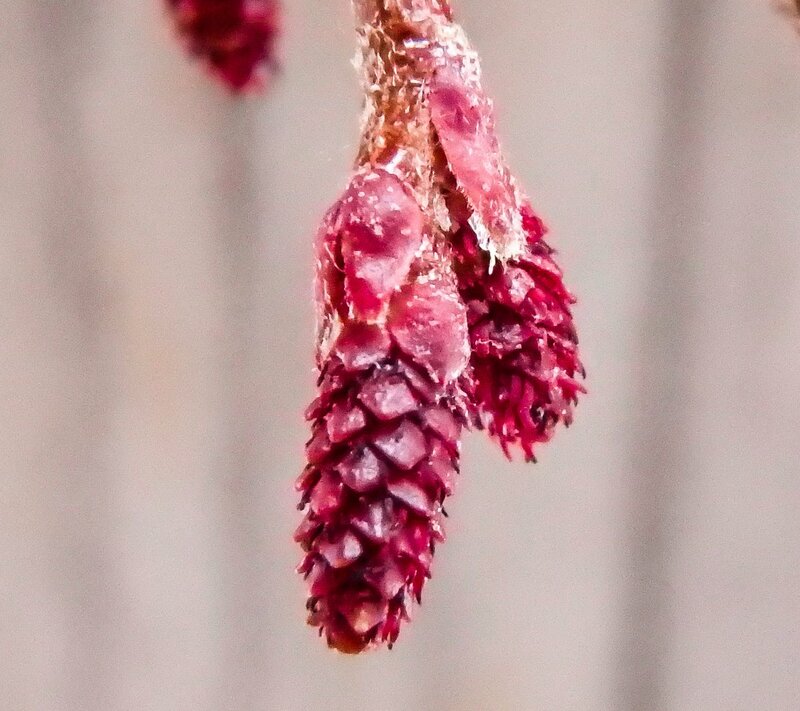 The female alder flowers become the hard little cones called strobiles which I think most of us are probably familiar with. 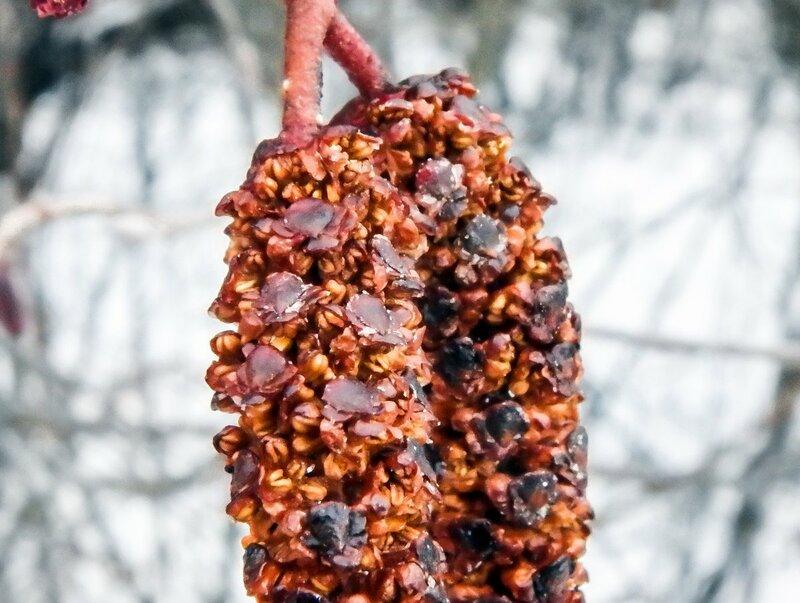 These strobiles have tongue gall, which is caused by a fungus called Taphrina alni. 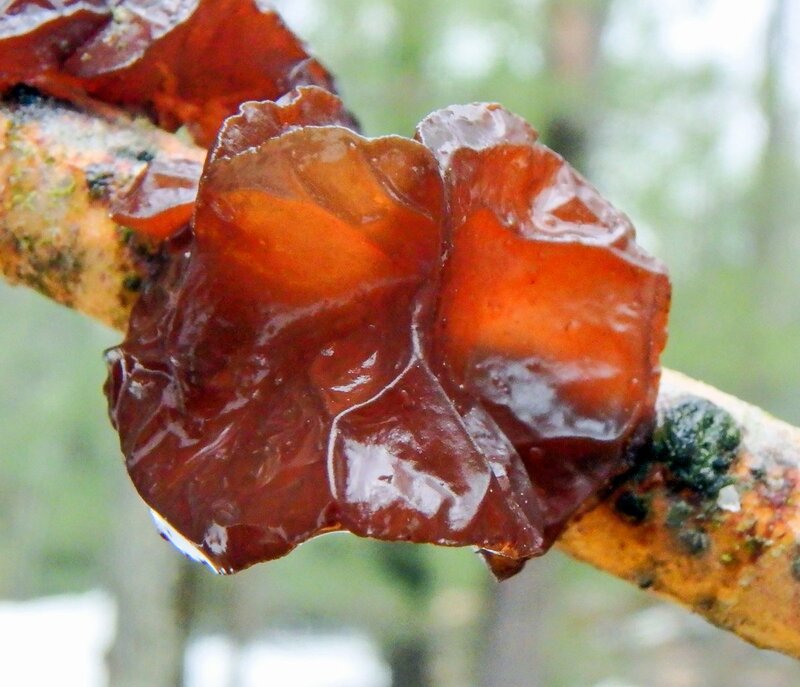 The fungus chemically deforms parts of the ovarian tissue of the developing cone and causes long, tongue like galls called languets to grow from them. 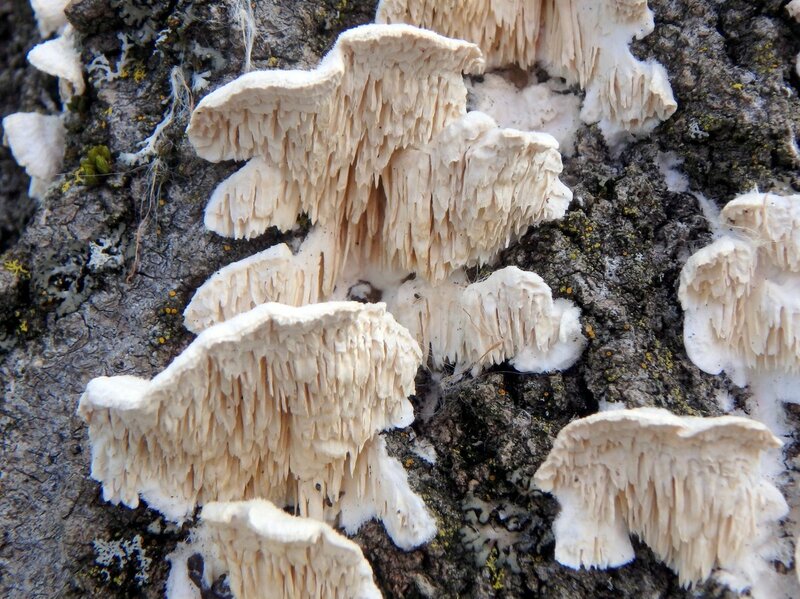 I’m guessing that the fungus benefits from these long tongues by getting its spore bearing surfaces out into the wind. 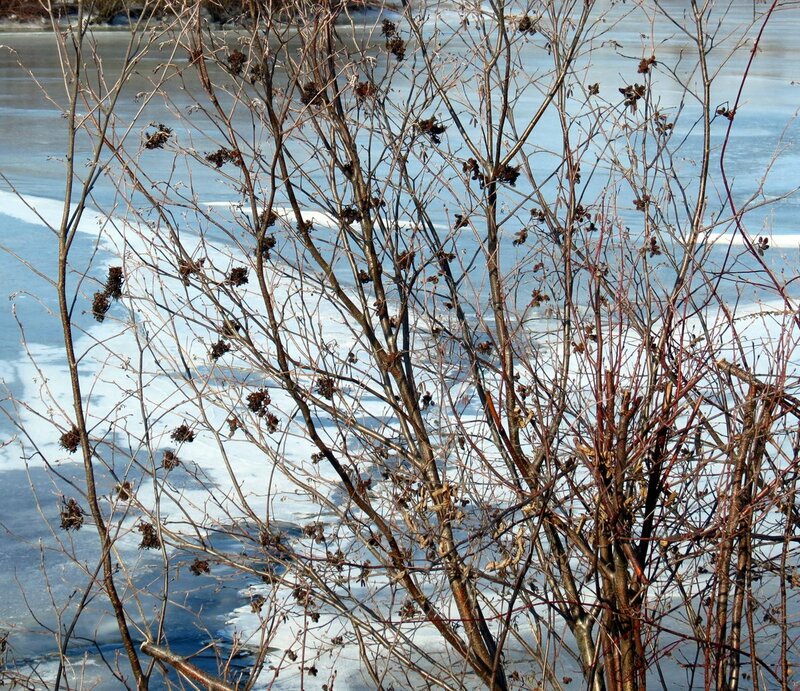 They don’t seem to hurt the alder any. In fact most galls don’t harm their hosts. 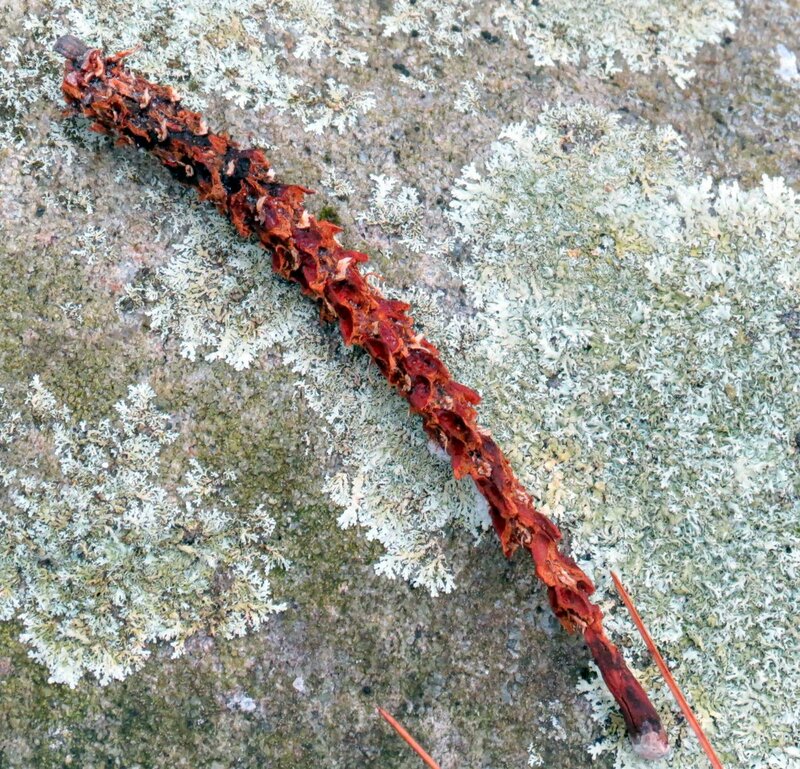 Medieval writers thought witch’s brooms were a bewitched bundle of twigs and called them Hexenbesen, but witch’s brooms are simply a plant deformity; a dense cluster of branches caused by usually a fungus but sometimes by a parasitic plant like mistletoe. 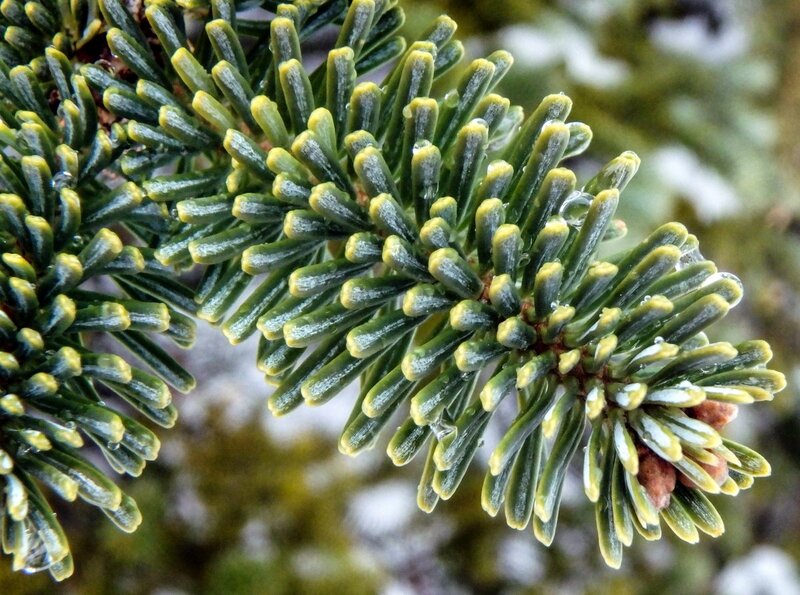 Witch’s broom can sometimes be desirable; the Montgomery dwarf blue spruce came originally from a witch’s broom. 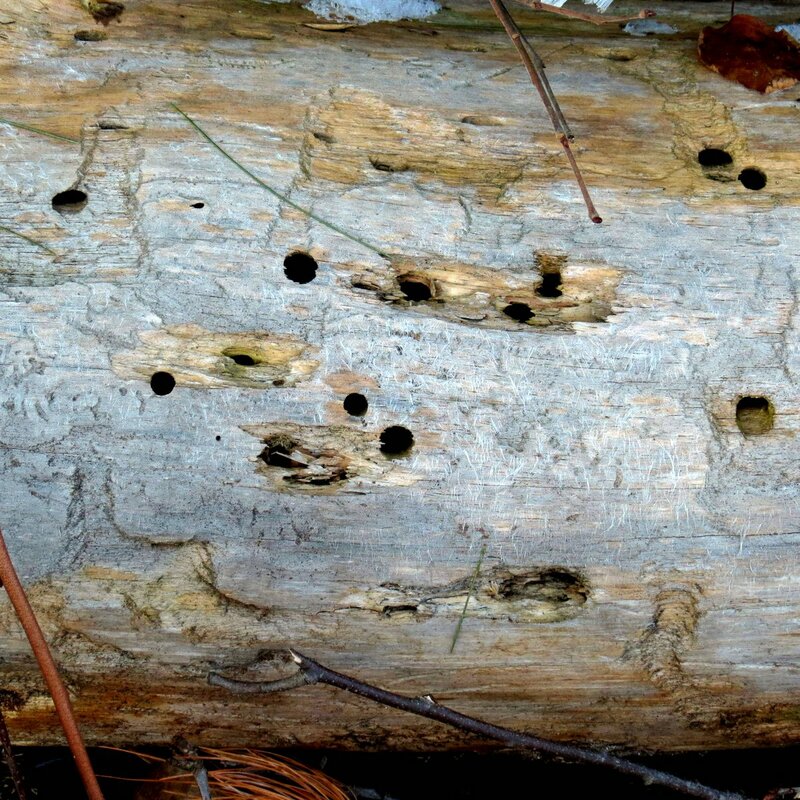 This example is on an old dead white pine (Pinus strobus) and is the only one I’ve ever seen on pine. 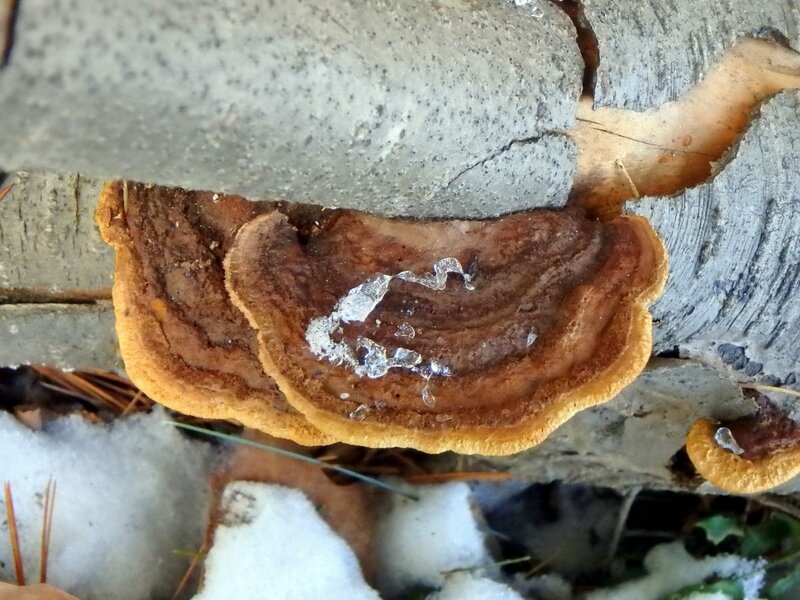 A colorful bracket fungus grew on a fallen log. 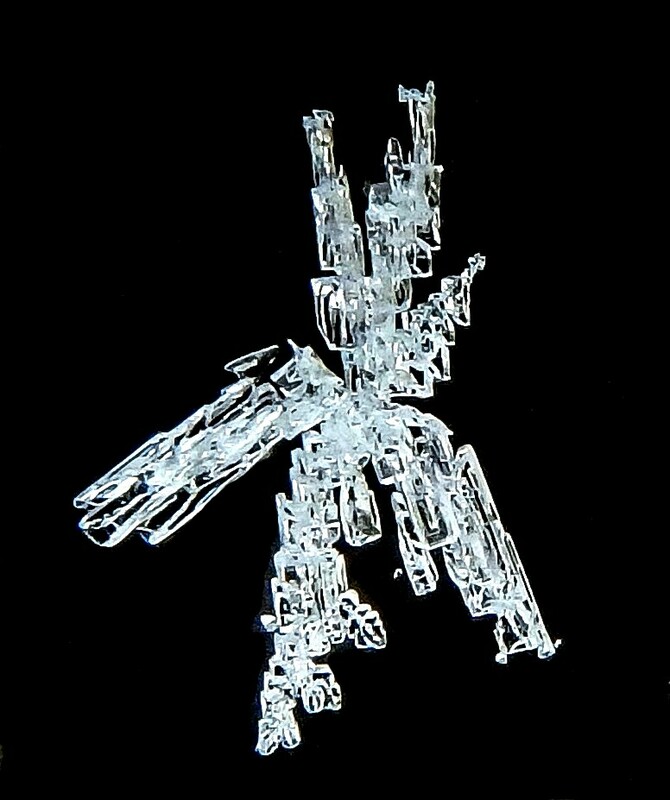 Or maybe I should say that it was frozen to it, because it was rock hard. 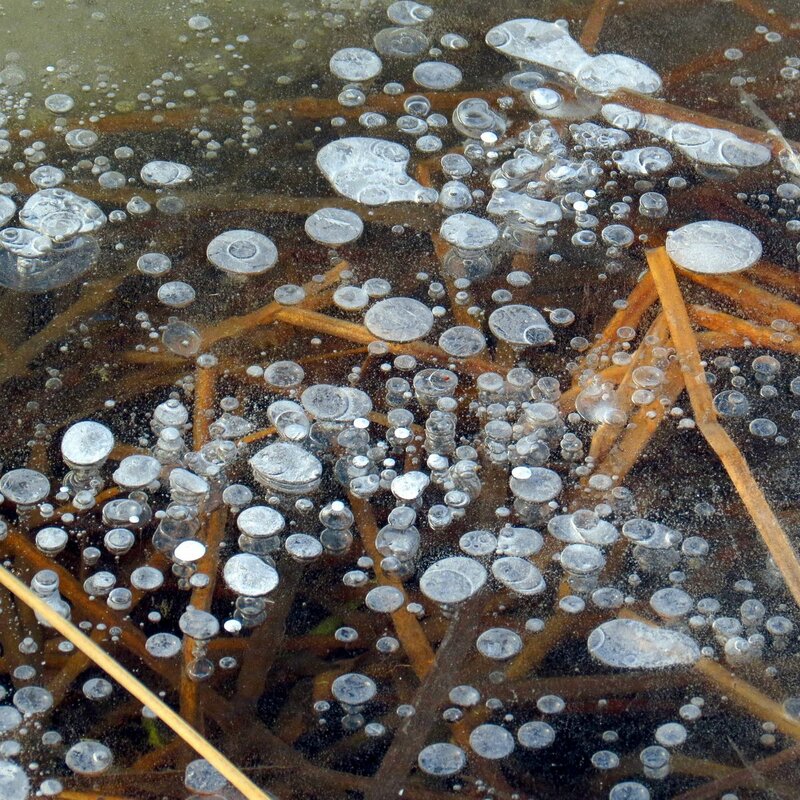 My mushroom book says that this fungus can appear at all times of year though, so it must be used to the cold. It’s described as hairy with ochre to bright rust yellow and rust brown banding and if I’ve identified it correctly it’s called the mustard yellow polypore (Phellinus gilvus.) That’s an odd name considering that it has very little yellow in it but even the photo in the book shows only a thin band of yellow. 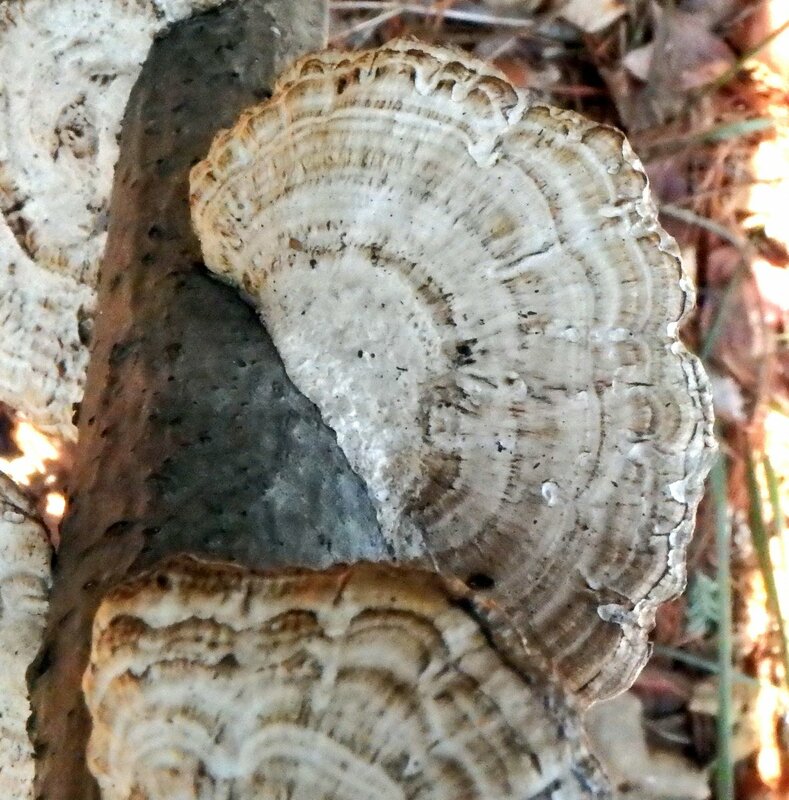 This bracket fungus was very thin and woody and grew in several examples around the perimeter of a fallen tree. I think it’s probably the thin maze polypore (Daedaleopsis confragosa,) which is fairly common. 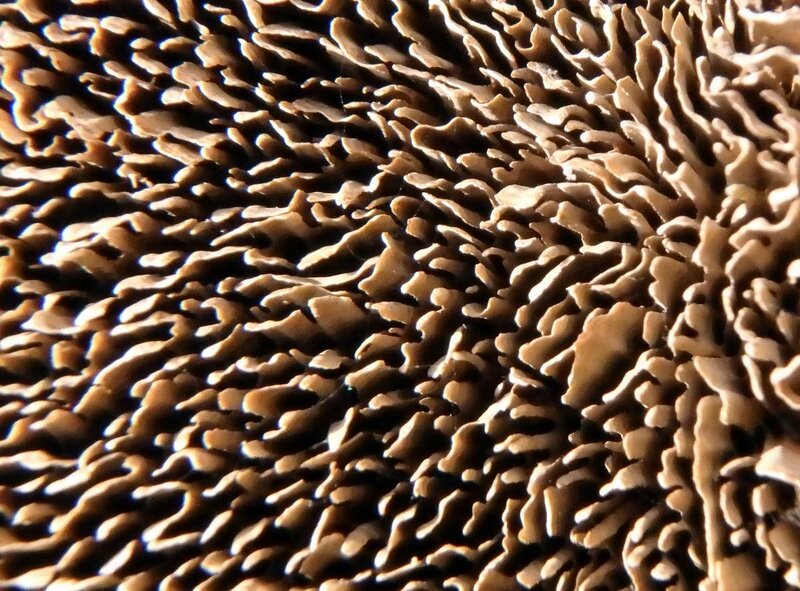 This photo is of the maze-like underside of the thin maze polypore. 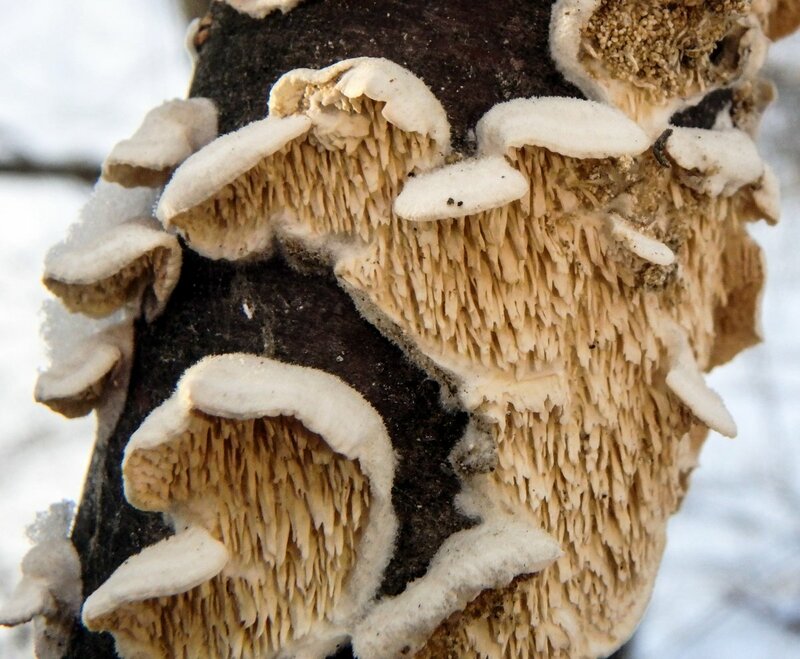 This is a great example of how some mushrooms increase their spore bearing surfaces. 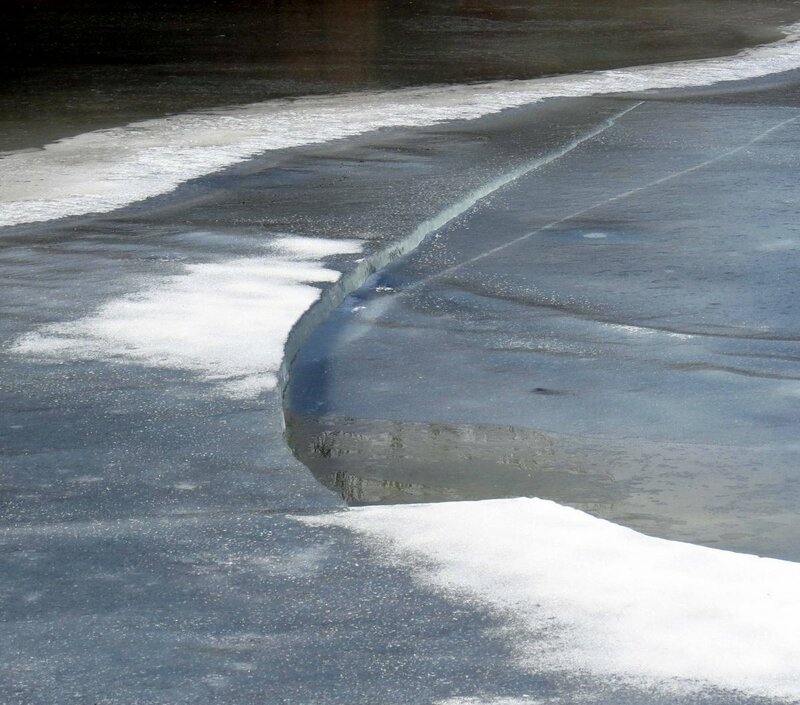 When fresh the surface is pale gray and turns red when bruised. 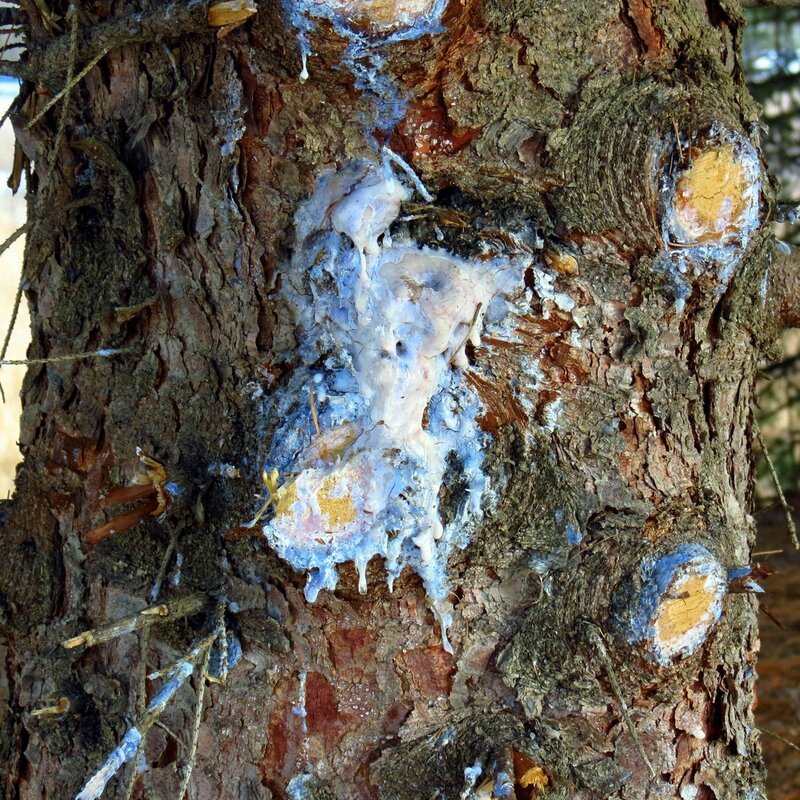 This fungus causes white rot in trees. 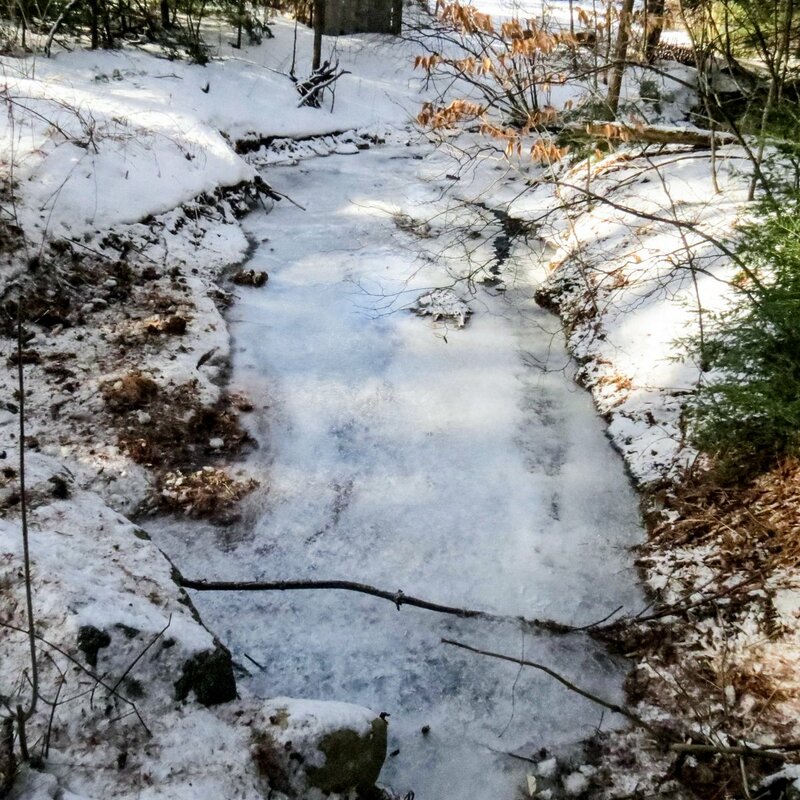 Despite having more cold days than warm days the sun is doing its work and melting the snow in places with a southerly exposure. 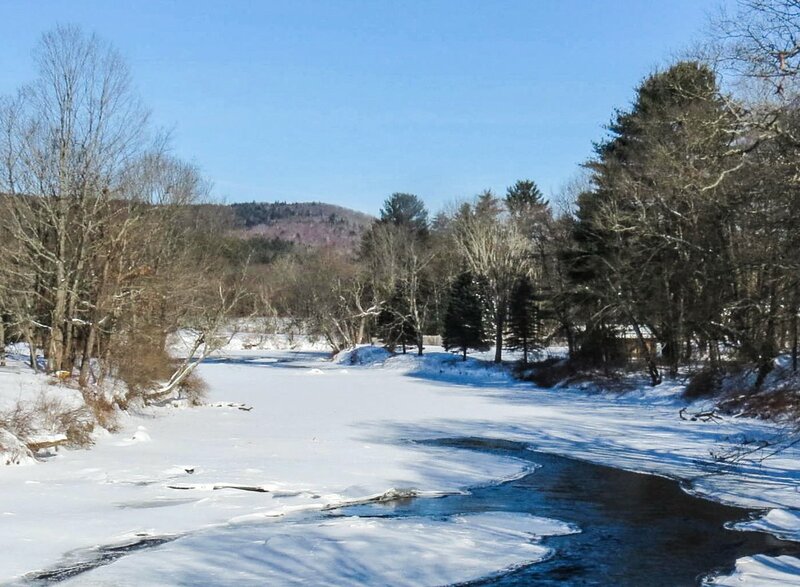 Our average temperature in February here in southern New Hampshire is 35 degrees F. so try as it might, winter can’t win now. 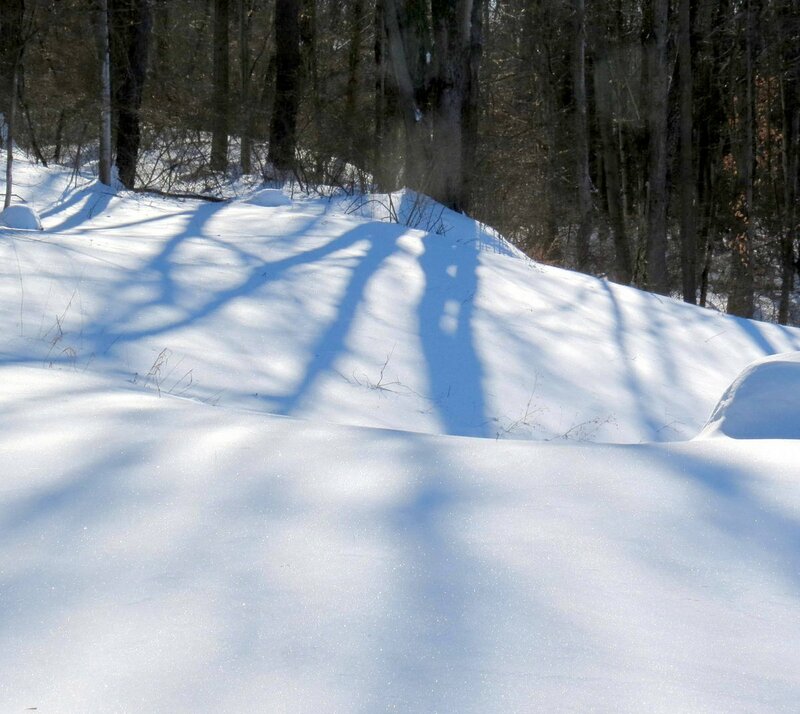 It can still throw some terrible weather at us though; the average snowfall amount is 18 inches but I’ve seen that much fall in a single February storm before. We are supposed to see 10-12 inches later today, in fact. The reason the area in the previous photo is so clear of growth is because a large stand of bracken fern grows (Pteridium aquilinum) there. Bracken fern releases release chemicals that inhibit the growth of other plants and that’s why this fern grows in large colonies where no other plants or trees are seen. 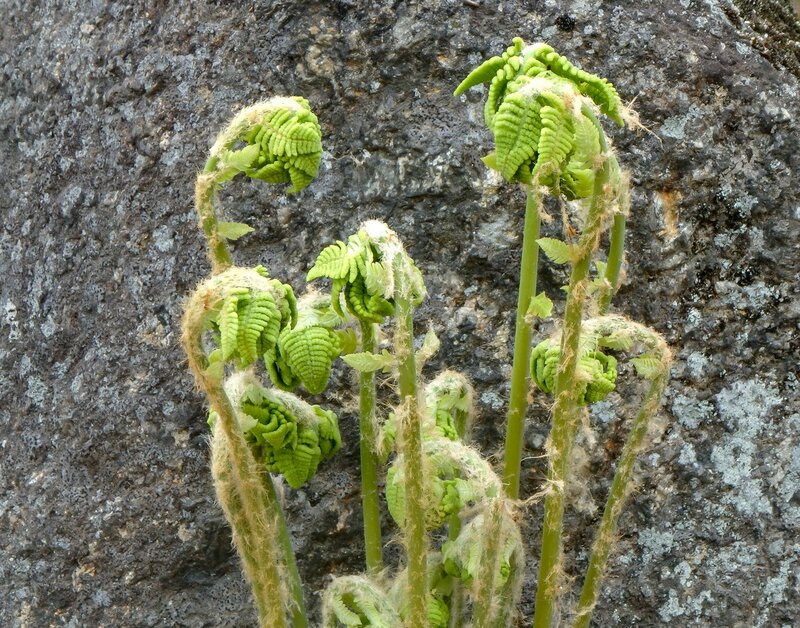 Bracken is one of the oldest ferns, with fossil records dating it to over 55 million years old. Though they usually grow knee high I’ve seen some that were chest high. Down the road a ways a large colony of American wintergreen (Gaultheria procumbens) grows. Since this was the first plant I learned to identify I’m always happy to see it. It is also called teaberry or checkerberry and those who have ever tasted Clark’s Teaberry Gum know its flavor well. 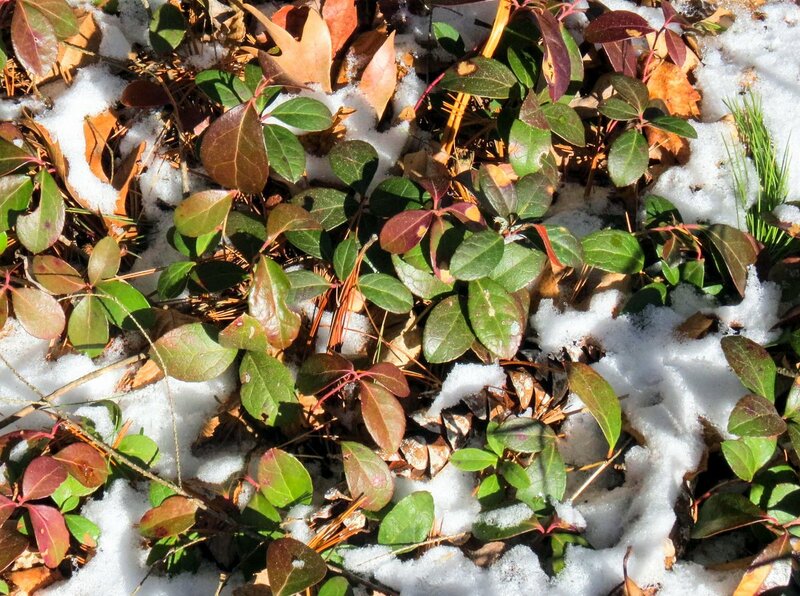 Oil of wintergreen has been used medicinally for centuries and it is still used in mouthwash, toothpaste, and pain relievers. Native Americans carried the leaves on hunts and nibbled on them to help them breathe easier when running or carrying game. The leaves make a pleasant minty tea but the plant contains compounds similar to those found in aspirin, so anyone allergic to aspirin shouldn’t use this plant. Common speedwell (Veronica officinalis) has also been used medicinally for centuries in Europe and its leaves were used as a tea substitute there. Though it isn’t really invasive it is considered an agricultural weed. It forms mat like growths like that seen in the above photo but sends up vertical flower stalks in May. 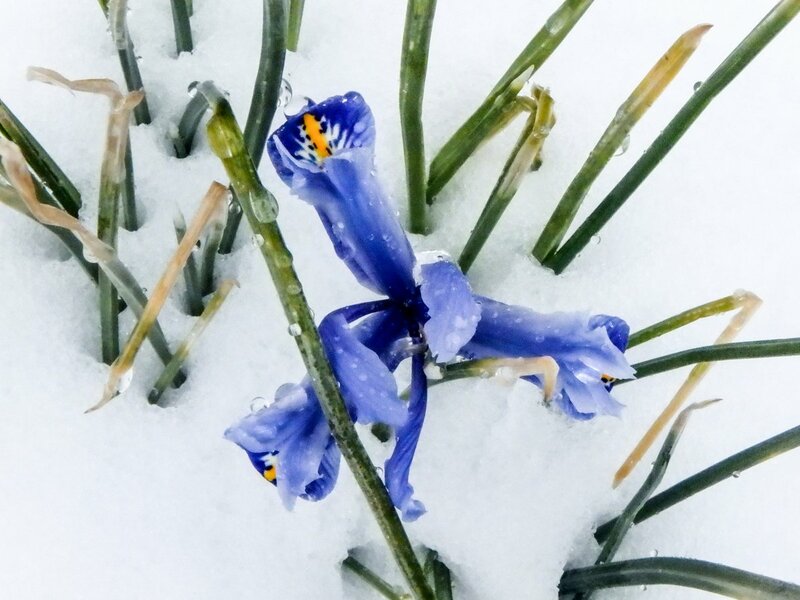 Each flower stalk (Raceme) has many very small blue flowers streaked with dark purple lines. 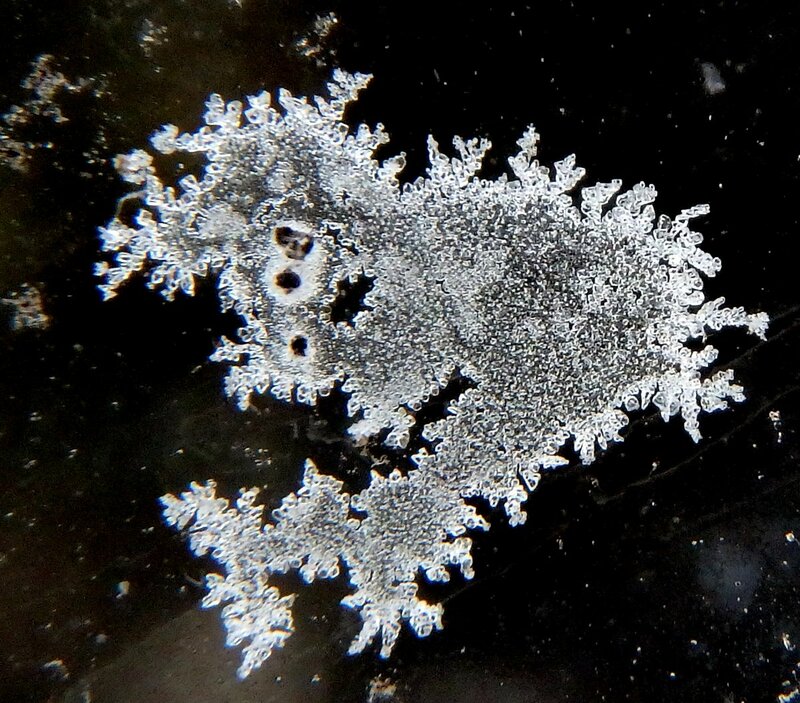 They are beautiful little things, but they aren’t easy to photograph. Yet another plant found in large colonies along the road is yarrow (Achillea milefolium.) Yarrow has been used medicinally since the dawn of time, and bunches of the dried herb have been found in Neanderthal graves. 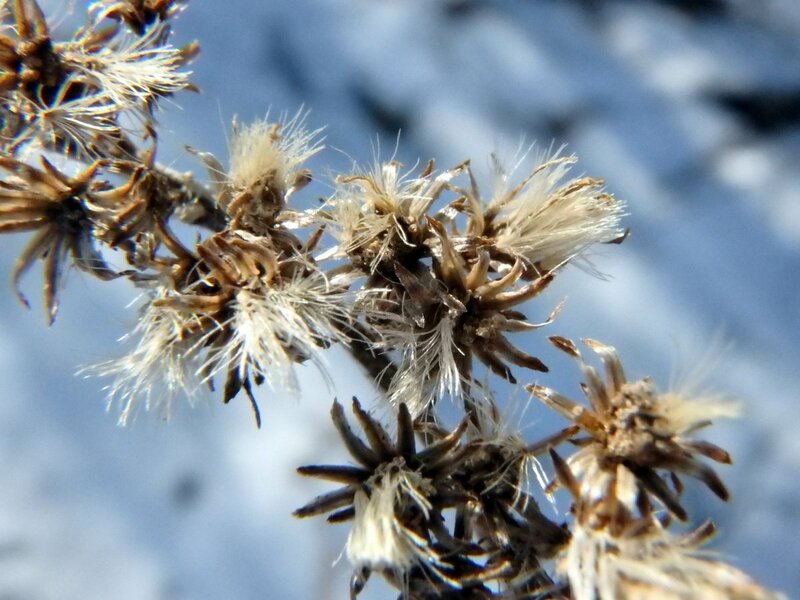 It is one of the nine holy herbs and was traded throughout the world, and that’s probably the reason it is found in nearly every country on earth. 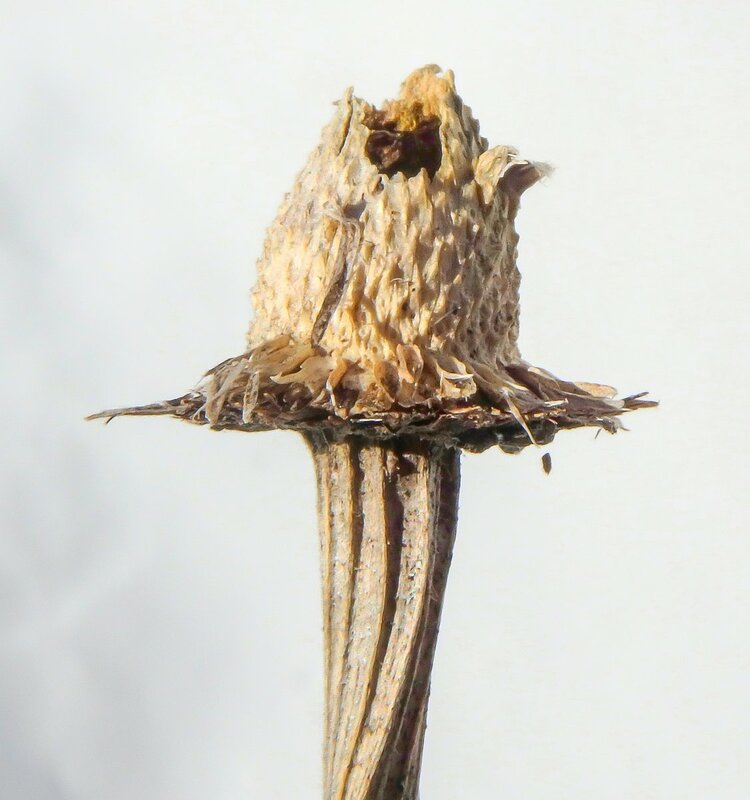 I’ve never looked closely at its seed heads before. I was surprised to see that they look nothing like the flowers. If it wasn’t for the scent and the few dried leaves clinging to the stem I’m not sure I would have known it was yarrow. 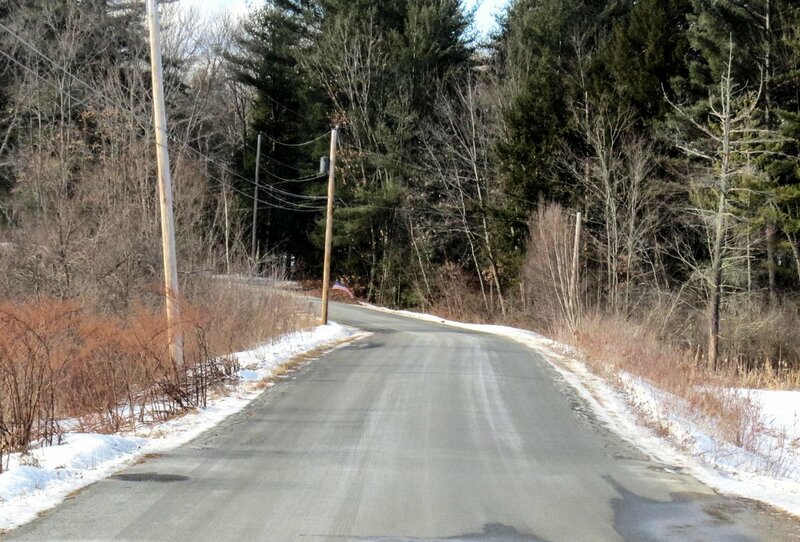 …while on this side of the road it was ice free. That shows what a little persistent sun or shade can do at this time of year. 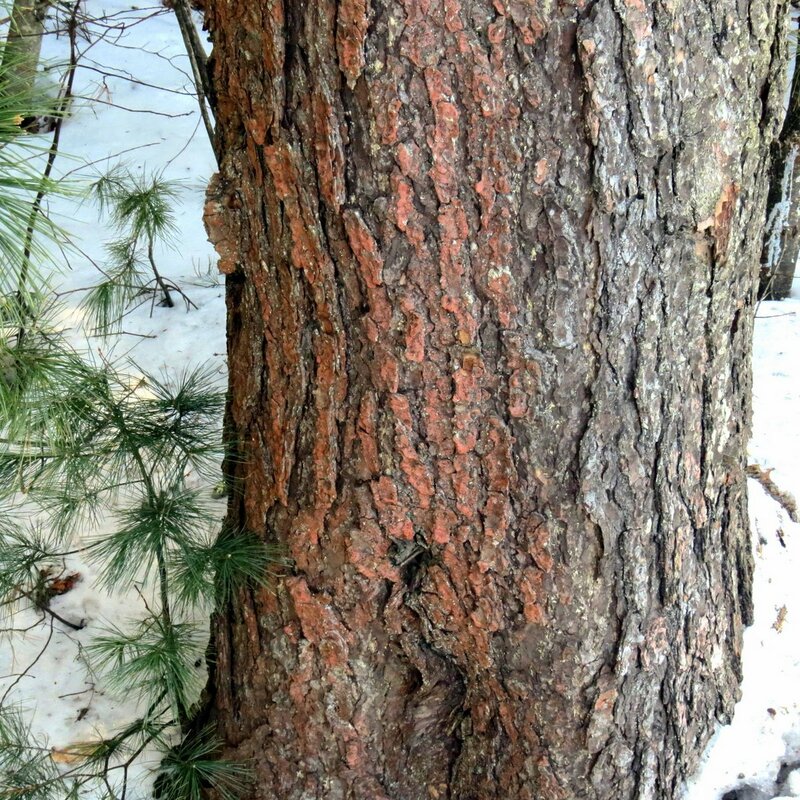 This is the tree that first got me wondering why some Eastern Hemlocks (Tsuga canadensis) had red on their bark when most didn’t. 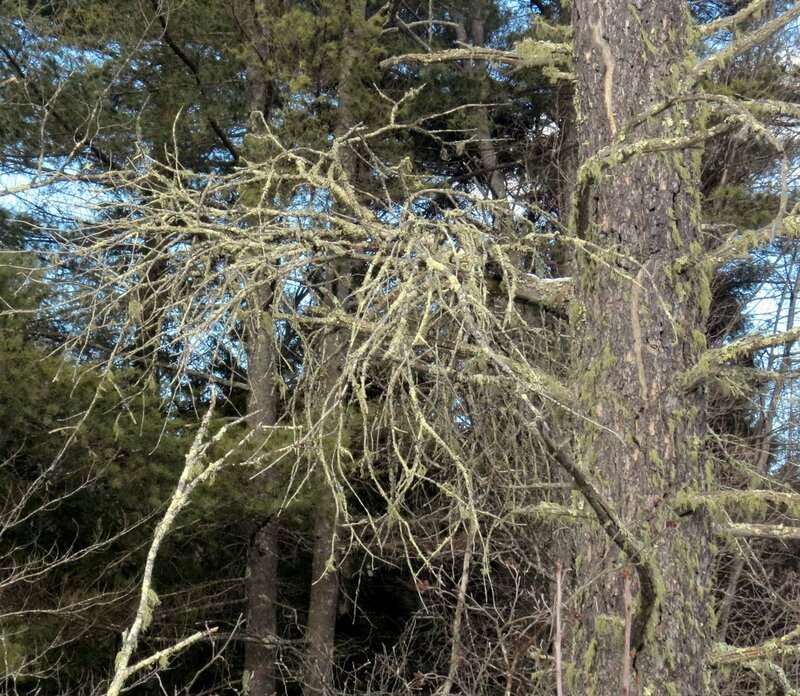 I’ve never been able to answer that question so I don’t know if it’s caused by algae, or is some type of loosely knitted lichen, or if it is simply the way the tree’s genes lean. 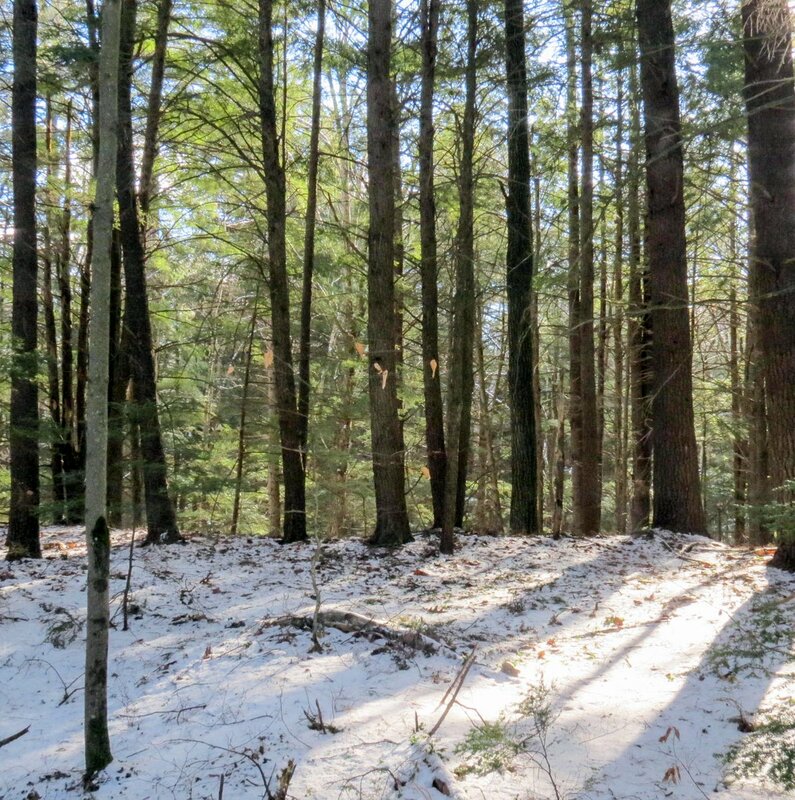 My lunchtime walk sometimes found me sitting in the cool forest on an old fallen hemlock tree, with this as my view. 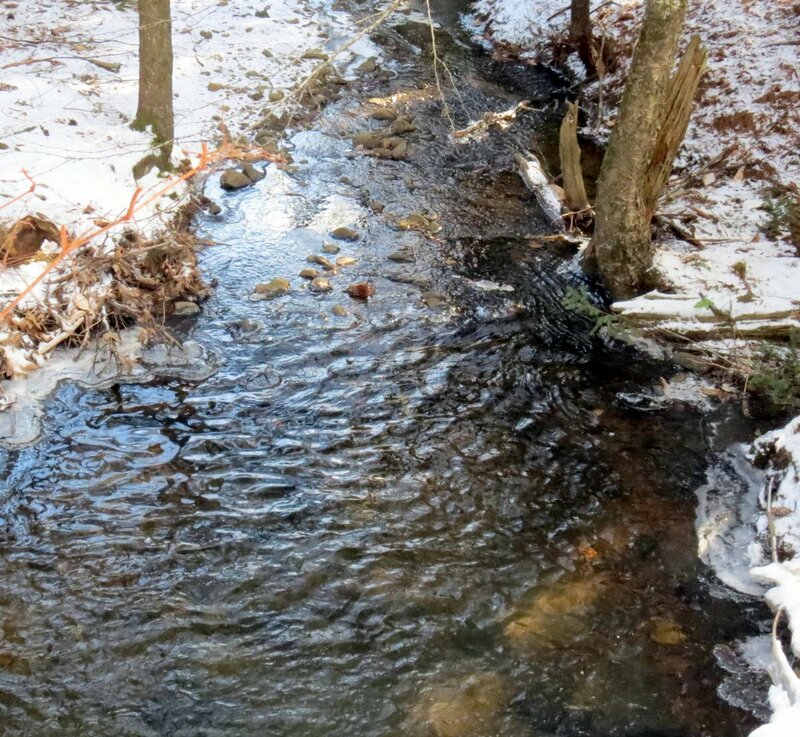 Just over the rise, a short way through the forest, is a stream that feeds into the swamp we saw previously. This is a cool place on a hot summer day and one that I used frequently. Sometimes it was hard to go back to work but you need discipline when you work from home and I always made it back in time. It was fun taking this walk again for this post. So many good memories! 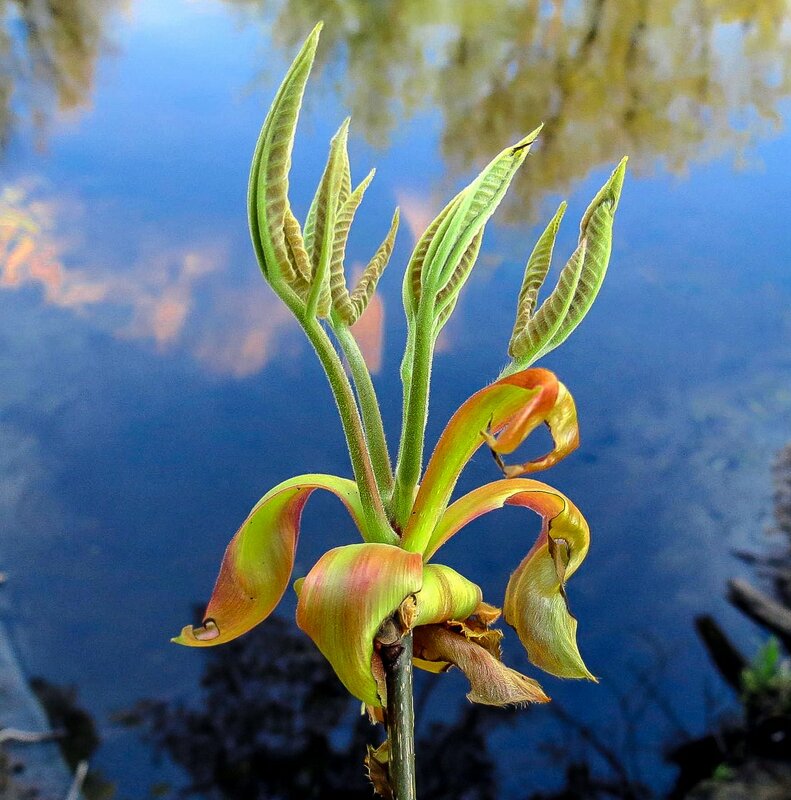 We had another couple of warm days last weekend with temps in the high 40s F, so I decided to go and check on the skunk cabbages (Symplocarpus foetidus) to see how they were doing. They are our earliest flowers, often flowering in March, and they grow around the swamp in the above photo, which is one of only two places I’ve seen them. 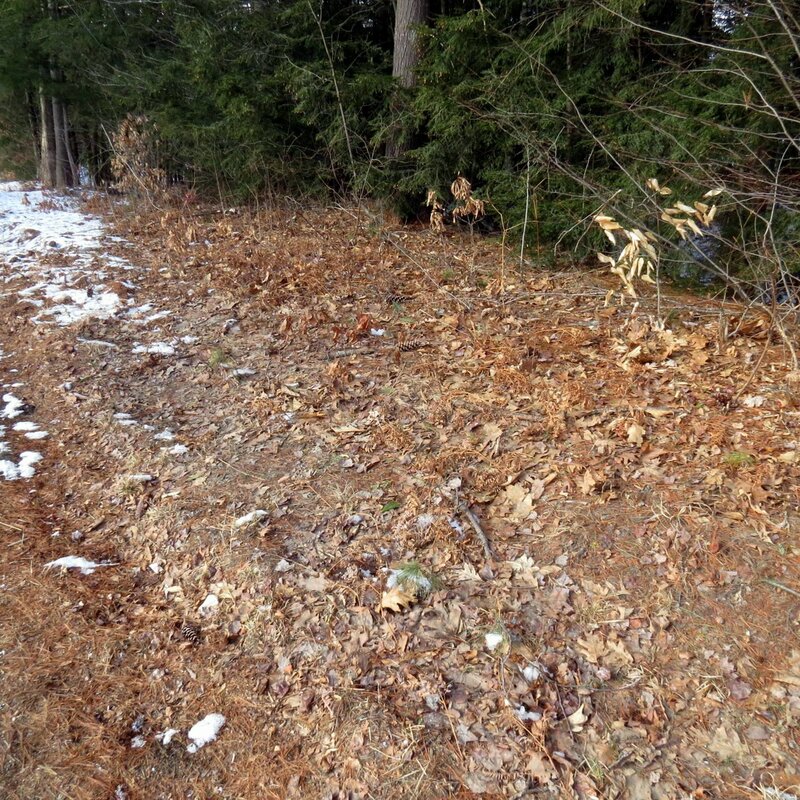 I doubted I’d see any since it’s only January but there was a single green shoot, probably still there from last fall. 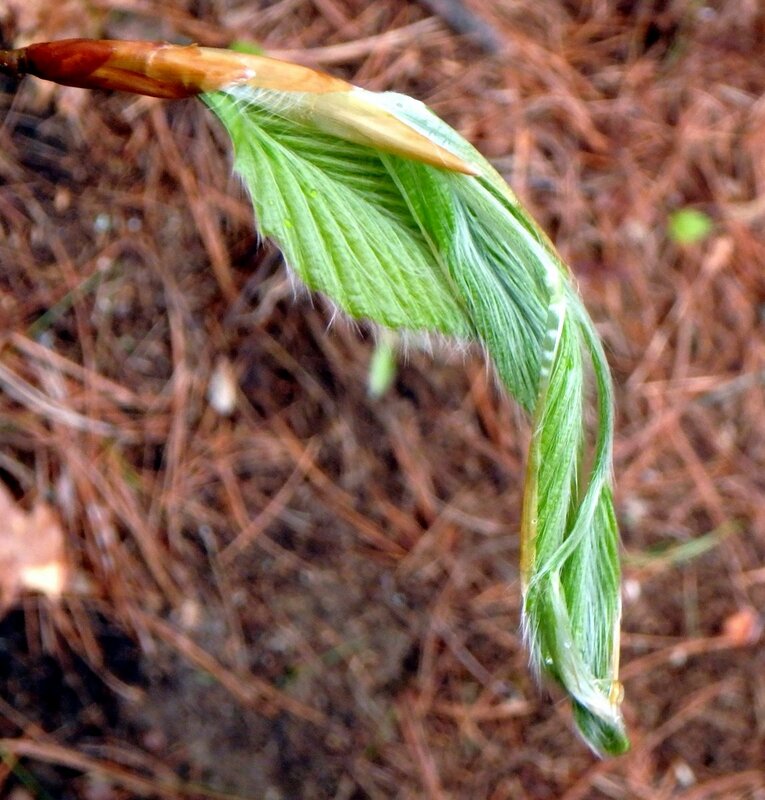 This is not a flower bud though, it is a leaf bud. Skunk cabbage is an arum and the actual flowers are hard to see because they blossom inside a spathe. A spathe is a modified leaf which in skunk cabbages usually is colored a splotchy, mottled yellow and maroon. 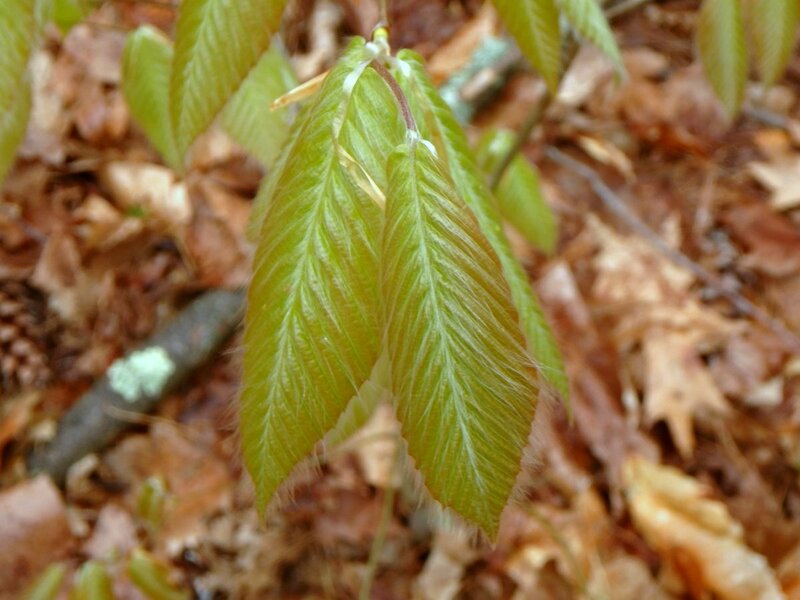 True leaves appear around mid-April when the plant is done flowering. 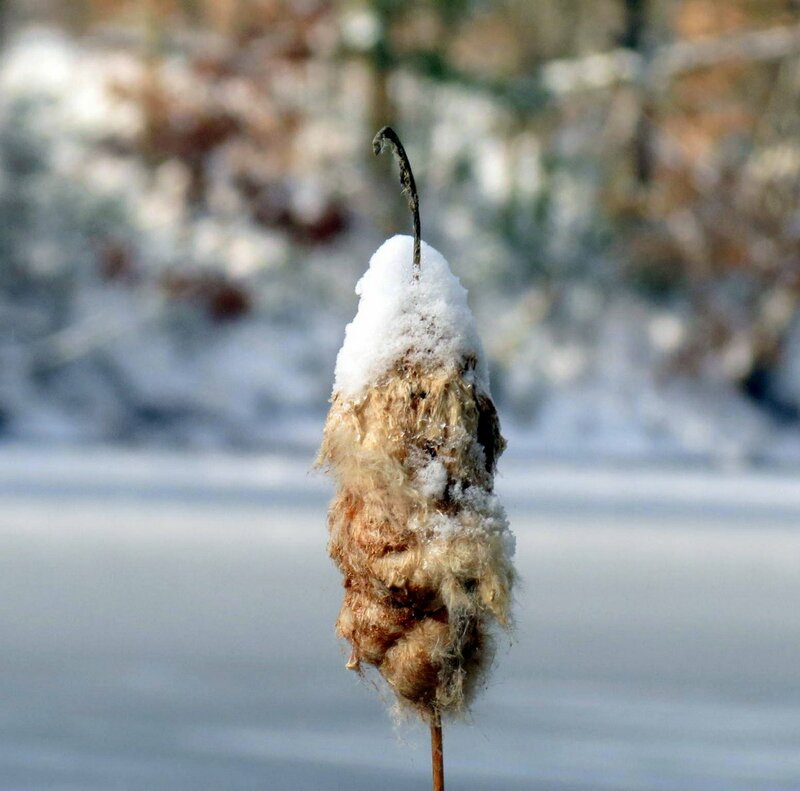 Do cattails (Typha latifolia) produce new shoots in the fall or in spring? I wondered when I saw these. 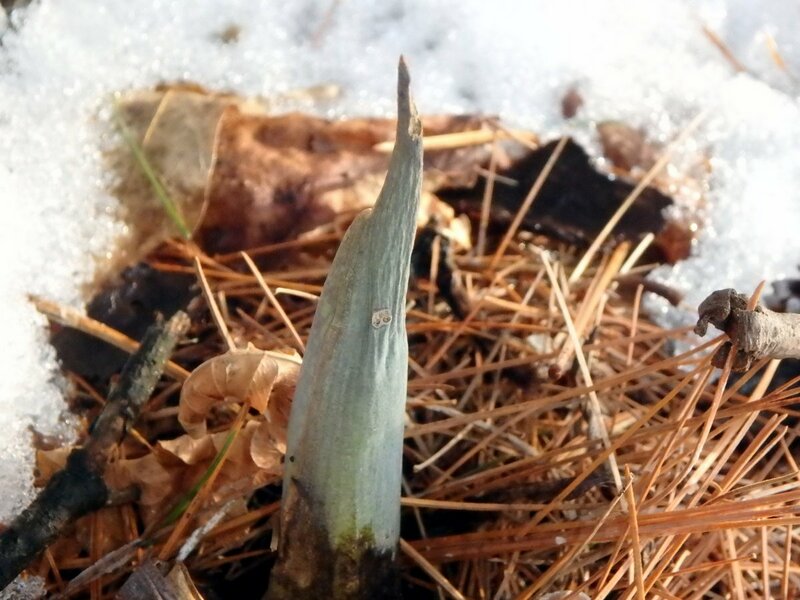 When I looked them up I read that new shoots appear in spring, but this is January. 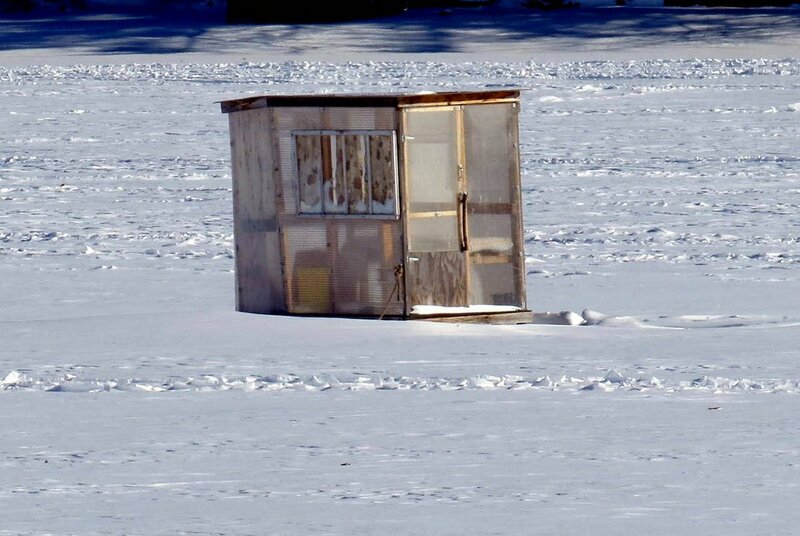 I have a feeling they appeared last fall and are just biding their time until it warms up. 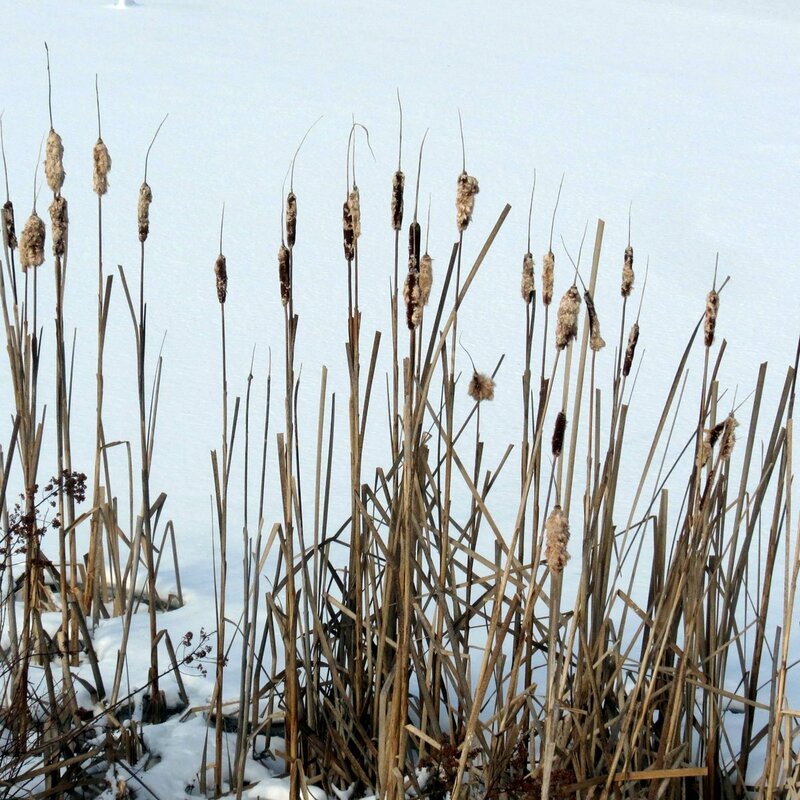 Native Americans wove cattail leaves into waterproof mats and used them on their lodges. 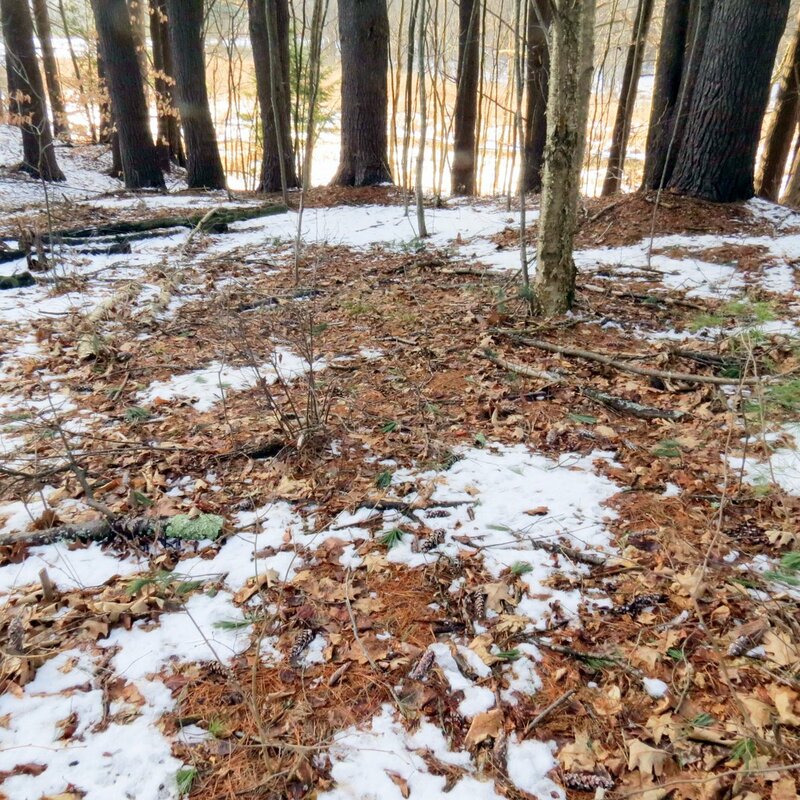 The approach to the swamp is through the woods shown here and then down the steep embankment in the distance, so I was glad there wasn’t much snow to slip and slide in. 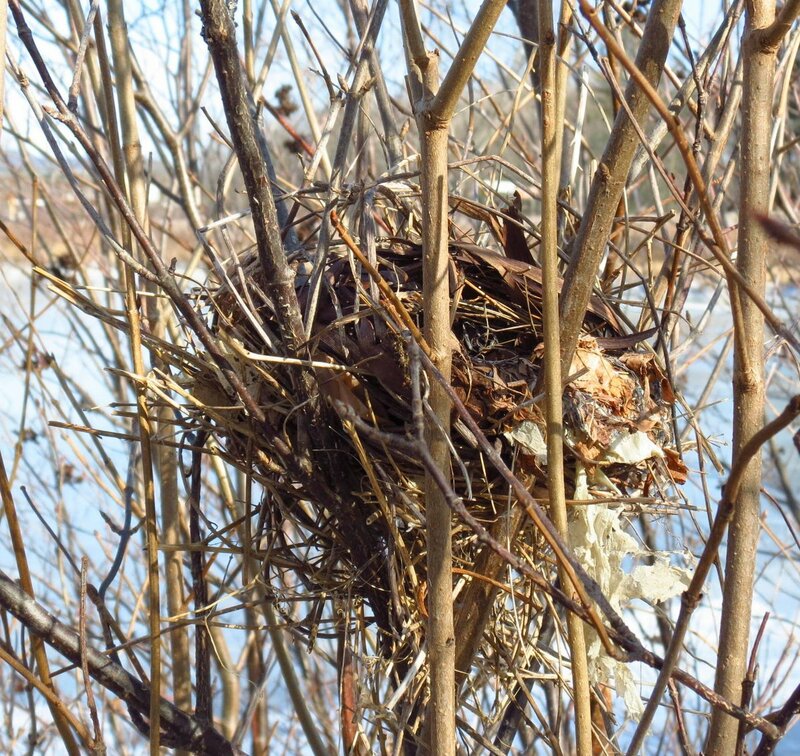 I saw a bird’s nest and wondered, because of the way it hung from branches, if it was a Baltimore oriole’s nest. It was about as big around as a coffee mug and hung in a shrub at about waist high, which seems much too low for an oriole’s nest. The ones that I’ve seen have always been quite high up in the trees. 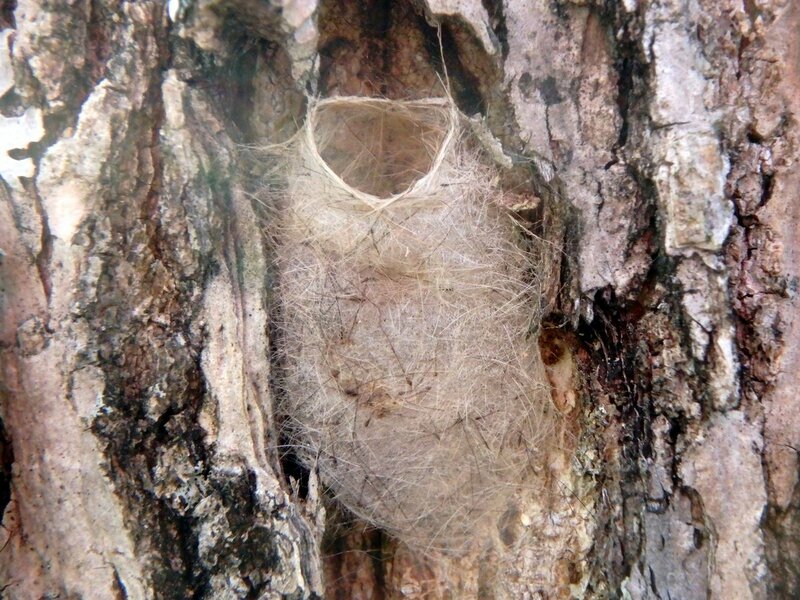 Maybe there are other birds that weave nests that hang. 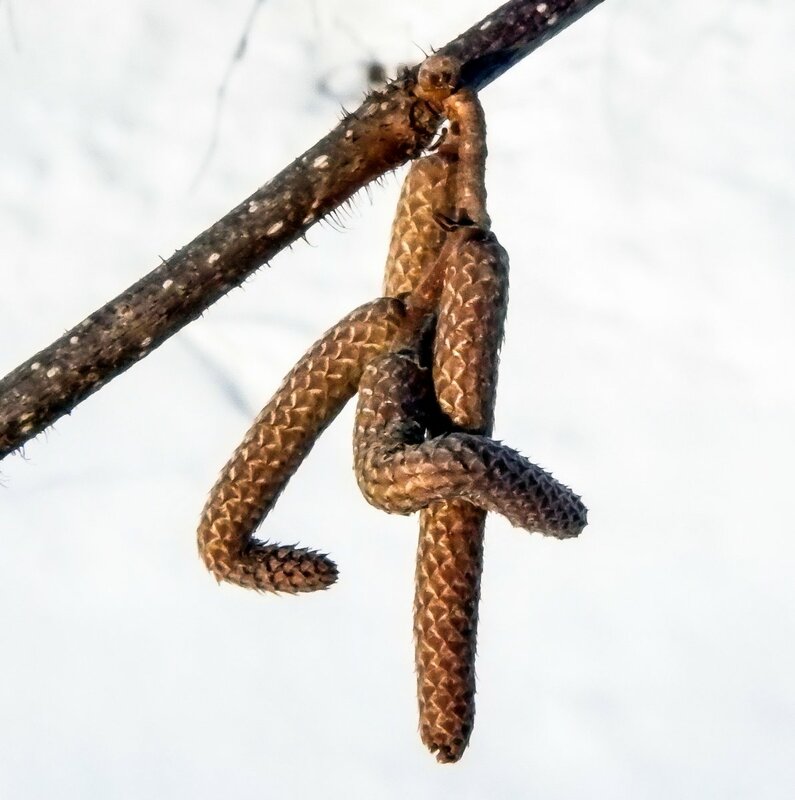 This photo shows how the bird hung the nest in the V shaped crotch of a branch. It is hung from 3 points for stability. 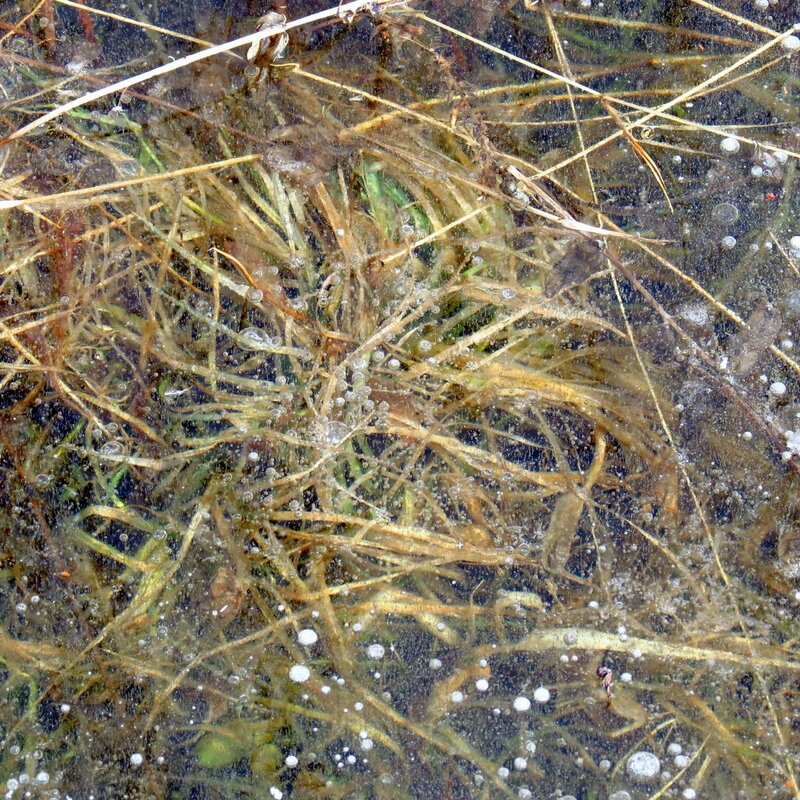 Grasses, cattail leaves and birch bark is what the nest was mostly woven from. 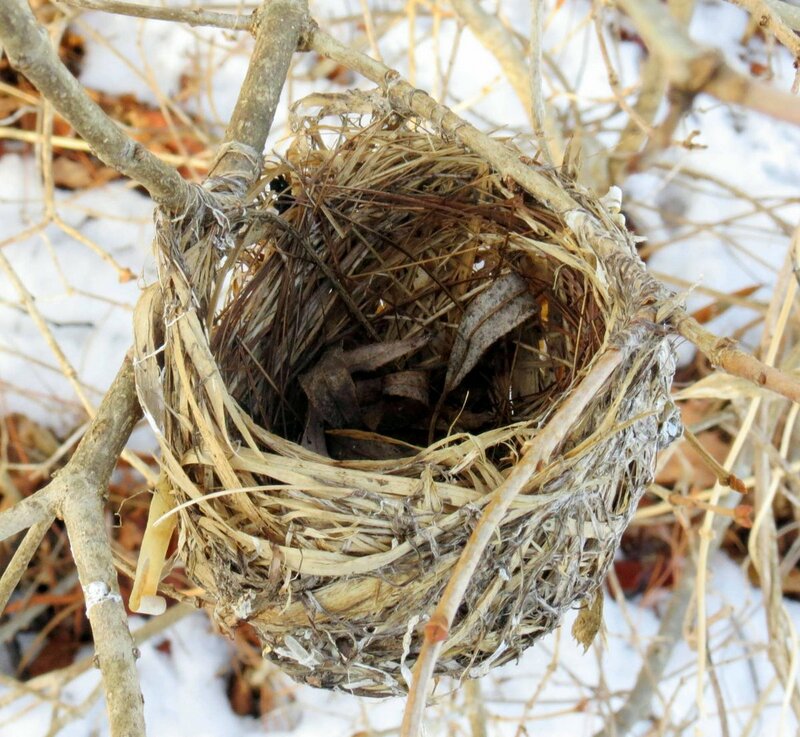 I wonder if Native Americans first learned to weave baskets by studying bird nests. The shiny evergreen leaves of goldthread appeared by the place where skunk cabbages grow and surprised me, because I’ve never seen them here. Goldthread (Coptis trifolia) gets its name from its bright yellow, thread like root. 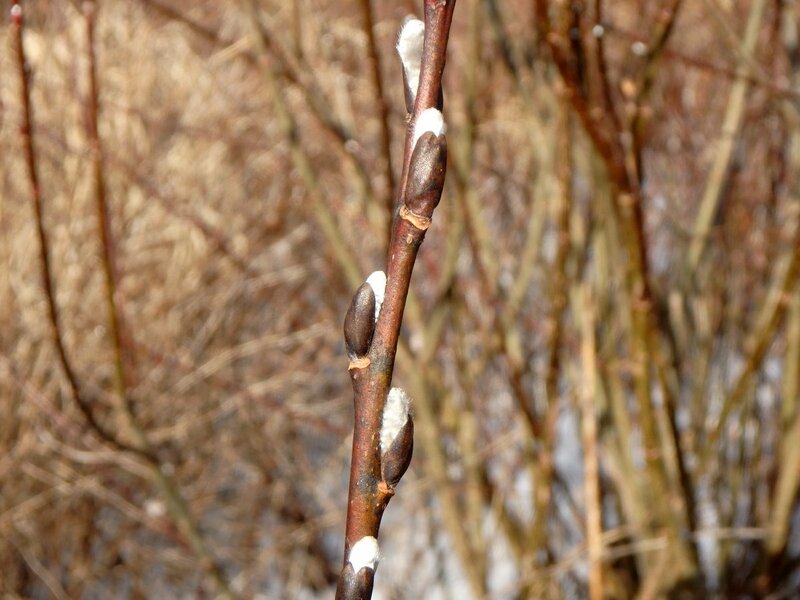 Tiny but beautiful white flowers will appear in late April. 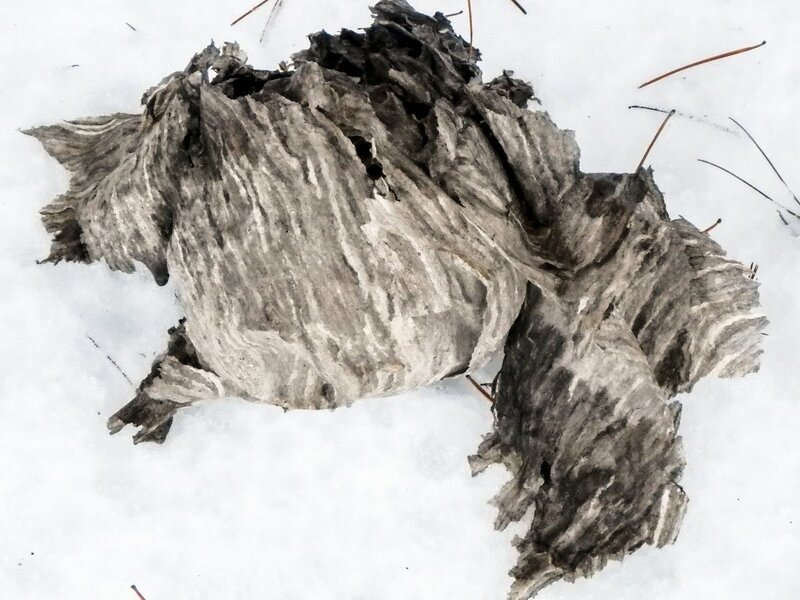 Native Americans chewed the roots of goldthread to treat canker sores, which is why the plant is also called Canker root. The natives shared the plant with the English settlers and it became such a popular medicine that by 1785 shakers were paying 37 cents per pound for it dried, which meant people dug up all they could find. 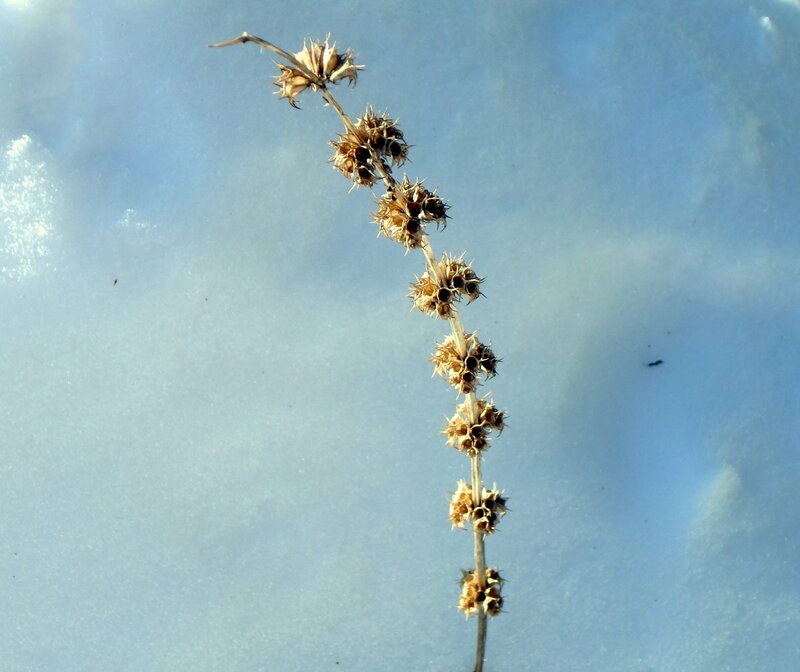 At one time there was more goldthread sold in Boston than any other native plant. Luckily after a couple of centuries the plant has recovered enough to be relatively common once again. 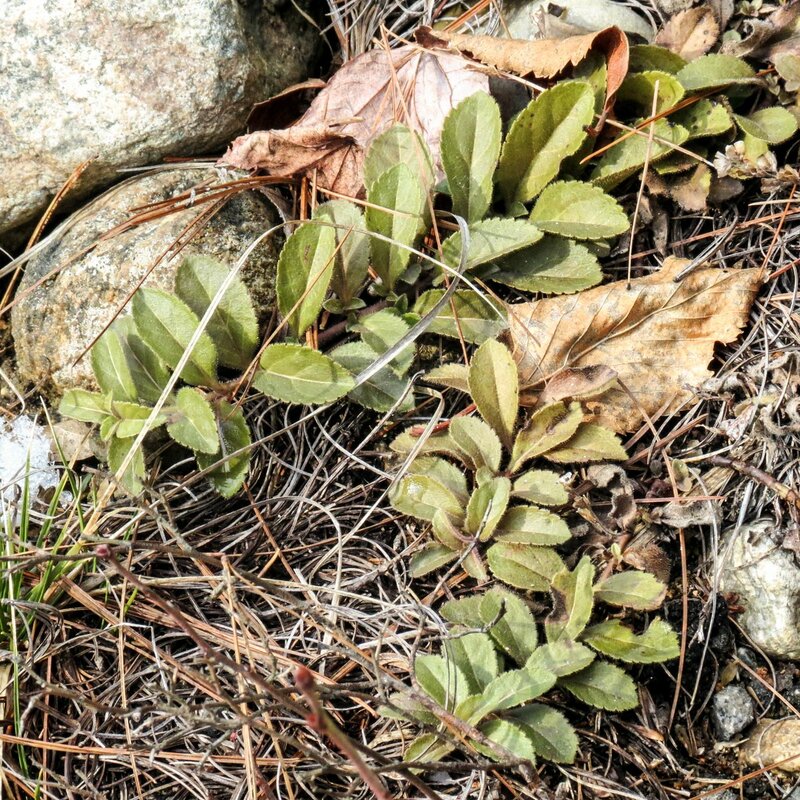 Partridgeberry (Mitchella repens) is a native plant that makes a good garden groundcover. 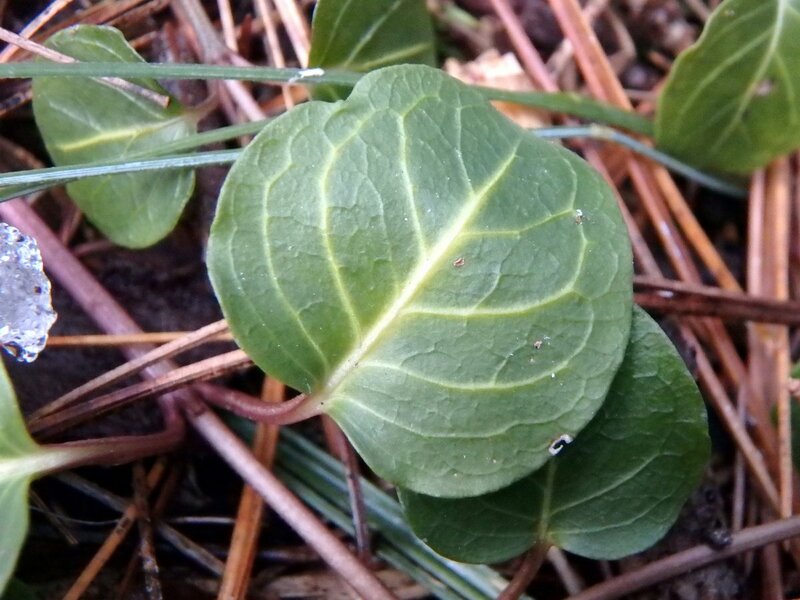 Small, heart shaped leaves on creeping stems grow at ground level and you can mow right over it. In spring it has white trumpet shaped flowers that grow in pairs and in the fall it has bright red berries which are edible but close to tasteless. I leave them for the turkeys, which seem to love them. My favorite parts of this plant are the greenish yellow leaf veins on leaves that look as if they were cut from hammered metal. I have several large patches of it growing in my yard. 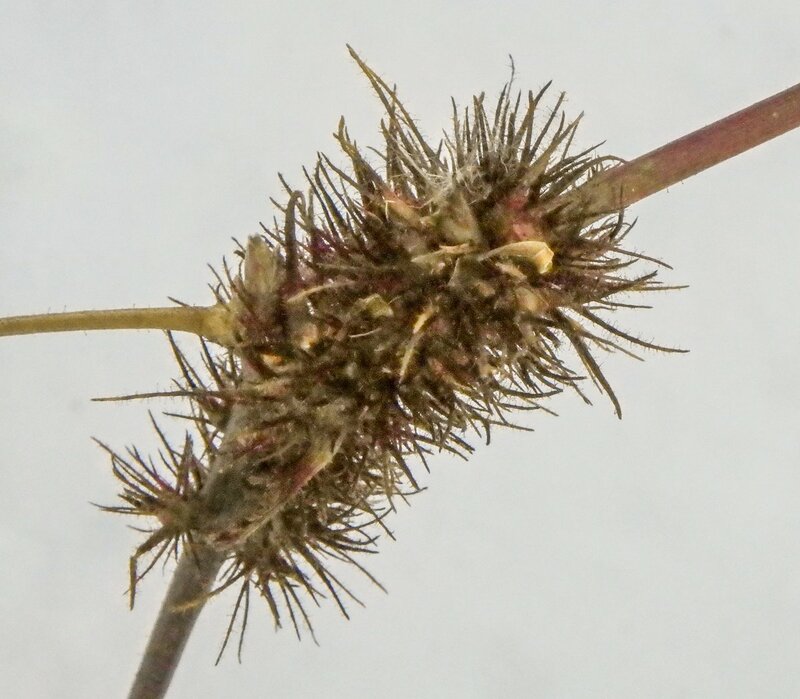 The small blackish bead-like sori that make up the fertile fronds of the sensitive fern (Onoclea sensibilis) will open to release the spores soon. Sensitive fern is another good indicator of moist places, so I wasn’t surprised to see it here. 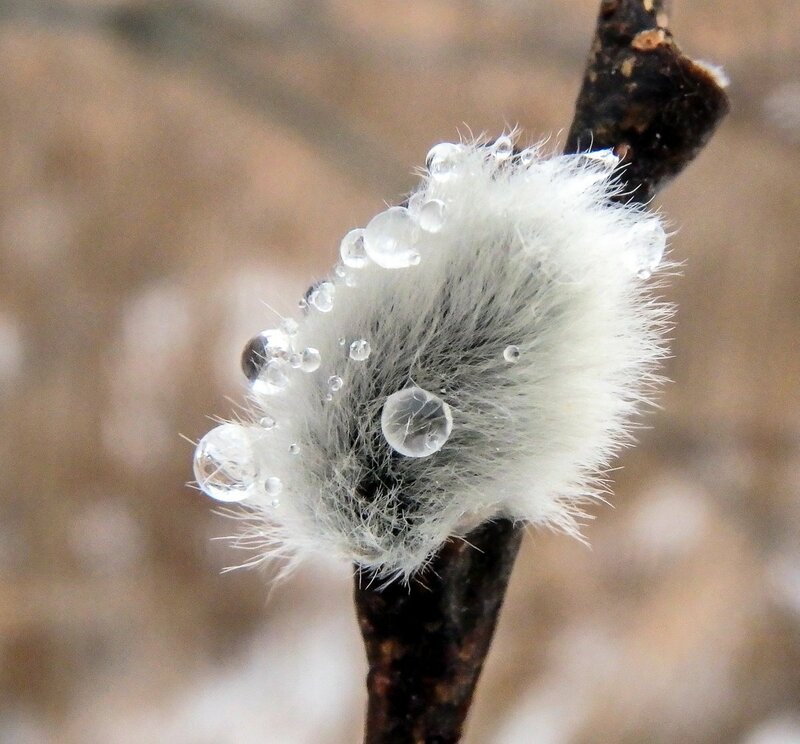 Its common name comes from its sensitivity to frost, which was first noticed by the early colonials. 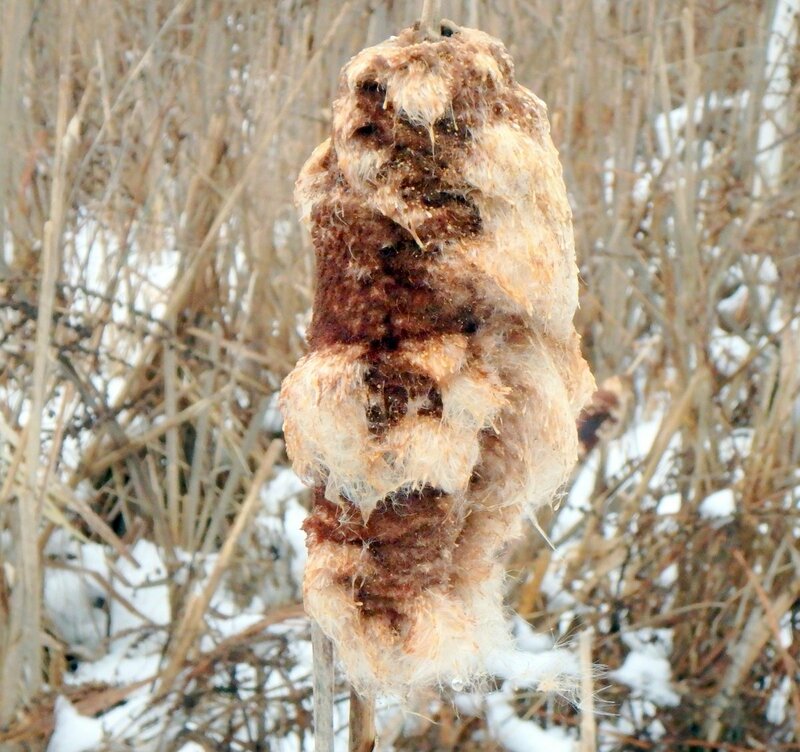 I just read that turkeys will peck at and eat the sori, and that is why sometimes you find the fern’s spores lying on the snow around the plant. These oak leaves were pretty amazing for January, warm day or not. 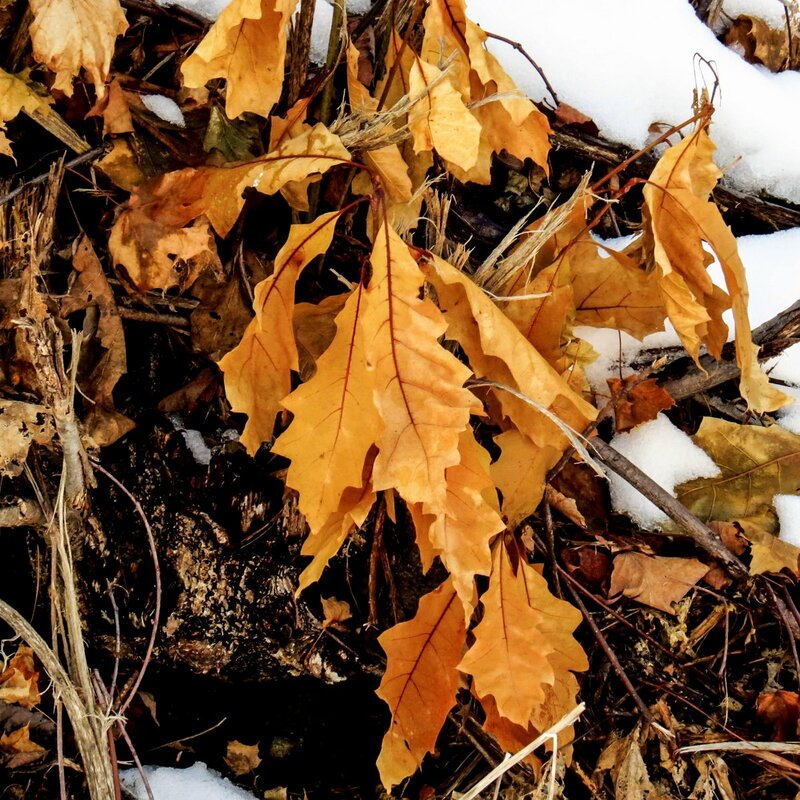 I’m not sure how they did this; most other oak leaves I’ve seen this winter have been brown, or sometimes pinkish brown. 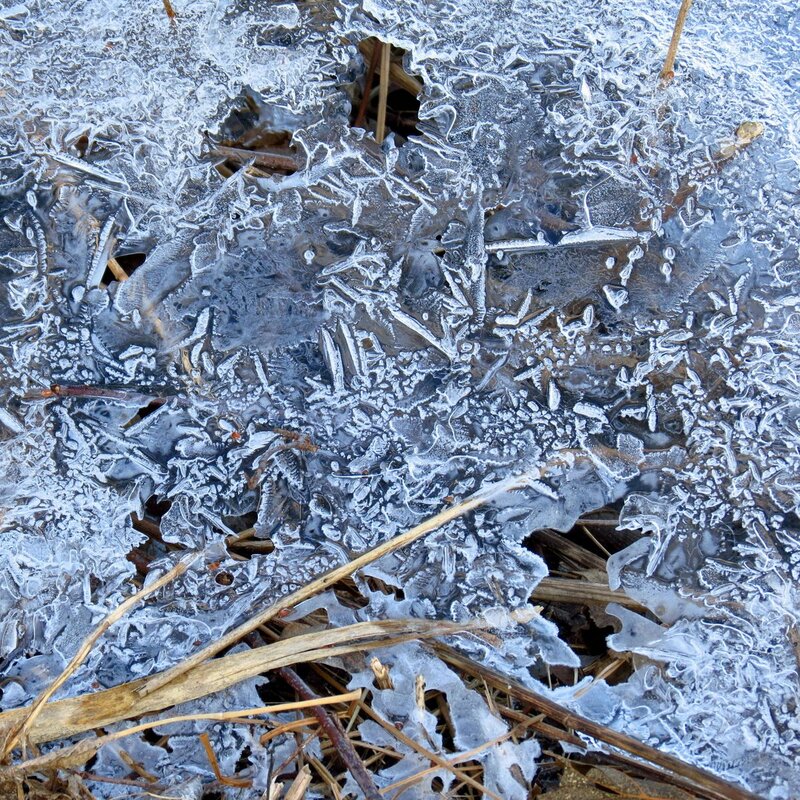 Maybe these were flash frozen in November, I don’t know, but it was a pleasure to see them. 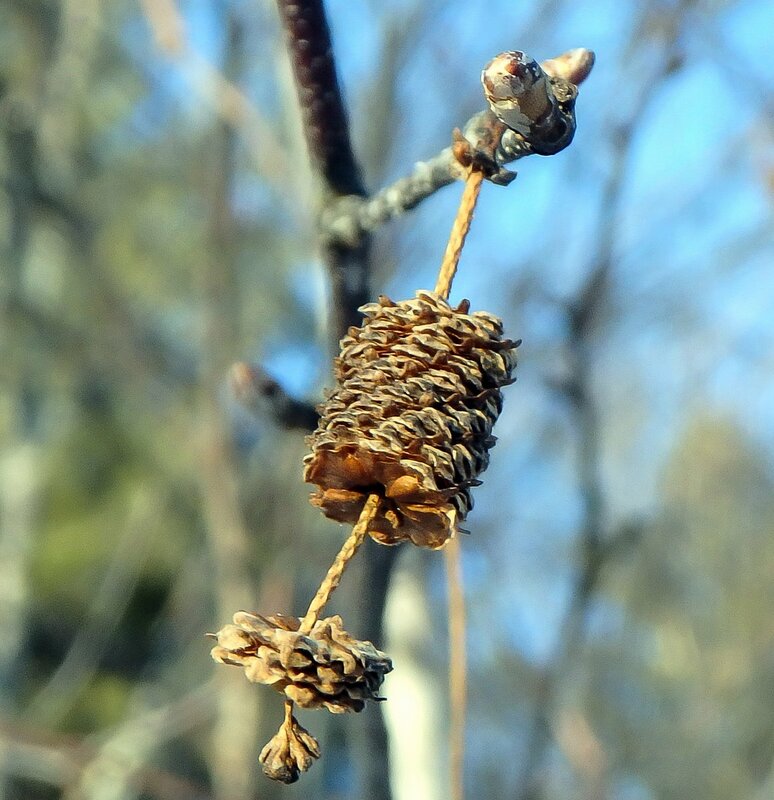 We saw more pine cones fall from the white pines (Pinus strobus) this year than most of us have ever seen and the squirrels are reaping the harvest. 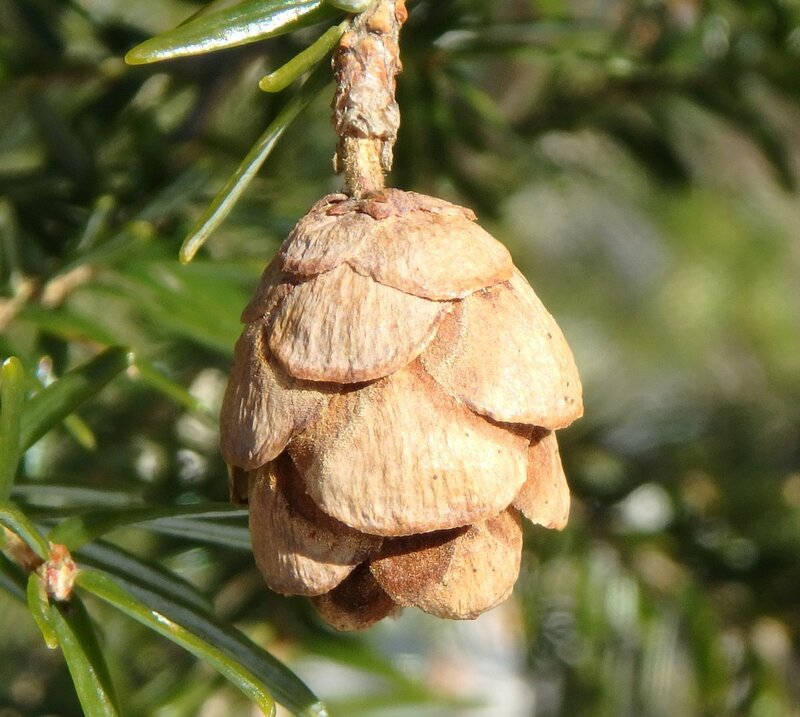 They pull the cones apart scale by scale and eat the seeds, and big piles of scales are a common sight in the woods. Squirrels like to sit up higher than the surrounding landscape when they eat and often sit on stones or logs. 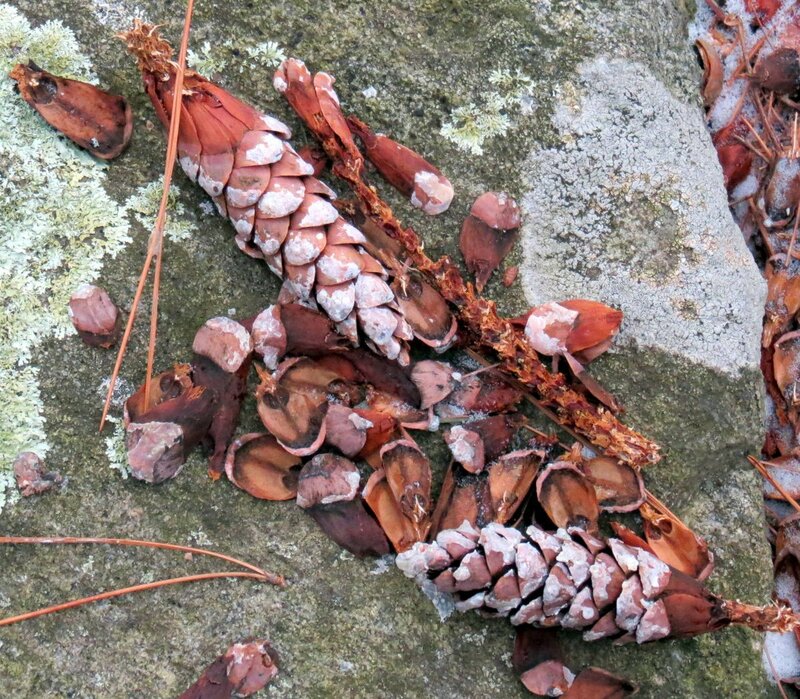 This is what’s left of a white pine cone when a squirrel is finished with it. Not much. 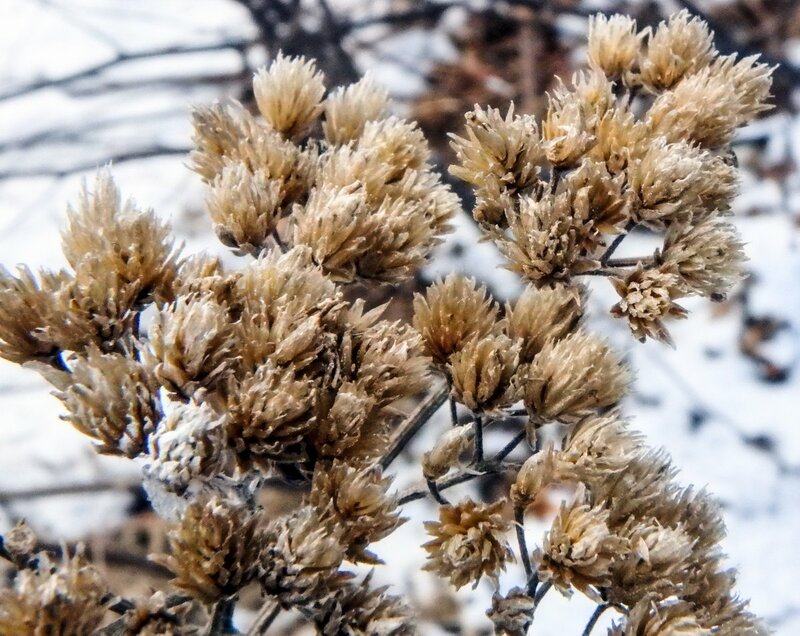 There are plenty of goldenrod and other seeds to keep the birds happy this year as well. 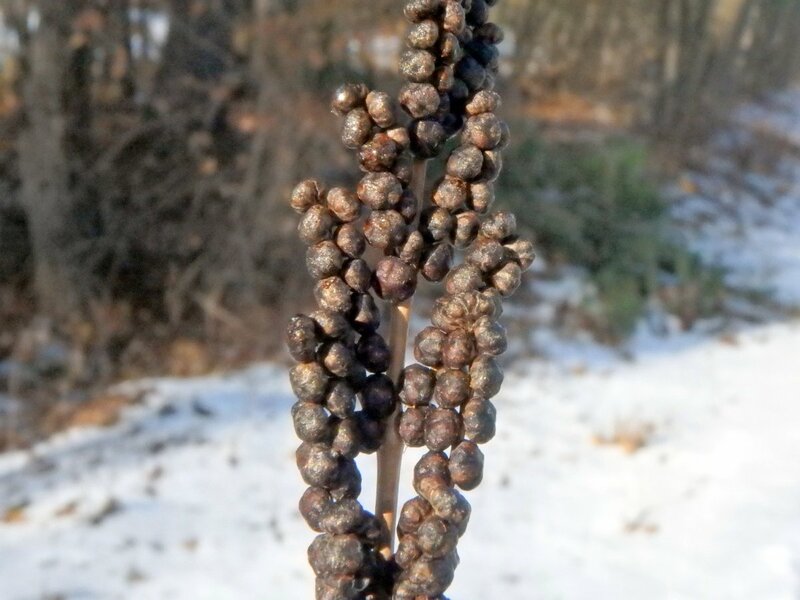 American hazelnut (Corylus americana) catkins are a common enough sight in the winter but I’m not sure what these examples were doing. They usually hang straight down but a couple of these decided to be different. 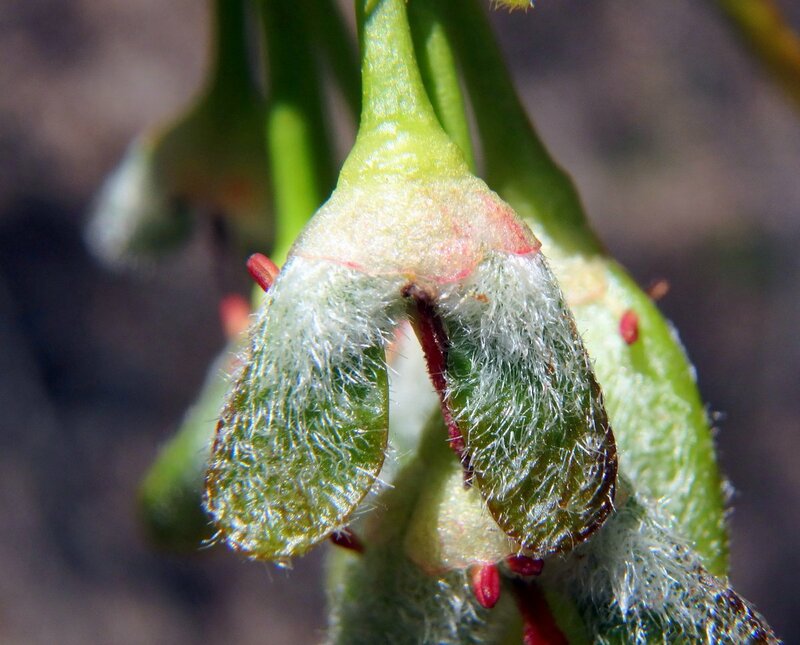 These are the male flowers of the hazel shrub and before long, usually in mid-April, they will begin to show pollen and turn golden yellow. Turkeys, squirrels and many other birds and animals usually eat hazelnuts up quickly so I was surprised to see quite a few nut clusters still hanging from the branches. It could be that the bumper crop of acorns is keeping the animals busy. 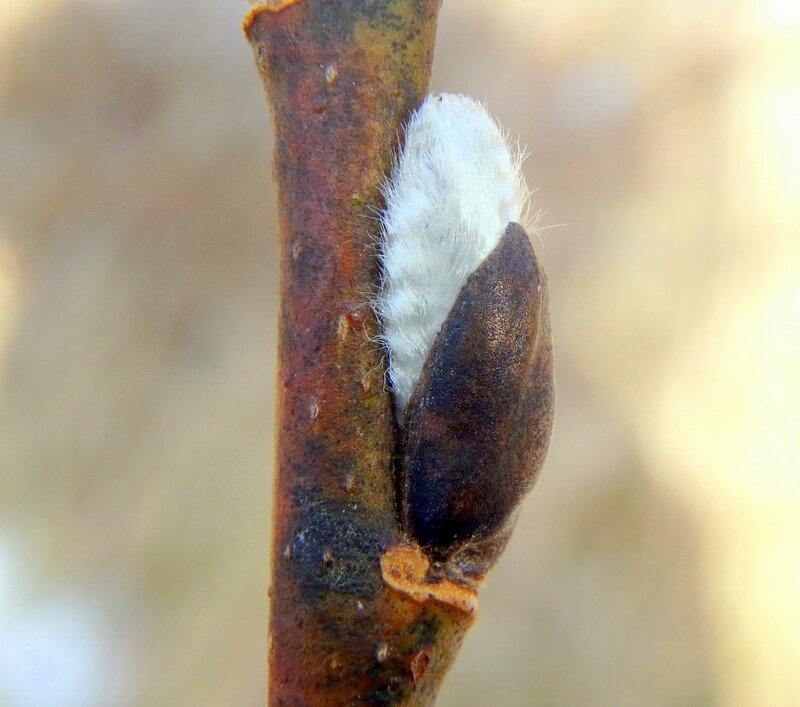 Blackberry seed gall is caused by the blackberry seed gall wasp (Diastrophus cuscutaeformis.) 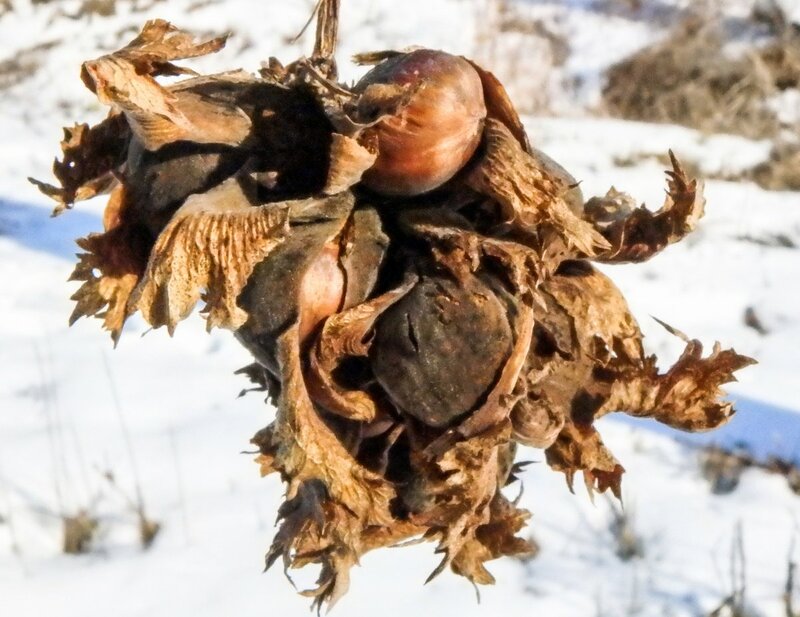 These very small, round hollow galls look like seeds and form in clusters around blackberry stems. 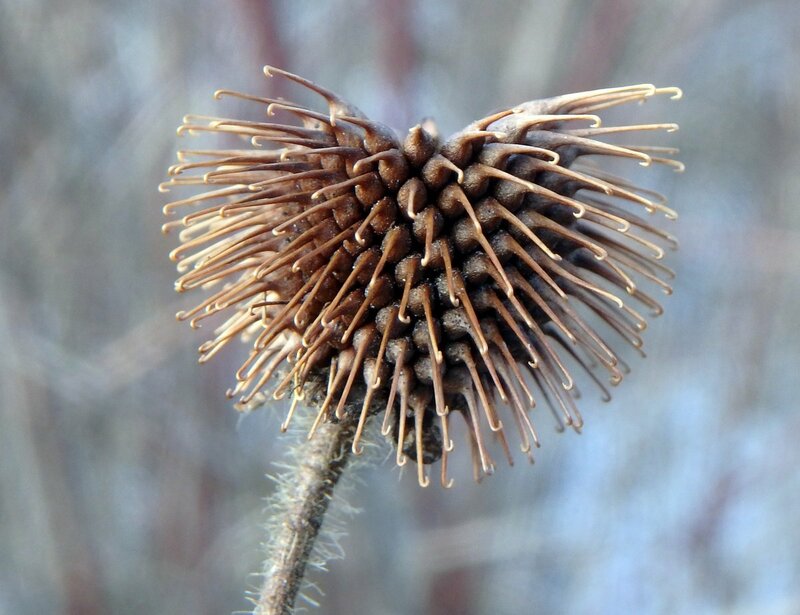 Each tiny gall has a stiff, hair like spine and together they form a hairy mass like that in the photo. 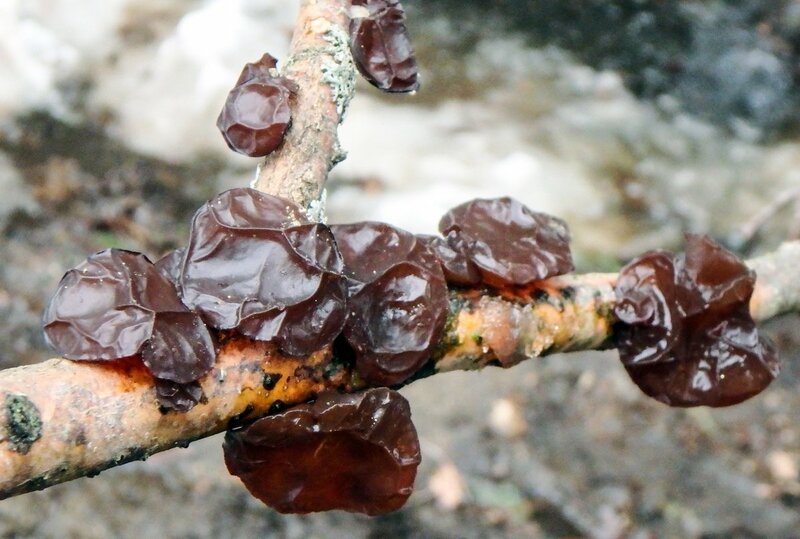 They start out bright yellow-green and mature to brownish red. This one was about as long as your index finger. I hoped the vine I saw up in a tree was American bittersweet (Celastrus scandens), but it turned out to be just another invasive Oriental bittersweet (Celastrus orbiculatus,) which is quickly outpacing the natives. 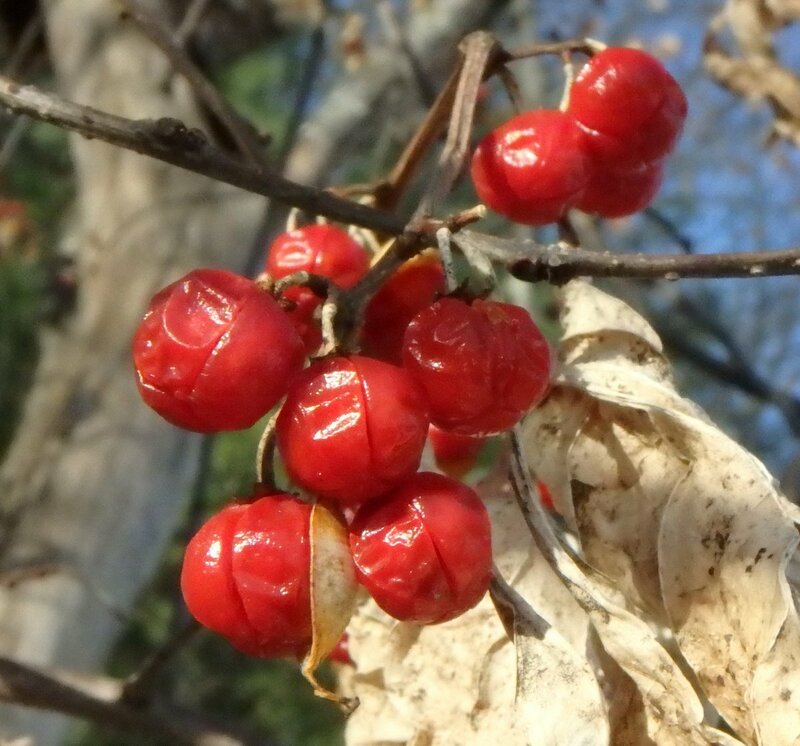 That’s mainly because its berries are more enticing to birds and its seeds germinate much faster. The easiest way to tell American bittersweet from Oriental is by the location of the berries on the vine; American bittersweet berries grow on the ends of the vines and Oriental bittersweet berries grow all along them. 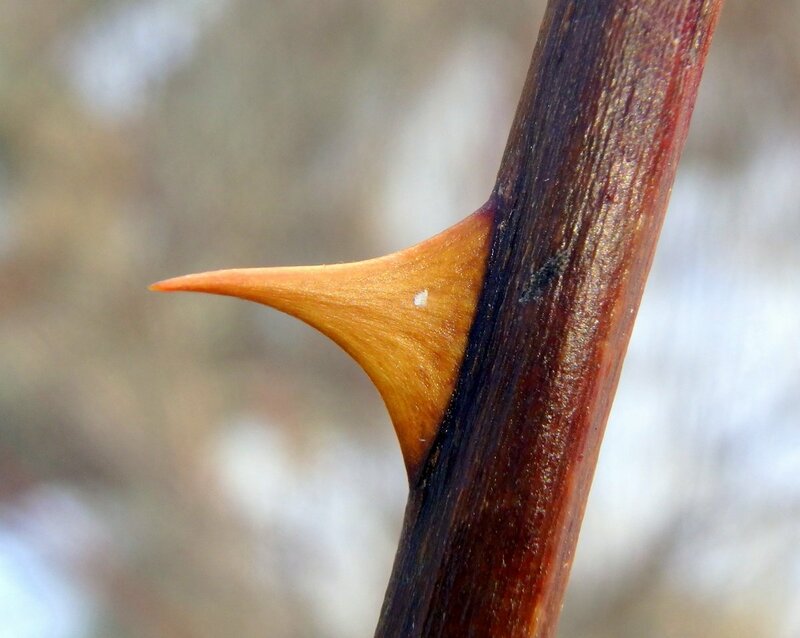 While both vines climb trees and shrubs, American bittersweet is less likely to strangle its host like Oriental bittersweet will. I keep seeing this red inner bark on some dead staghorn sumacs (Rhus typhina) and each time I see it I try to find out why it would be red, but so far I’ve never found an answer. It’s always surprising that such a beautiful color would be hidden from sight. Or maybe it turns red as it peels away. There are often ducks here in this part of the swamp but they probably heard me long before I could have seen them and swam off. 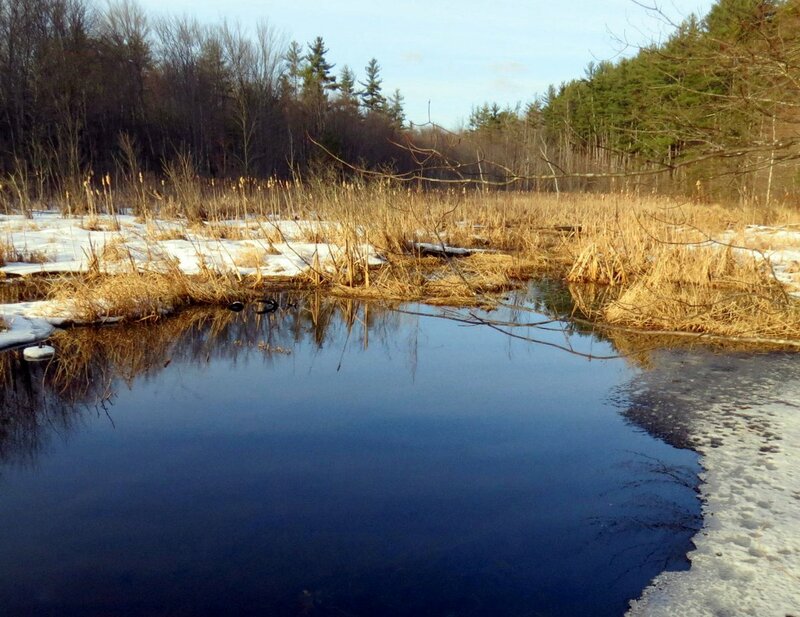 Soon this will be a very busy, growing place full of nesting red winged blackbirds, snapping turtles, herons, ducks, and frogs but for now it is simply open water and quiet and for me, that was enough. 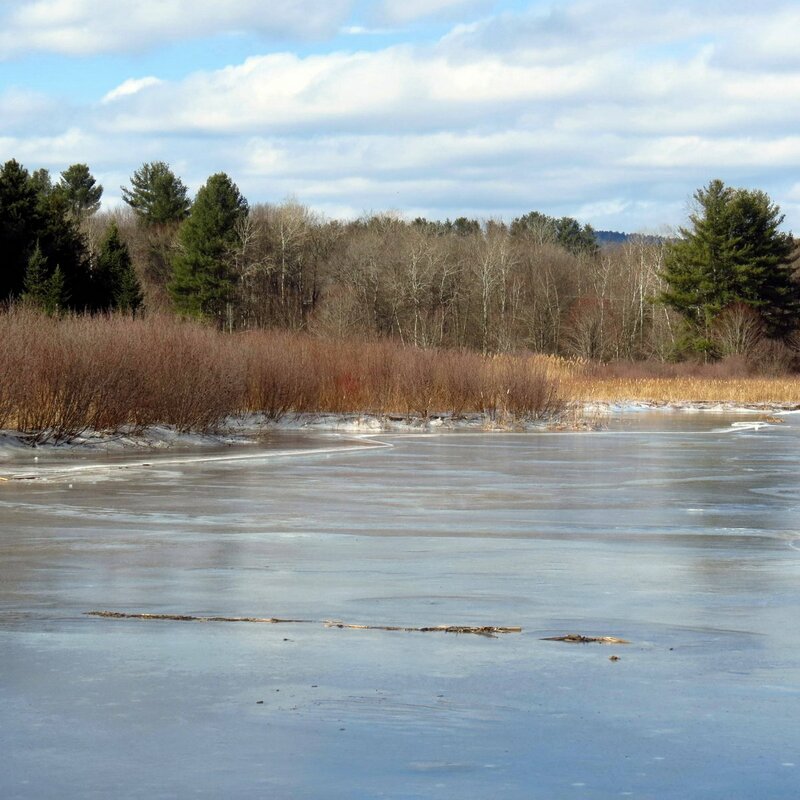 I hope you have a nearby swamp or wetland that you can visit, because they’re fascinating places that are full of life. Yes, I know I’ve shown photos of snow here already this season, but those were of conversational snow that didn’t really count. 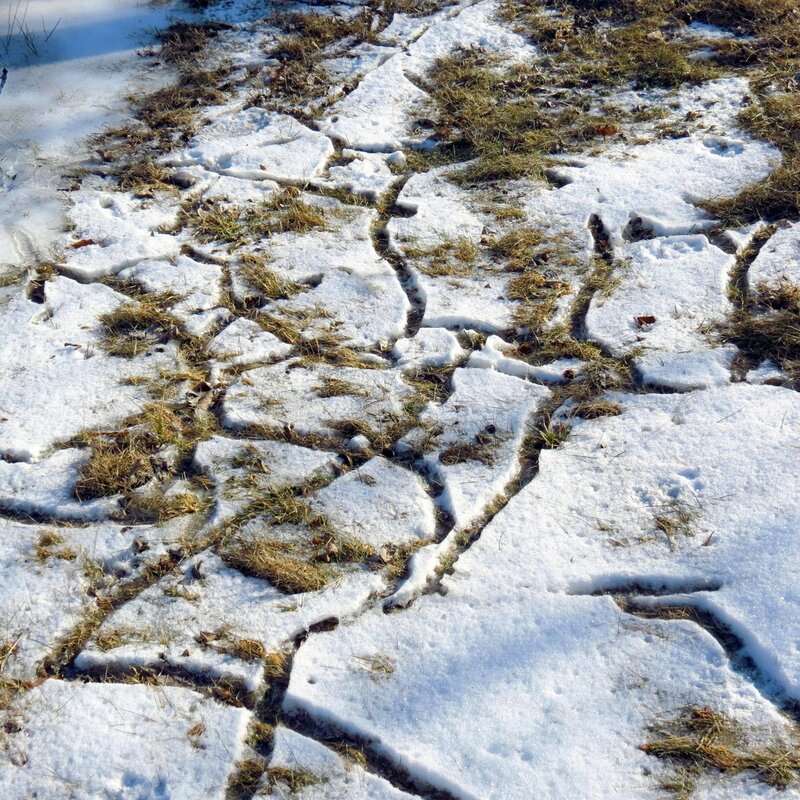 We often start the season with small snowfalls that cause a lot of talk but no action and the last one was one of those. 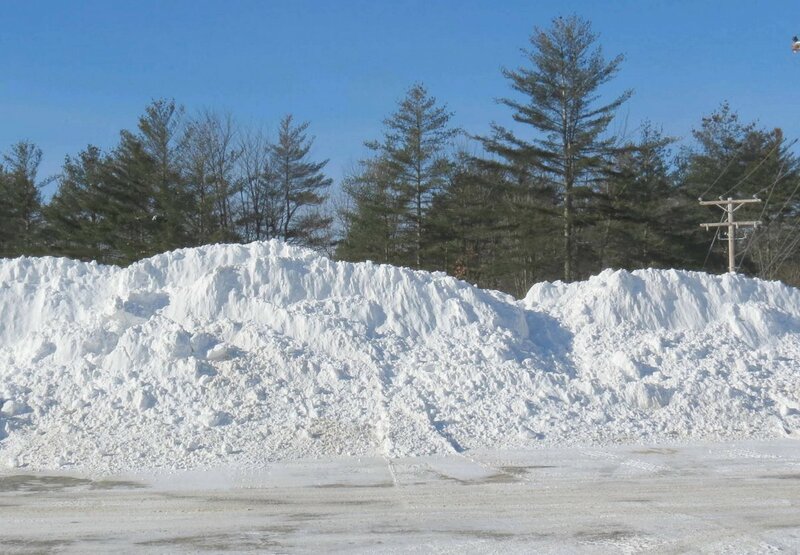 This time though, the snow piled up to about 8-11 inches in two back to back storms and required considerable effort with plows and shovels to get it out of the way. This photo shows what I saw last Sunday morning in my own back yard. 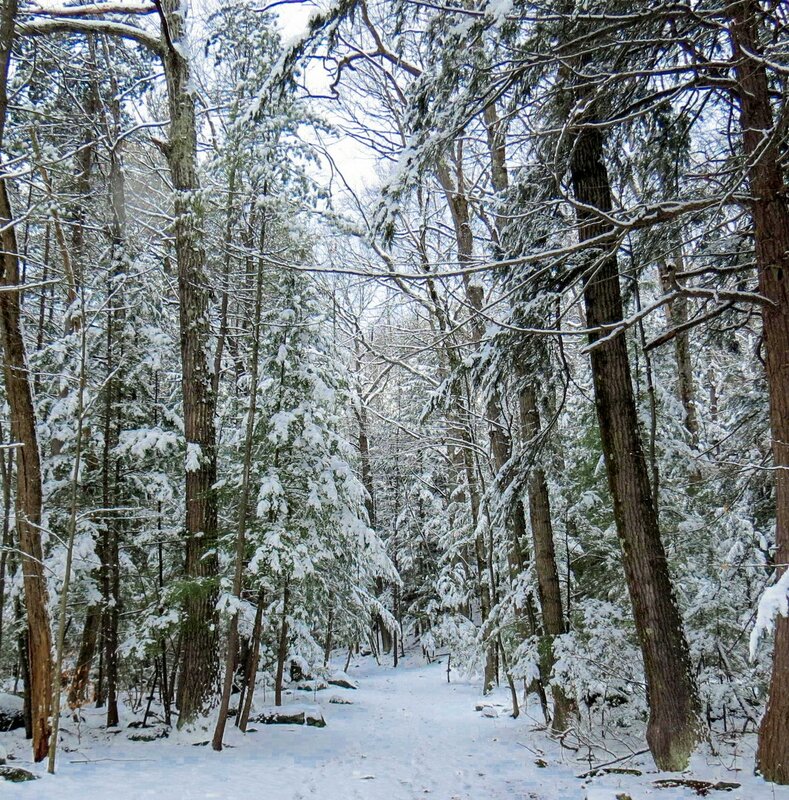 A local trail that I follow sometimes was as snowy as it ever gets. 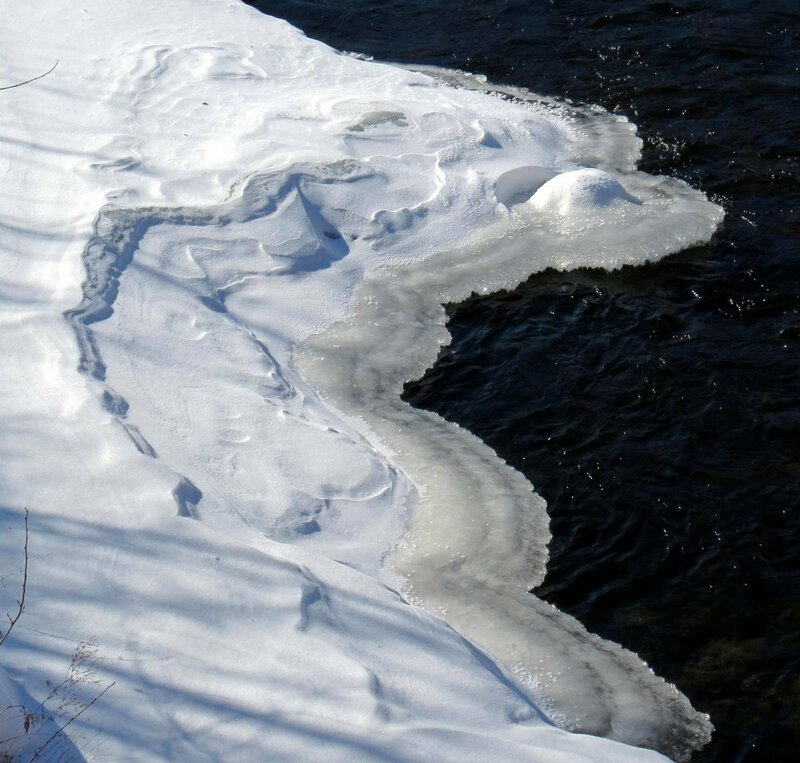 It’s no secret to readers of this blog that I’m not a great lover of winter because of all the added work it heaps upon me, but I can’t deny its beauty, and when I’m not working because of it I love being out in it. 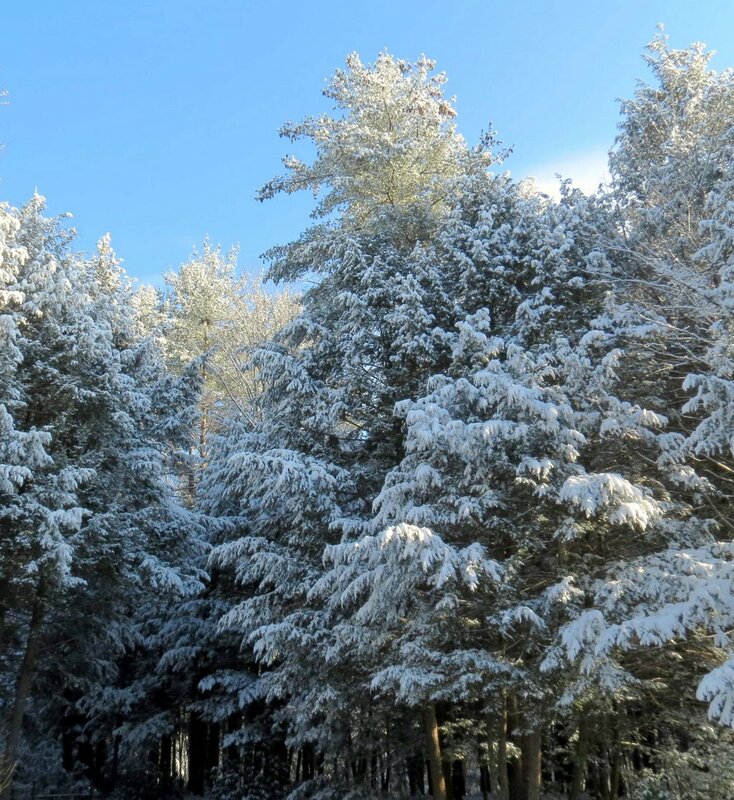 The breeze picked up and snow fell from the trees, creating what I call snow smoke. 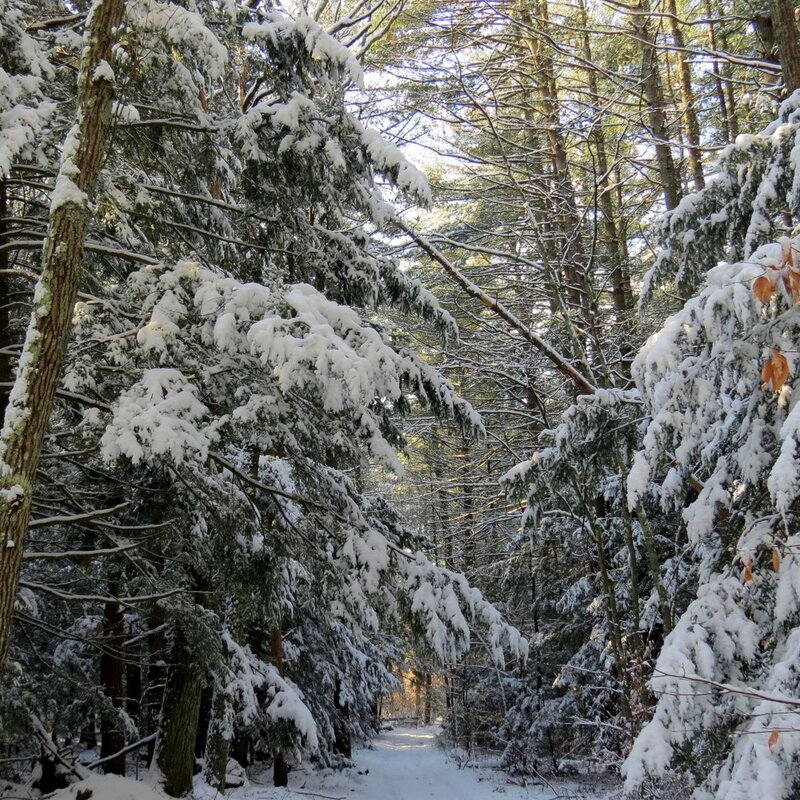 It’s like seeing through a veil of snowflakes and if you’re walking the trail when they fall it feels the same as being caught in a snowstorm. 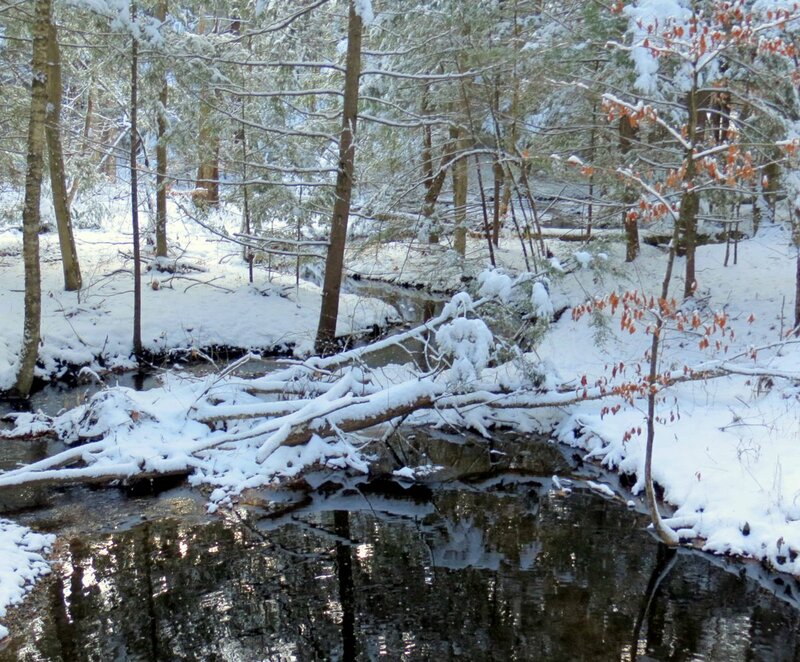 There was so much falling from the trees that day I had to put my camera in a plastic bag. I always carry one in winter and summer. The skies were changeable; one minute sunny and the next cloudy. The bane of photography, because you have to keep changing your settings according to the amount of light coming through the lens, and if you don’t pay attention your photos will come out too dark like this one did. 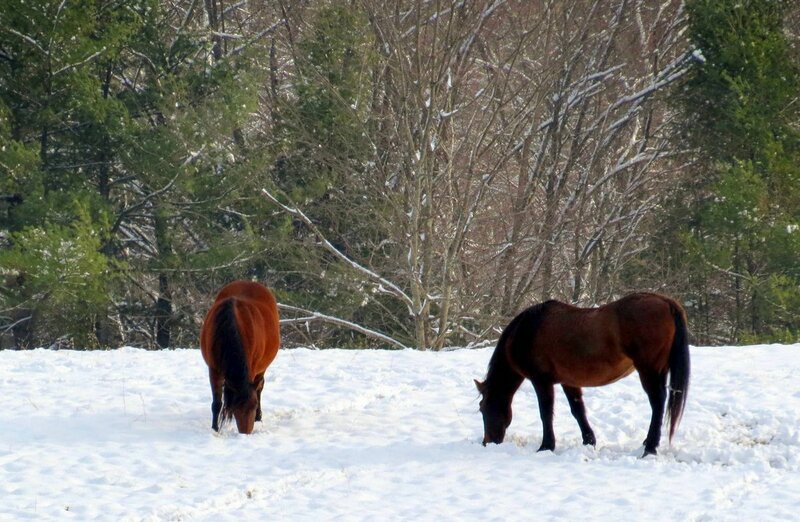 The horses in the pasture in the previous photo pawed at the snow to get at any green shoots and ignored the skies above them. 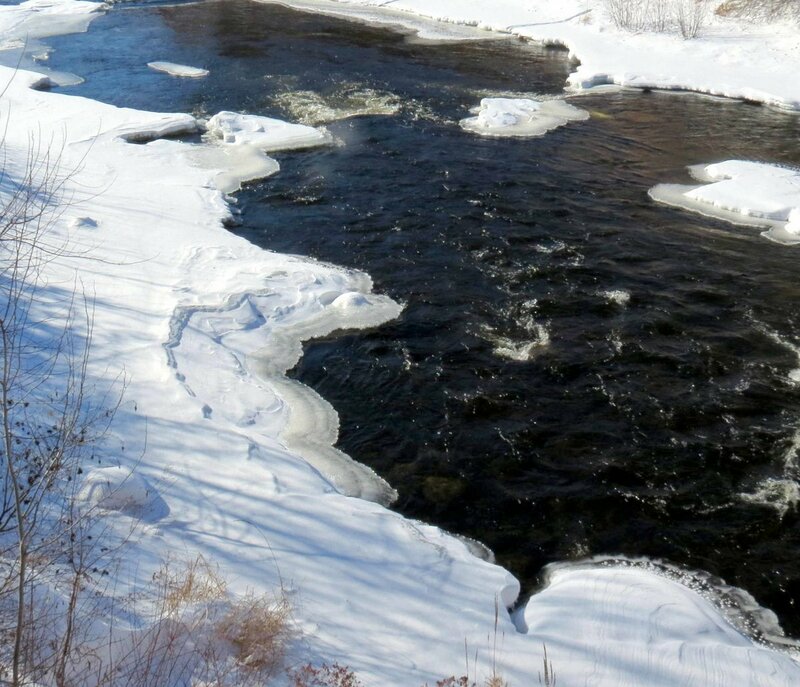 I love how water looks so dark when surrounded by white but just when I didn’t want the sun to come out it did and kind of spoiled the blackness of the stream. 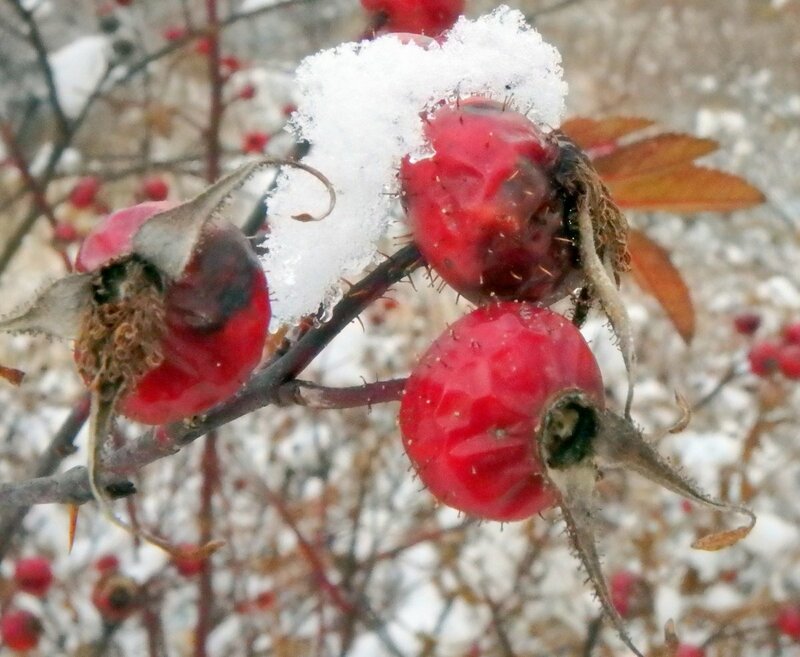 Photos of white snow on red fruit have become common enough to be a cliché, but I was there and the rose hips were there and I had a camera, so there you are. But my thoughts were not of red fruit in white snow. 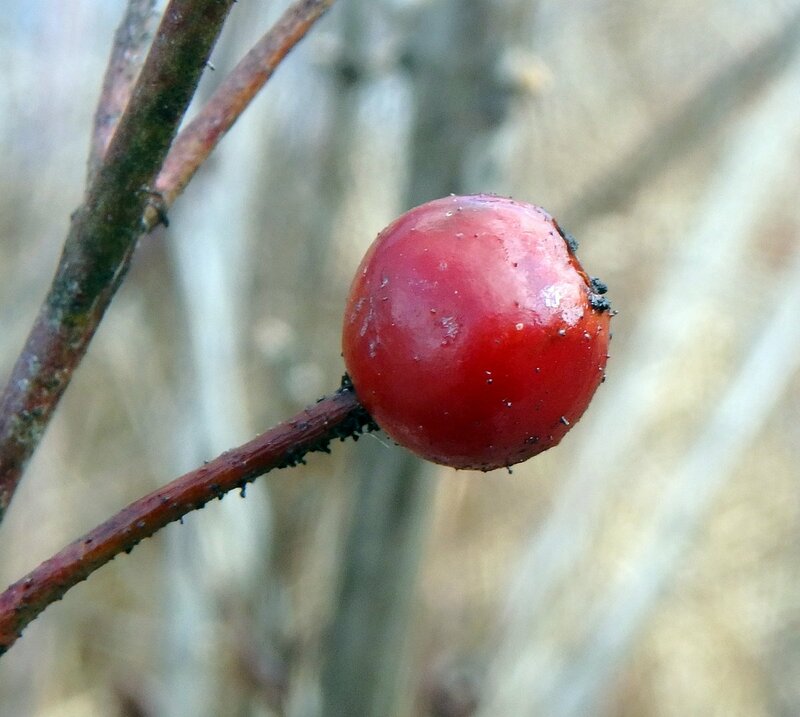 I wondered why the birds never seem to eat these native Alberta rose hips (Rosa acicularis) even though they’ve taken every hip off the invasive multi flora roses (Rosa multiflora.) 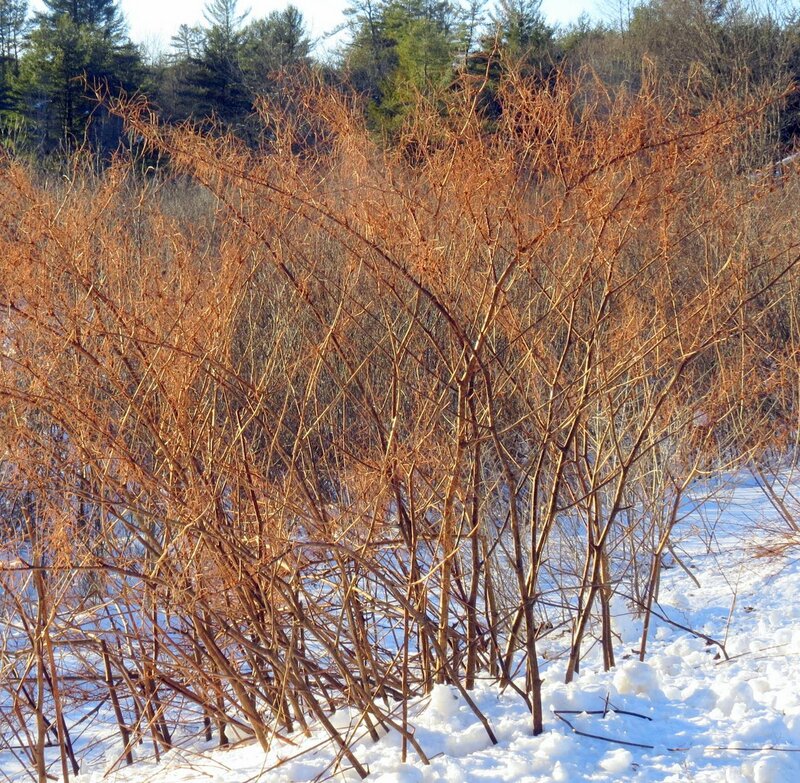 It could come down to size, since these rose hips are much larger than those of the multiflora rose. 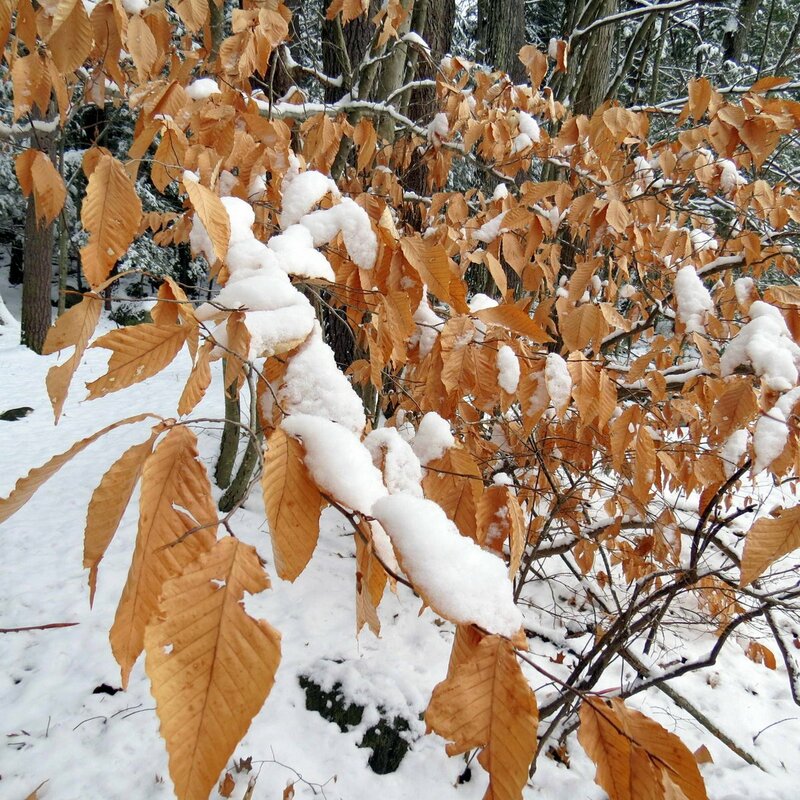 Snow covered every single thing, including these beech leaves. 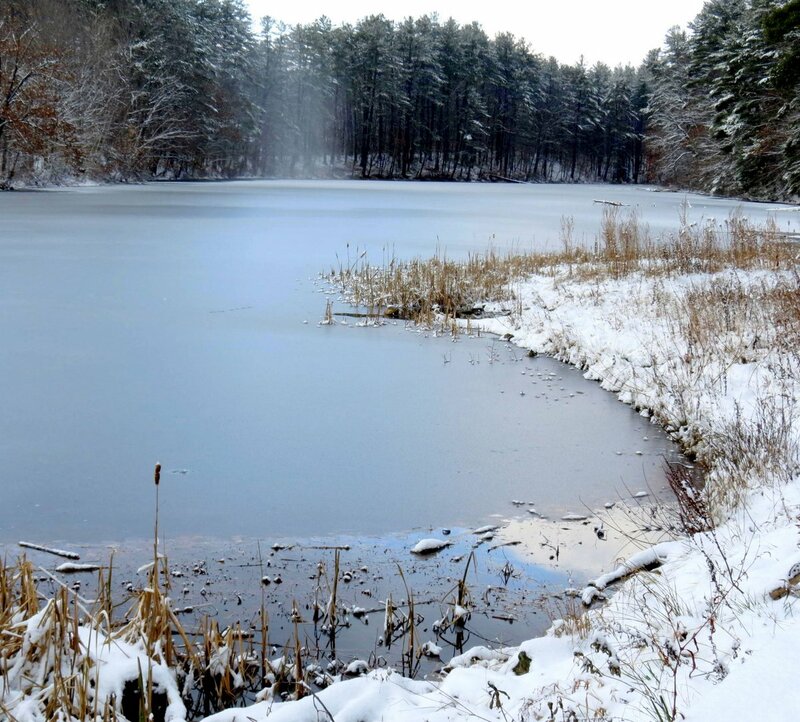 A small pond was slushing over, and I saw more snow smoke coming from the trees over on the left. 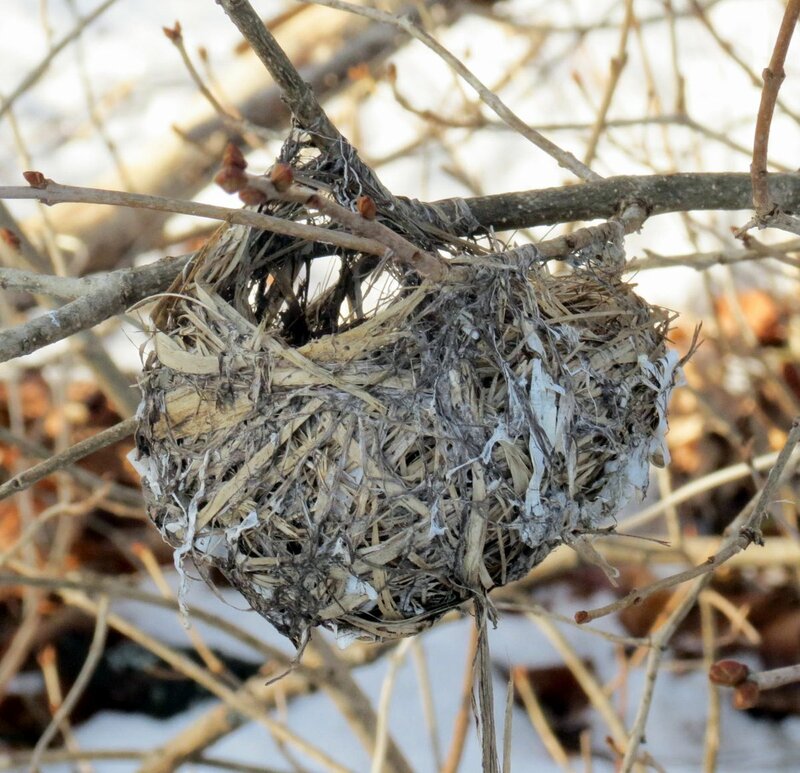 The red wing blackbirds will have plenty of nesting material in the spring. These birds are very defensive of their nesting sites and have no problem letting you know when you’re too close. They’ll fly right in your face and hover there. They also chase hawks and eagles, so they have no fear. 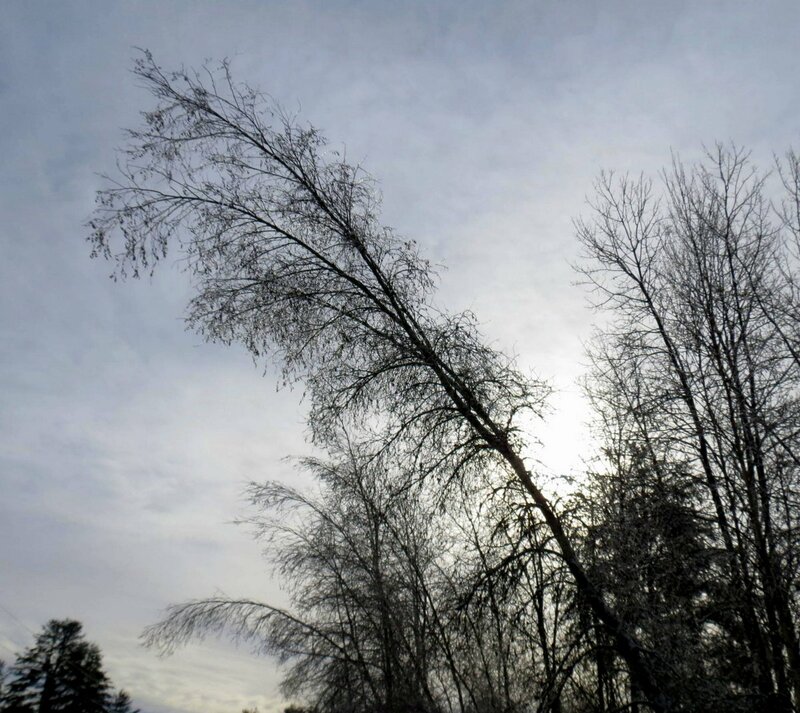 The trees told me which way the wind had blown during the storm. 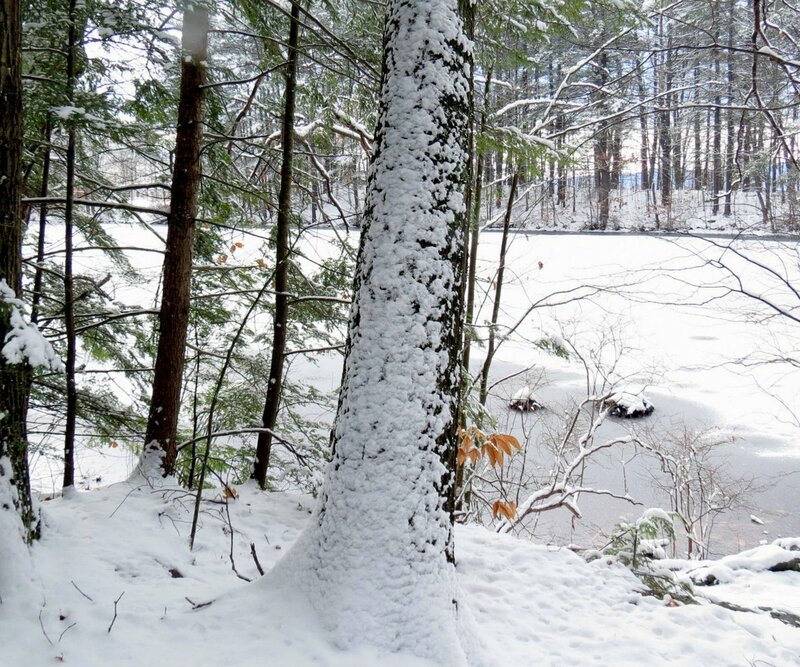 The trail around the pond was very snowy but it wasn’t too deep to manage. 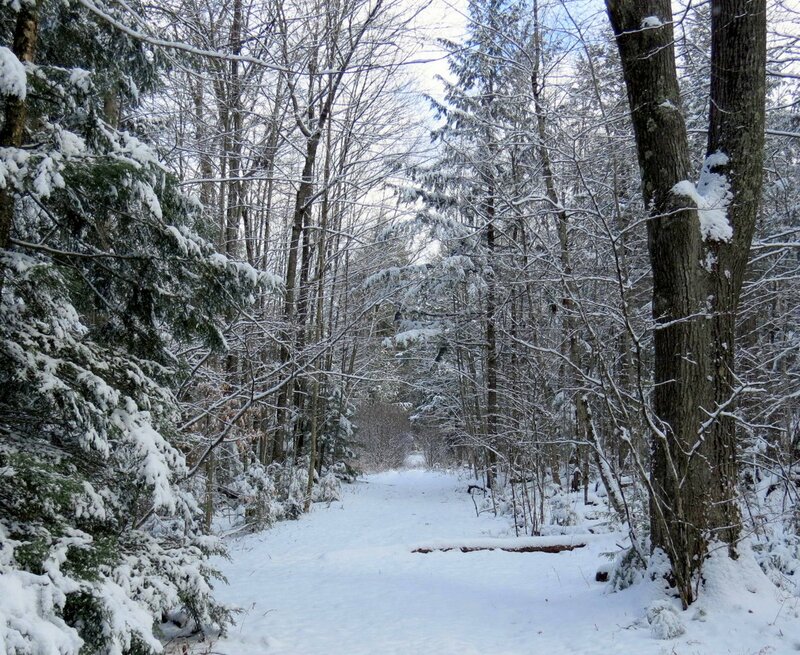 When it is deep I let snowshoers and cross country skiers break the trail and then I follow. 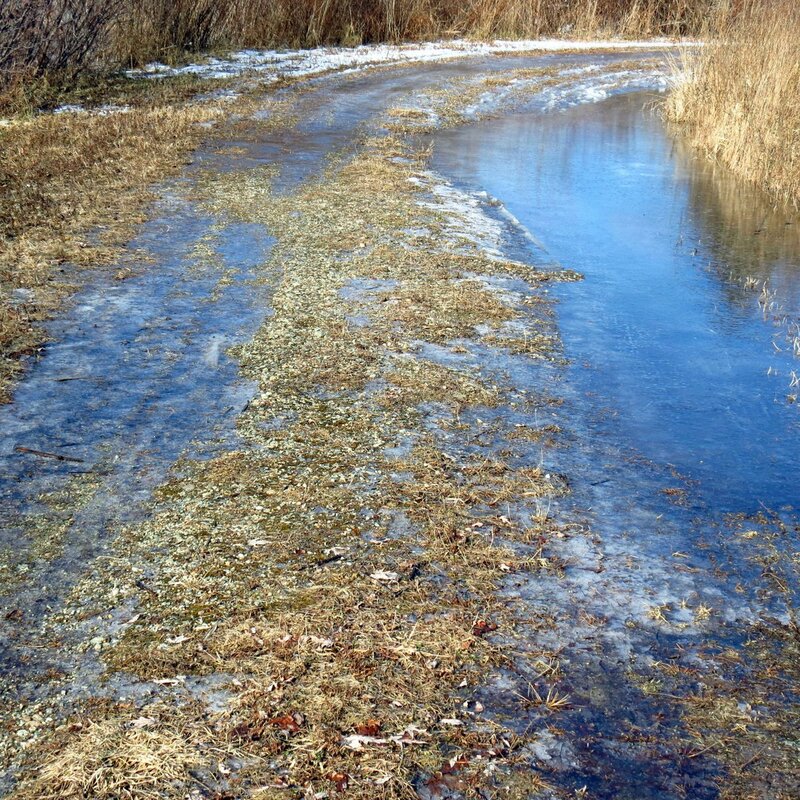 If I’m lucky a snowmobile will have gone through first, but they aren’t allowed on this trail. 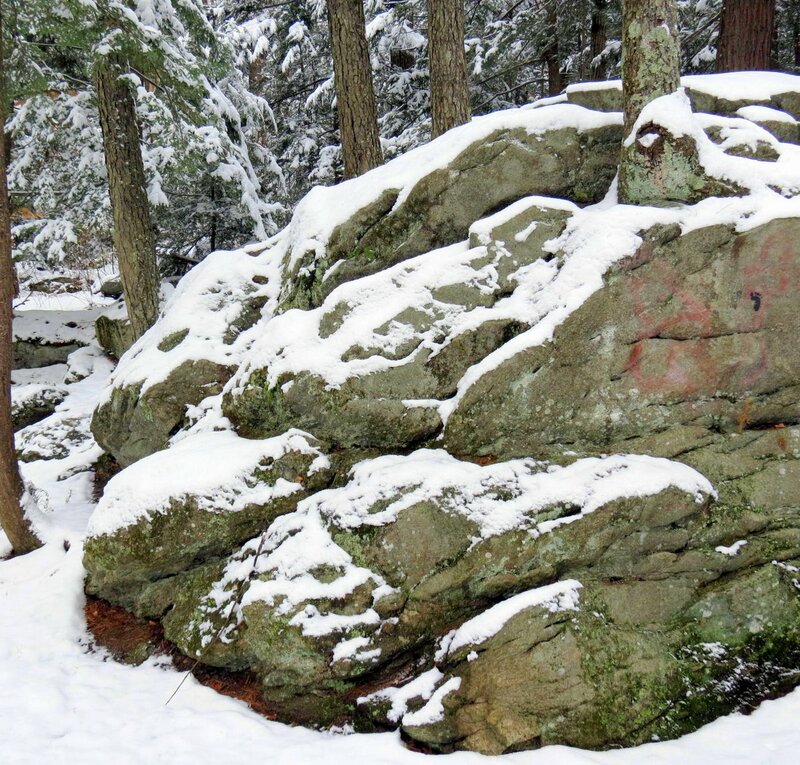 Sometimes without warning you can be sent off into a dream by nature and that’s what happened on this day when I saw this stone surrounded by the pristine white snow. I’ve walked this trail hundreds of times and I’d be willing to bet that I’ve tripped over this stone and have probably even cursed it, but on this day it sang to me and I loved it enough to take over 30 photos of it from different angles. It was so dark and perfect surrounded by such whiteness, and I’ve purposely over exposed this photo so you can see what I saw. It looked as ancient as the earth itself, and was beautiful. There was fun to be had and people of all ages were having it. 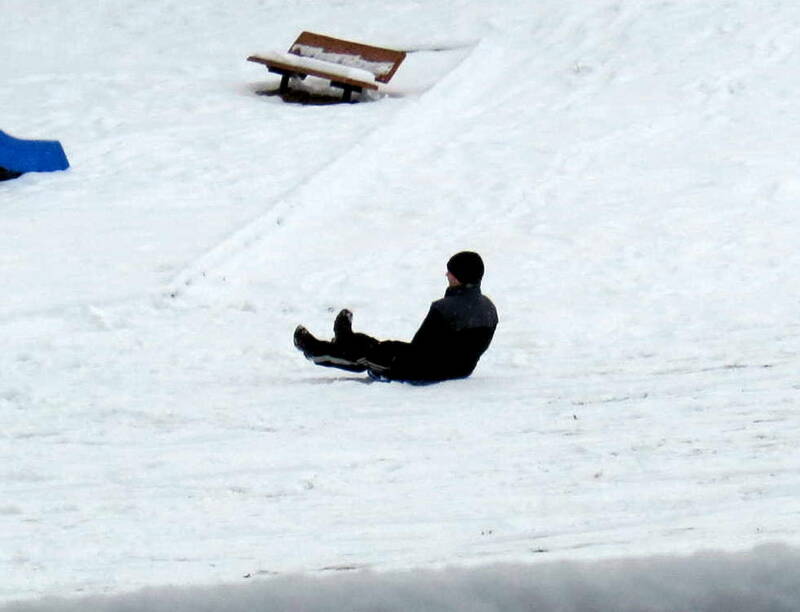 There was a lot of sledding going on, some on snow shovels. 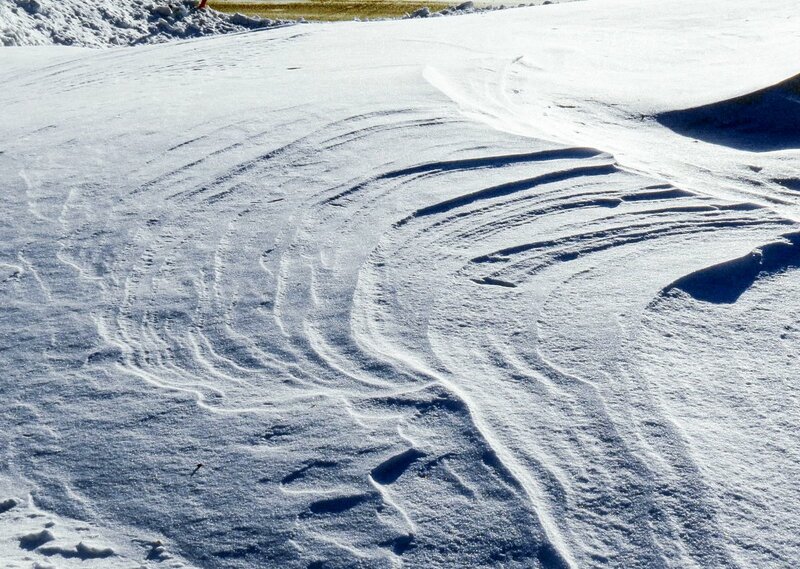 I walk by this exposed bit of bedrock quite often but only in winter do I notice all its folds and wrinkles. For the geology nerds among you, the bedrock in this area consists of medium-grained light to dark-gray granodiorite and quartz diorite. 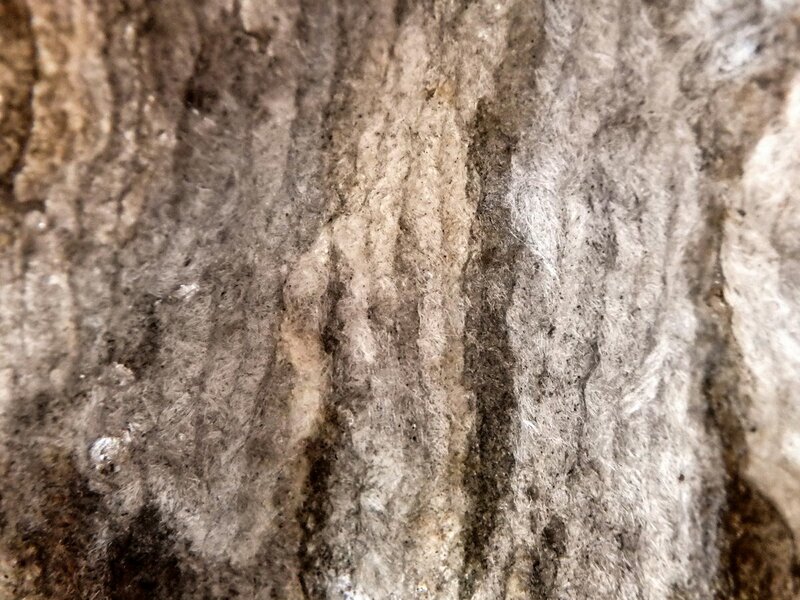 (Basically granite) This is composed of oligoclase-andesine, quartz, biotite, muscovite and potash feldspar. 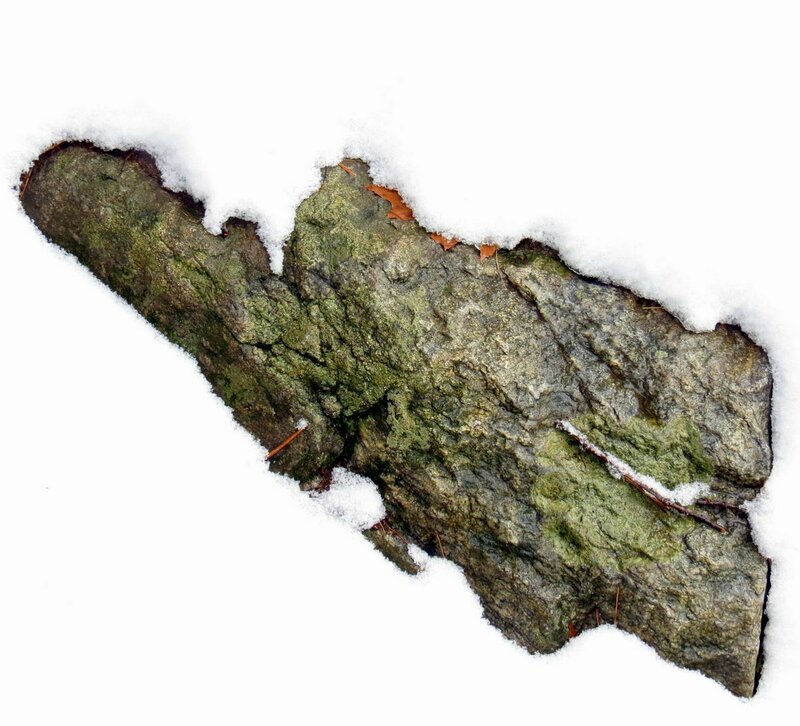 The bedrock is fractured and has areas that have been split by the shearing motion of moving rock. This information comes from a natural resources inventory completed in 2009 by our local university. 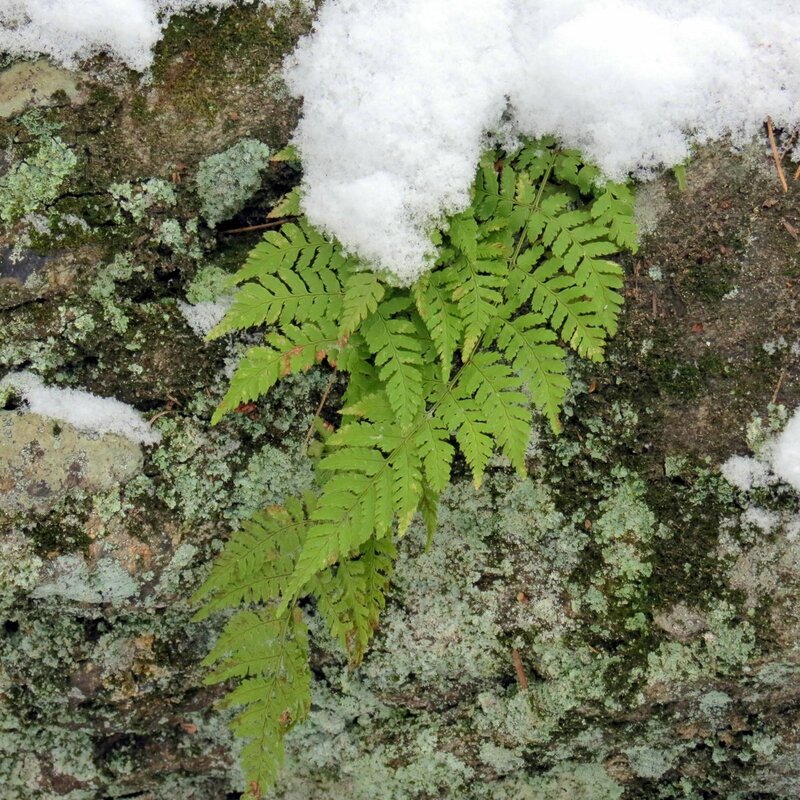 A couple of our evergreen wood ferns grow out of cracks in the bedrock but they must be starved for nutrients because I’ve known them for years and they never get any bigger. But they are always green and any green thing is welcome in winter. 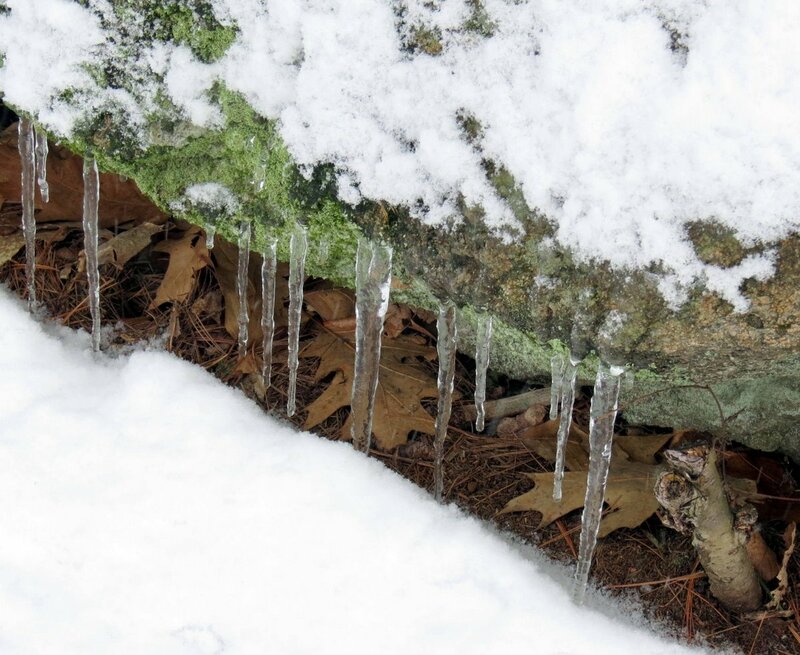 Icicles hanging from the stone outcrop told the story of the cold the evergreen ferns were experiencing. Brooding. That’s what this scene says to me. 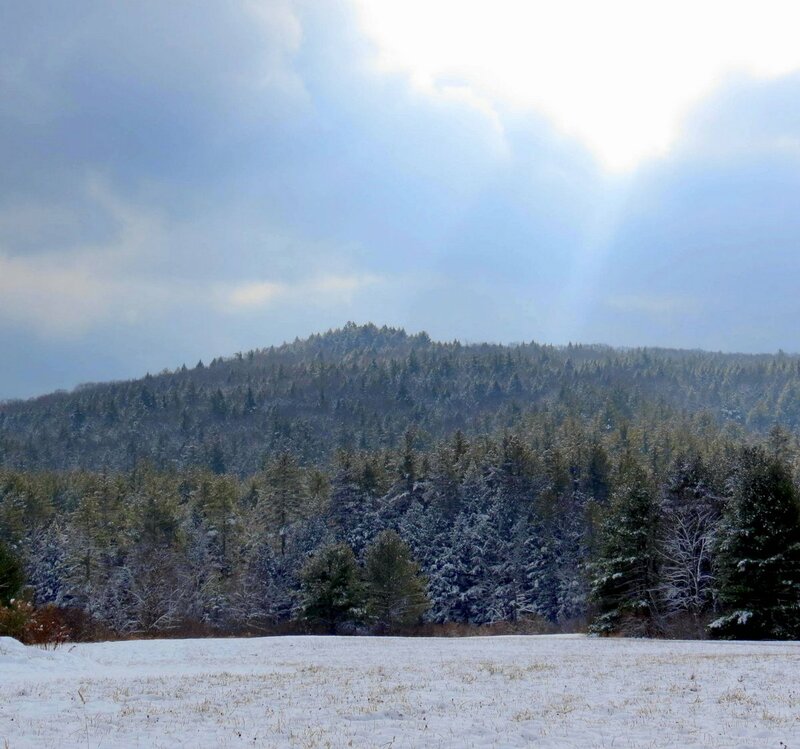 A brooding landscape means that it’s “darkly somber,” and that’s how it looked to me when the clouds began to fill in. Winter it seems, might be here to stay. 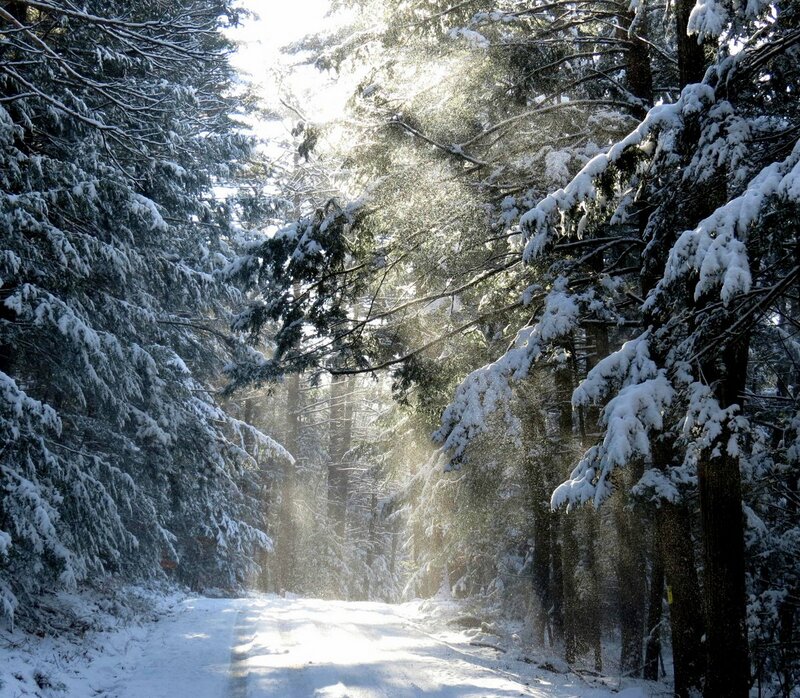 Snow or not this is where I’ll be, every chance I have. I hope you have something every bit as wonderful in your life.